Here are some Christmas colors for you. 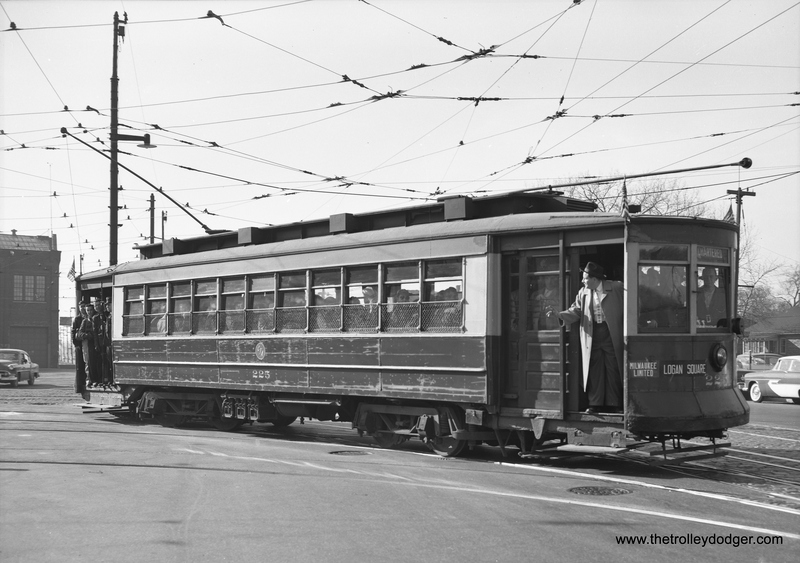 On January 23, 1954, CTA 1782 passes 1774 at the west end of the Lake Street line near Austin Boulevard. 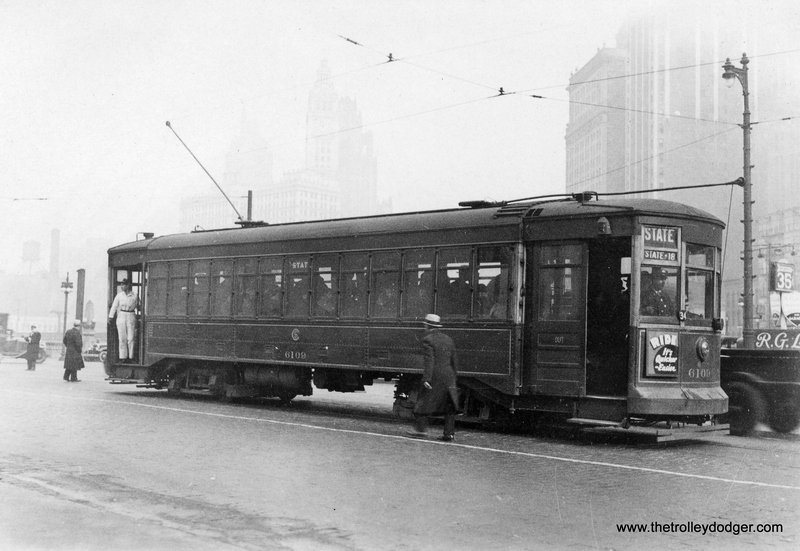 Since 1782 has already been repainted green, it most likely could not have been the car in the 1780 series that was oddly renumbered as “78” on the Madison-Fifth shuttle a short time later (see a picture on our previous post Chicago Streetcars in Black-and-White (January 23, 2015). 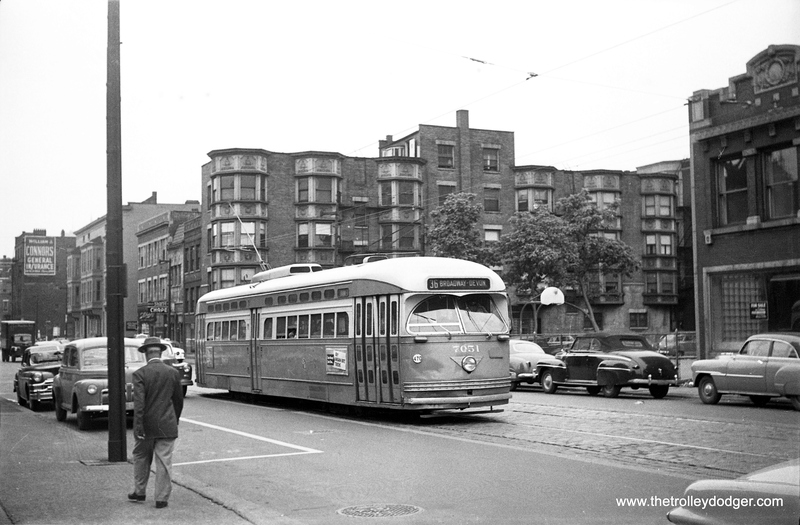 The Park Theater, by then already shuttered, was behind the two streetcars. I’m having difficulty identifying this car. But note it has a “continental” spare tire, implying it is not one of the cheaper models. The newest it could be is a 1954. 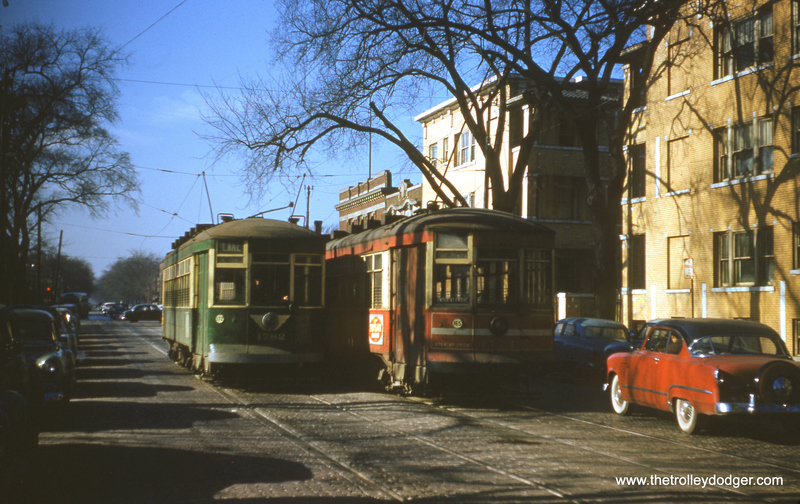 The 1955 models wouldn’t have been on the market until some months after streetcars quit on Lake Street. So far, my best guess is this may be a 1953 Dodge Coronet. 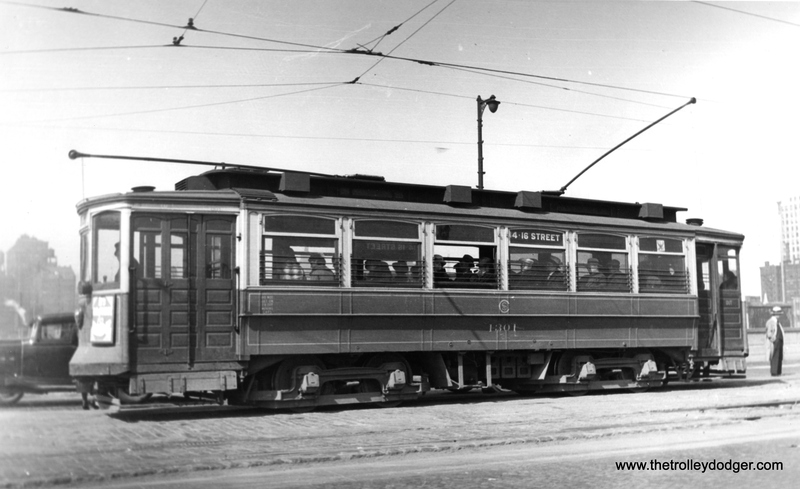 I believe that the CTA 1782 & 1774 photo shows a 1953 Dodge Coronet Diplomat 2-door hardtop. 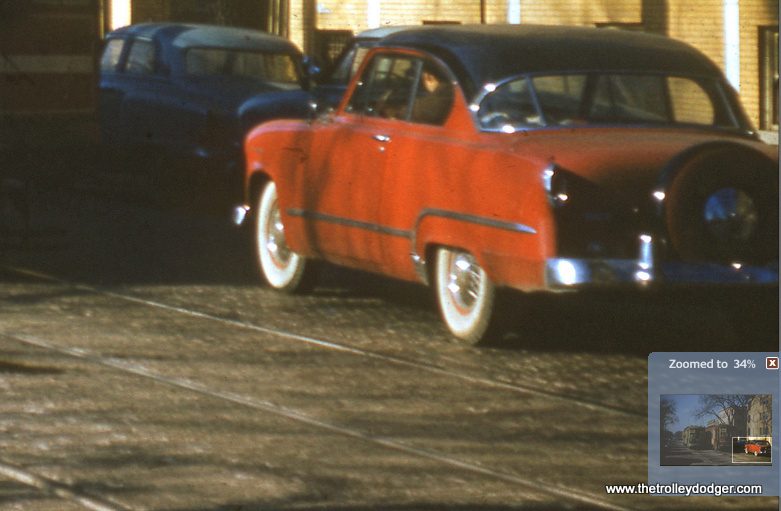 All 1952 Dodge models had separate, bolted-on rear fenders; the photo shows a straight fender sideline. 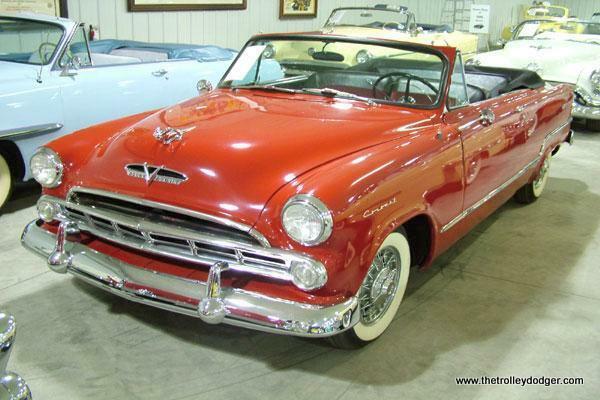 The 1953 Coronet series was the top trim line (Meadowbrook–Coronet; Wayfarer models were discontinued after 1952), and a Coronet 2-door hardtop would have a three-piece wraparound rear window and V-8 Hemi engine. 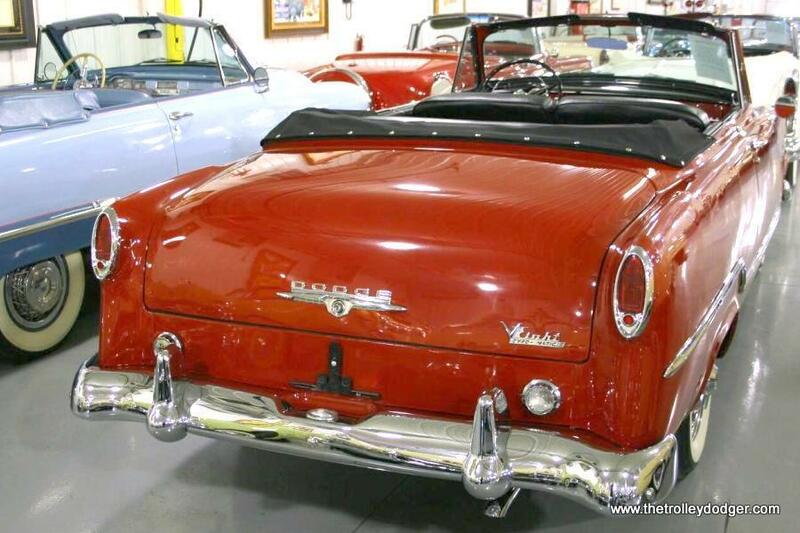 The 1954 Dodge Coronet (and new top-line Royal) models had the model name in script on the rear fenders, which doesn’t seem to be present in the photo. A Continental spare wheel kit and wire wheels (which appear to be present) were both offered as factory options in 1953. I took the above info from the Standard Catalog of American Cars, 1946-1974, John Gunnel, ed. There are lots of great photos under the Trolley Dodger tree this year. 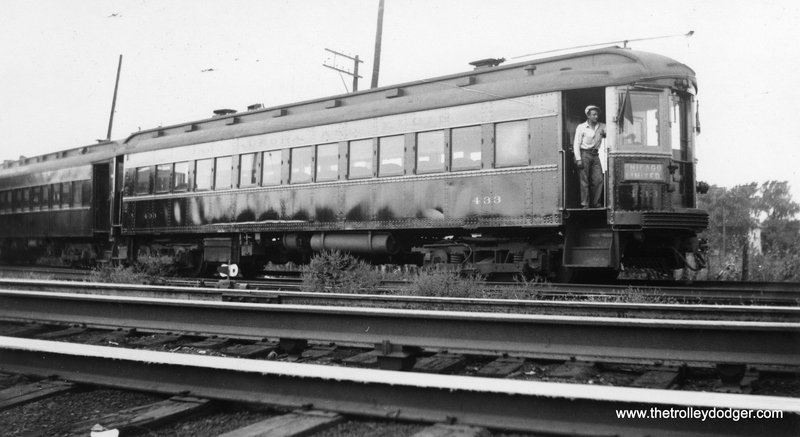 Besides the color shots, we have many rare, classic black-and-whites, which came out of one railfan’s scrapbook and were taken in the early-to-mid 1930s. Many of these were taken by one Earl W. McLaughlin of Chicago. There was a man by the same name who worked for the CTA in 1958 (and did some reporting for the Transit News, their employee publication), but I am not yet sure if they are one and the same. Some railfans like to ride, and others prefer to take pictures. Edward Frank, Jr., whose work we have featured on many occasions, was in the latter category– he rode his bicycle everywhere instead of taking the streetcar, in order to save up money for film. Given the number of shots Mr. McLaughlin took at ends of various lines, I’d say he liked to ride as well as photograph. PS- So far, I have determined that Earl W. McLaughlin was born in 1915 and died in 1969. For much of his life, he lived on the north side of Chicago, and died in Des Plaines. In 1940, his profession was grading furs. 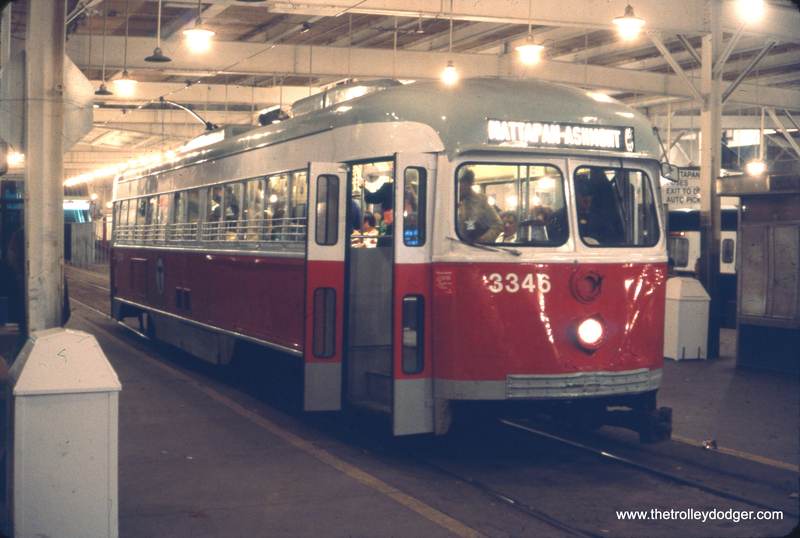 Here, we see MBTA (Boston) double-end PCC 3346 at the Ashmont end of the Ashmont-Mattapan line in November 1977. This picture has special significance to me, as I rode these cars for the first and only time just three months earlier. They were nearing the end of their service lives, however, and by the time I revisited, had been replaced by single-ended PCCs. Over time, the terminals at both ends of this feeder line have been changed, and I don’t believe the cars run here any longer. 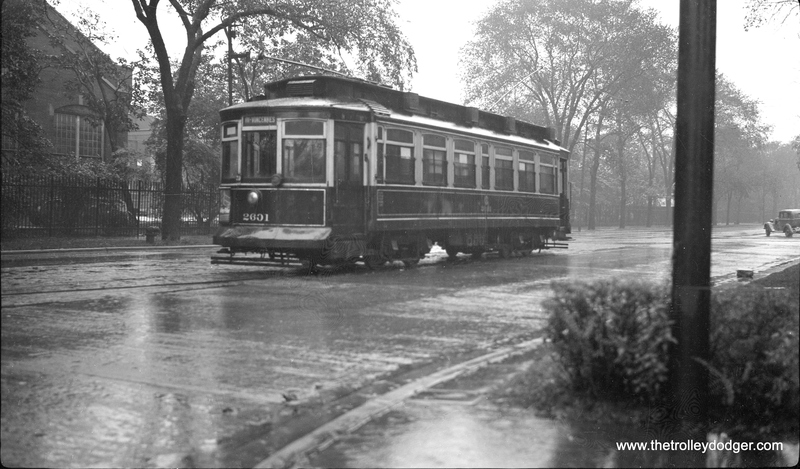 I recall there was a sign somewhere in the vicinity, probably from the 1920s, calling this the “High Speed Trolley.” I hope someone managed to save that sign. Here is an enlargement of part of the 1952 CTA Surface System track map. It does show a track connection between Wentworth and State. Possibly some of these connections were kept for bypass use in case of flooded viaducts, such as the one that resulted in the infamous 1950 crash between a PCC car and a gasoline truck. 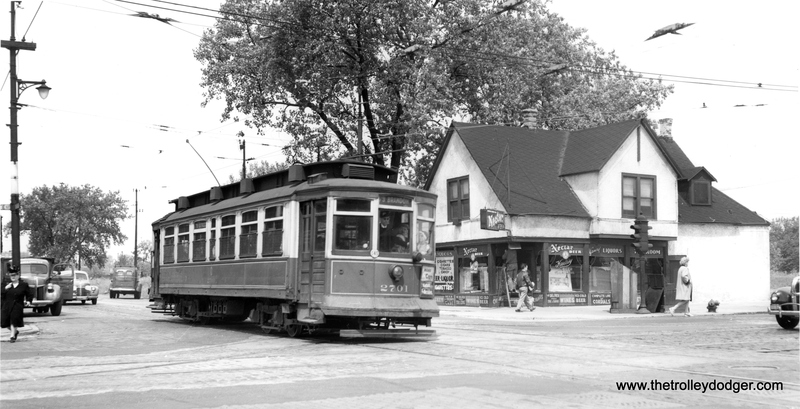 M. E. writes: “The enlarged map you added of the 59th-Wentworth trackage made me think about how the 4 Cottage Grove cars got to the 69th and Ashland barn. Try this: Cottage Grove to 61st, west to State, north to 59th, west to Wentworth, south to 63rd, west to Ashland, south to 69th. You suggested that all this trackage was kept open (at least as late as 1952) to bypass flooded viaducts such as the one on State south of 63rd. This theory would also apply to the viaducts on the 63rd St. line. Much of that line between Wentworth and State consisted of viaducts for four passenger railroads (New York Central + Nickel Plate; Pennsylvania; and Rock Island), as well as Englewood Union Station. 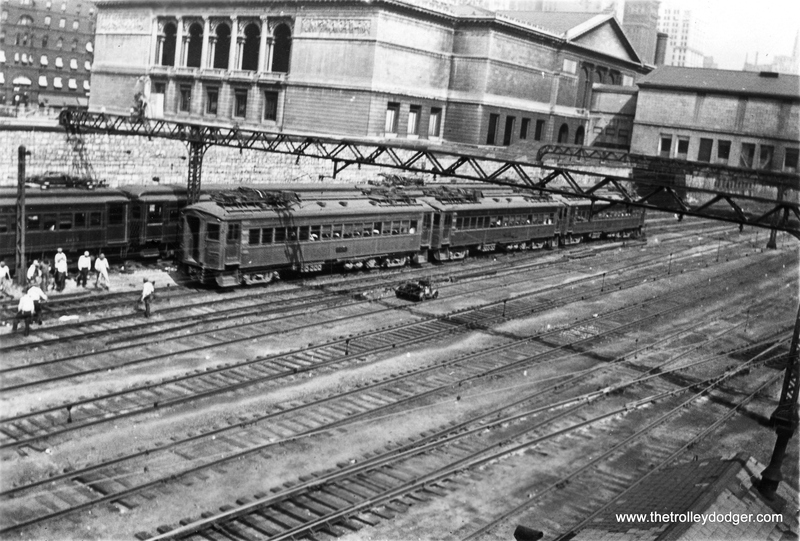 In fact, between the station and State St. there was a big yard for New York Central freight, which accounted for the majority of the viaduct over 63rd St. So, if the 63rd St. viaducts were to flood, the 63rd St. cars (let’s say heading east) would turn north on Wentworth to 59th, east to State, south to 63rd, then east on 63rd. 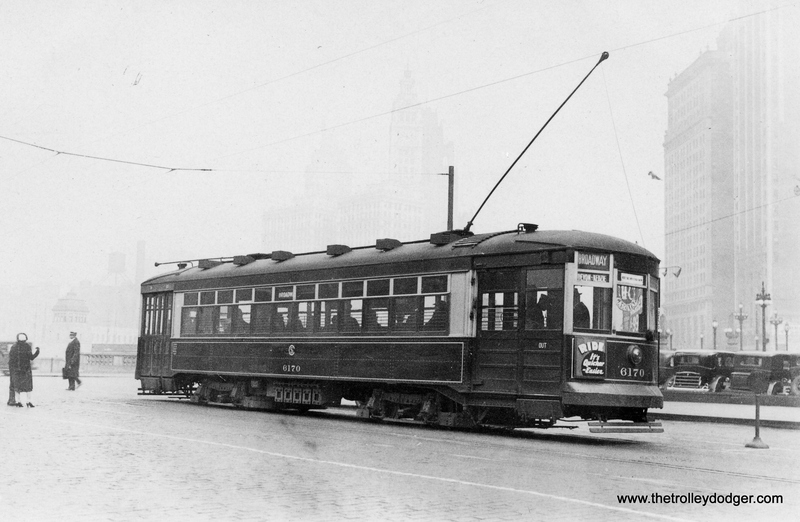 On a foggy day in December 1932, we see CSL “maximum traction” car 6109 southbound at State and Wacker. 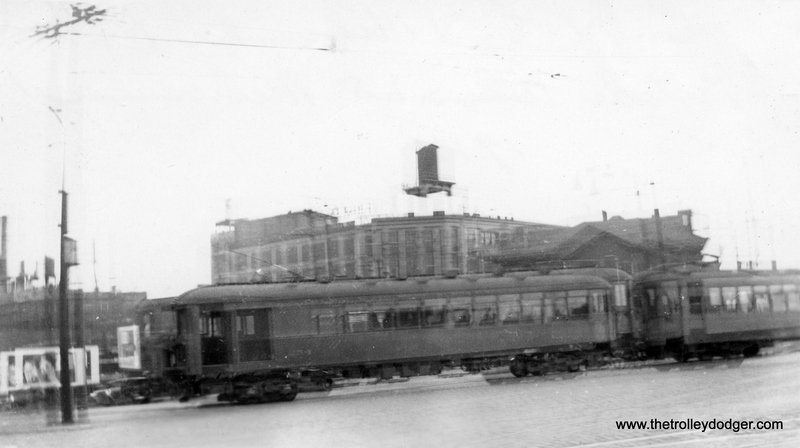 This photo of CSL 6170 heading northbound, was taken at State and Wacker, probably also in December 1932. 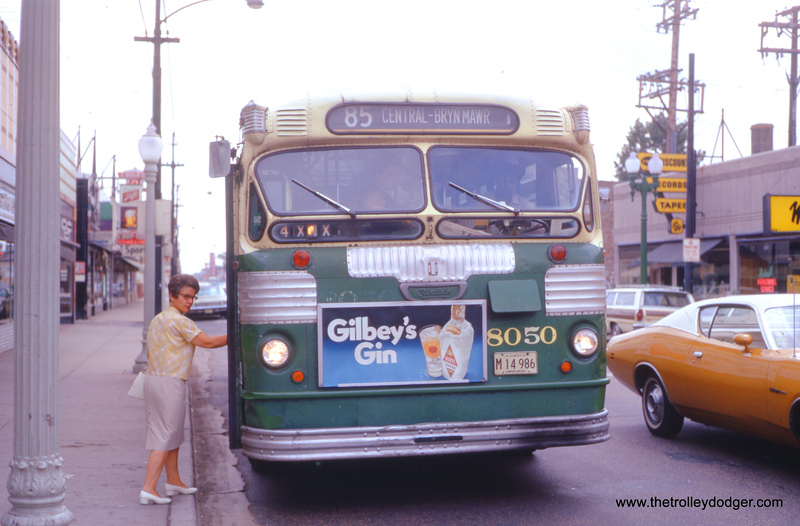 This picture of CSL 335 may have been taken on route 65 – Grand. If so, it is heading east. CSL 1333, built in 1908. Clark and Granville today. The building that once had a photo studio is still there. Ashland and Irving Park today. Irving Park and Broadway today. 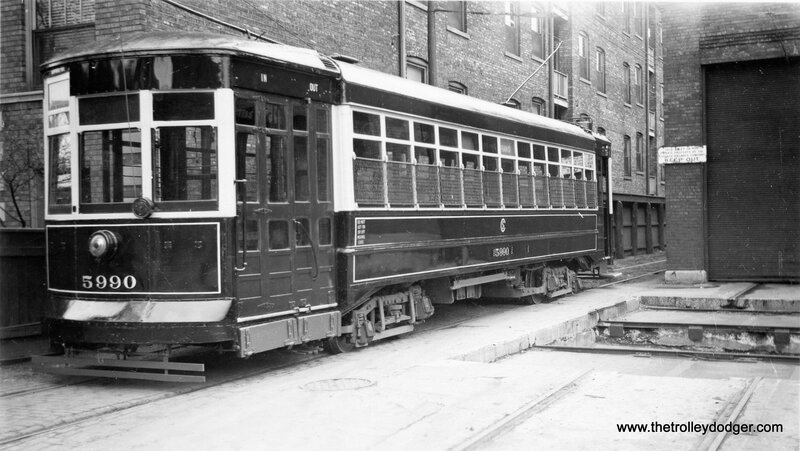 Don’s Rail Photos says Chicago & West Towns car 106 “was built by McGuire-Cummings in 1915. 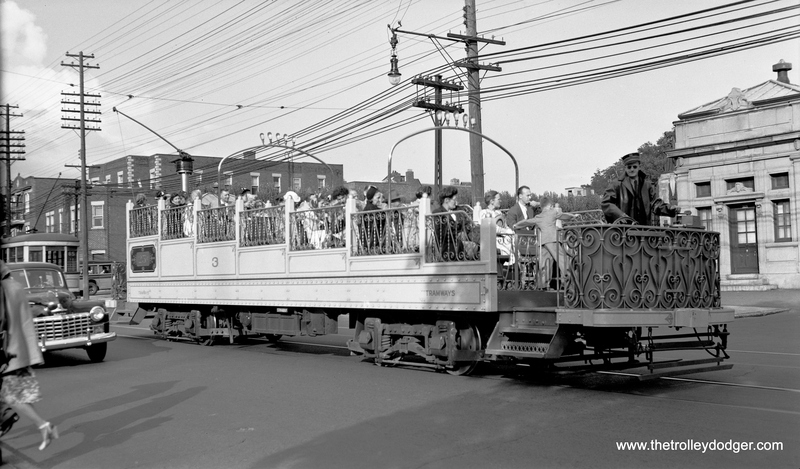 It was dismantled in 1943.” Here, we see it heading north on Harlem and Stanley in 1936, having just crossed the Burlington RR. Harlem and Stanley in Berwyn today. 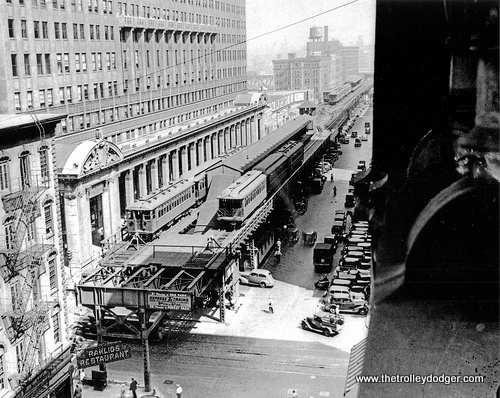 The Harlem stop on the Burlington has been updated, but is still in the same location as the 1936 picture. This is not a very good picture, technically (it appears to be a double exposure) but it does show the North Shore Line in Milwaukee in 1934. 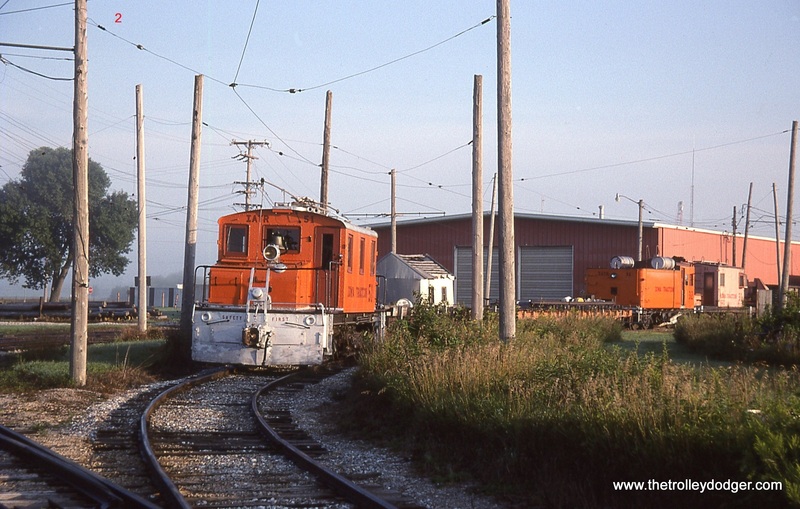 South Shore Line cars 33, 24 and ? 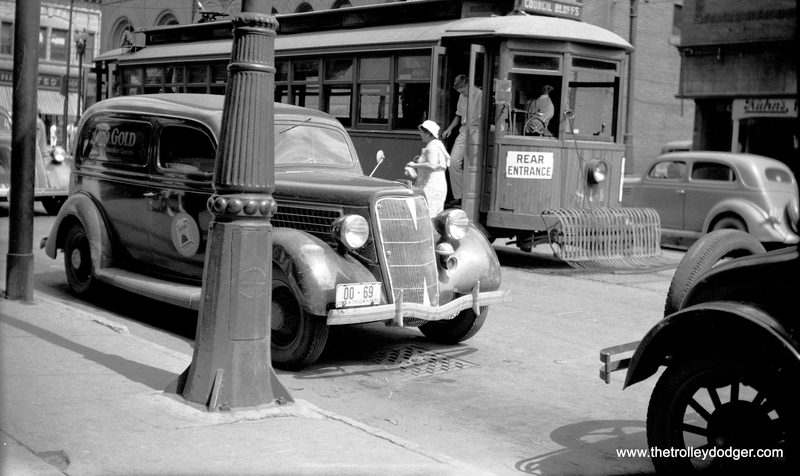 near Chicago’s Art Institute on August 17, 1931. Here is a rare picture. 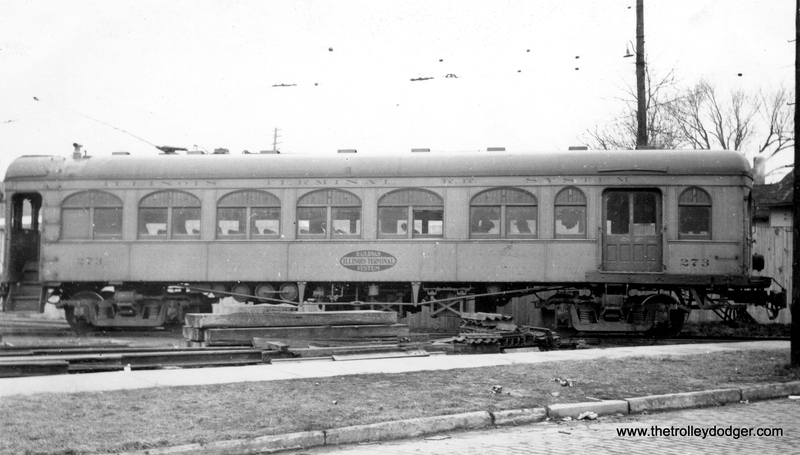 Don’s Rail Photos notes, “222 was built by Kuhlman in 1908 for the CLS&SB and was numbered between 101 and 110. 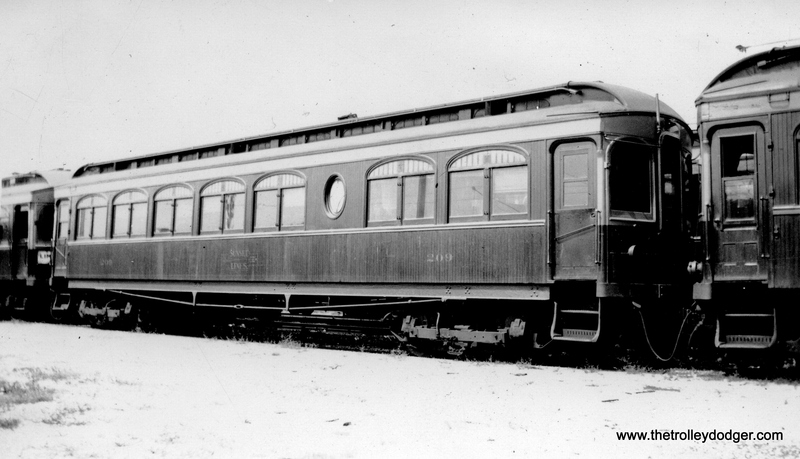 It was rebuilt in 1927 to a deluxe coach and numbered 222. Shortly afterwards, when the 200s arrived, it was used by the Way & Structures Dept. 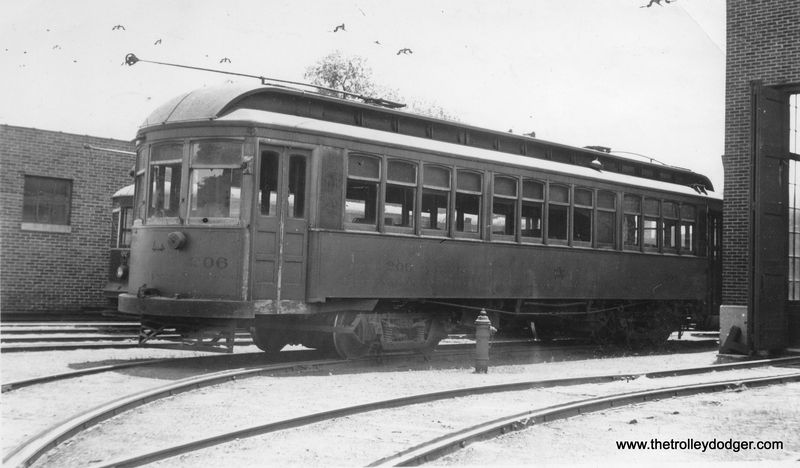 Later it was used as a newspaper car, and it was scrapped in 1941.” It is identified in this picture as a maintenance of way car. 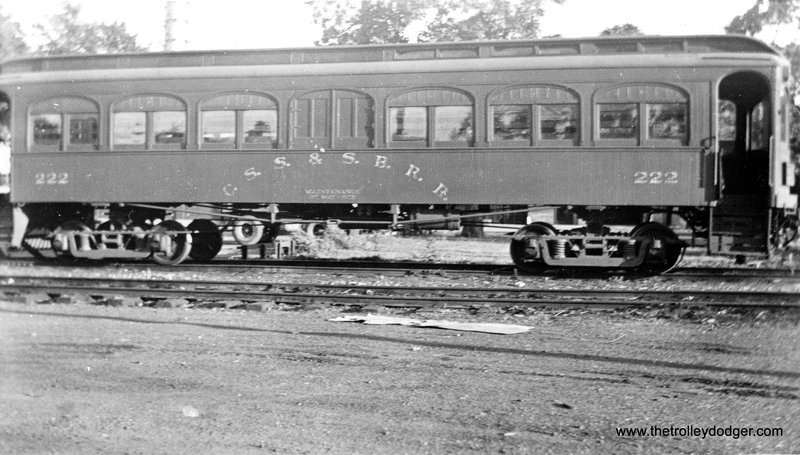 Here is another rare photo of CSS&SB wooden combine car 1126. 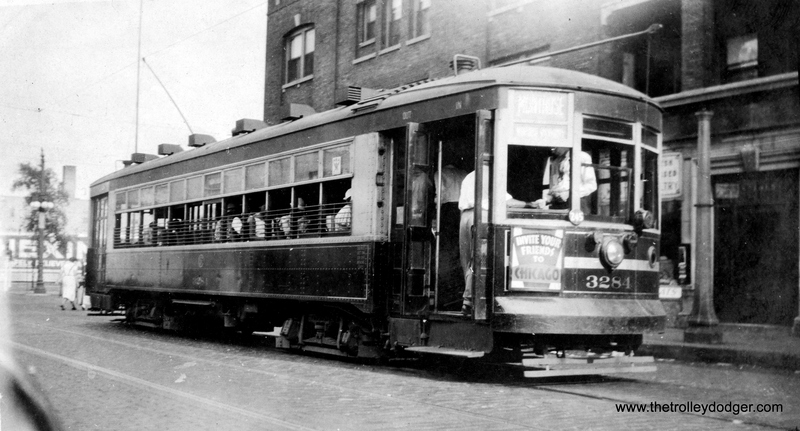 Caption: “Chicago, Aurora & Elgin 433, geared for 95 miles an hour.” 433 was built by Cincinnati Car Co. in 1927. There is some debate as to just how fast CA&E cars ran. The general consensus is they could do at least 60 mph but that close proximity to nearby buildings might have inflated the “illusion of speed” relative to, say, the North Shore Line, which was in more open areas. I picked up this interesting shot of CSL 5990 at a swap meet. I was intrigued by the transfer table pit and the apartment buildings alongside; it’s obviously at one of the carbarns / shops, any idea of which one? Mystery solved, the photo was taken at West Shops. That’s incredible detective work… how did you figure it out? Just looking at the B&W photo one day and got the idea that I’d seen the location in another one of my photos, and upon checking, sure enough that was it. 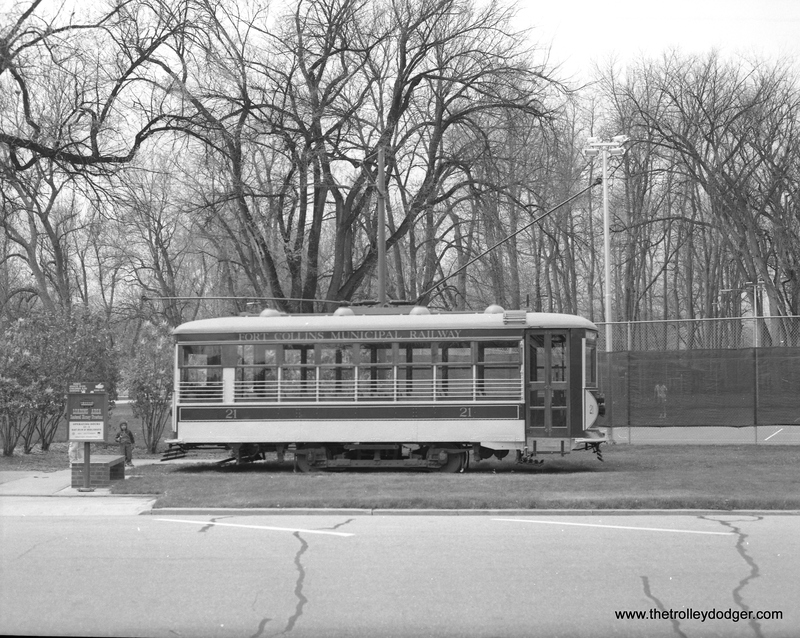 Always enjoy the Trolley Dodger site, keep up the good work! 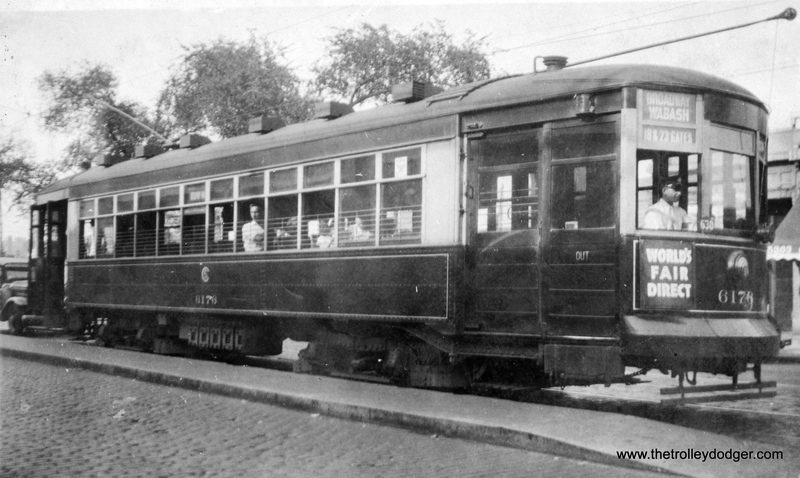 The book’s cover shows the Hagerstown & Frederick, a Maryland interurban. 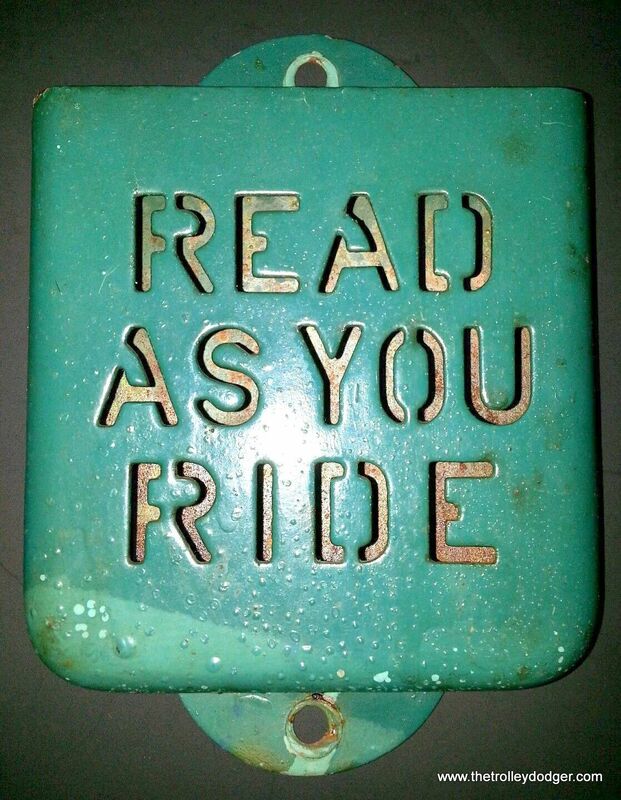 Ironically, considering the title, it had very few riders. 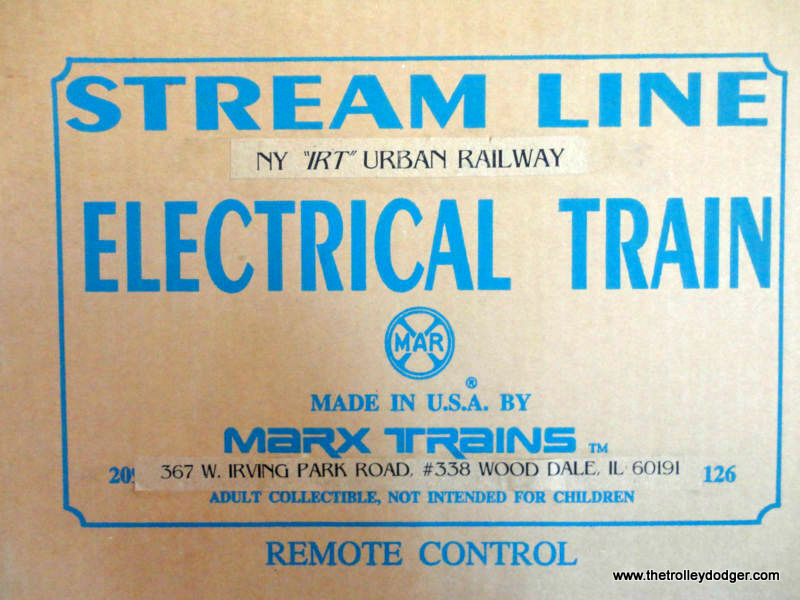 One of the most intriguing yet neglected pieces of American transportation history, electric interurban railroads were designed to assist shoppers, salesmen, farmers, commuters, and pleasure-seekers alike with short distance travel. 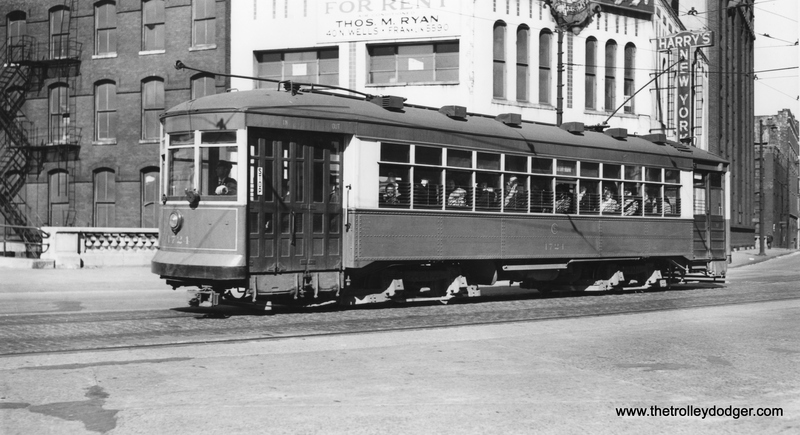 At a time when most roads were unpaved and horse and buggy travel were costly and difficult, these streetcar-like electric cars were essential to economic growth. But why did interurban fever strike so suddenly and extensively in the Midwest and other areas? Why did thousands of people withdraw their savings to get onto what they believed to be a “gravy train?” How did officials of competing steam railroads respond to these challenges to their operations? H. Roger Grant explores the rise and fall of this fleeting form of transportation that started in the early 1900s and was defunct just 30 years later. Perfect for railfans, Electric Interurbans and the American People is a comprehensive contribution for those who love the flanged wheel. 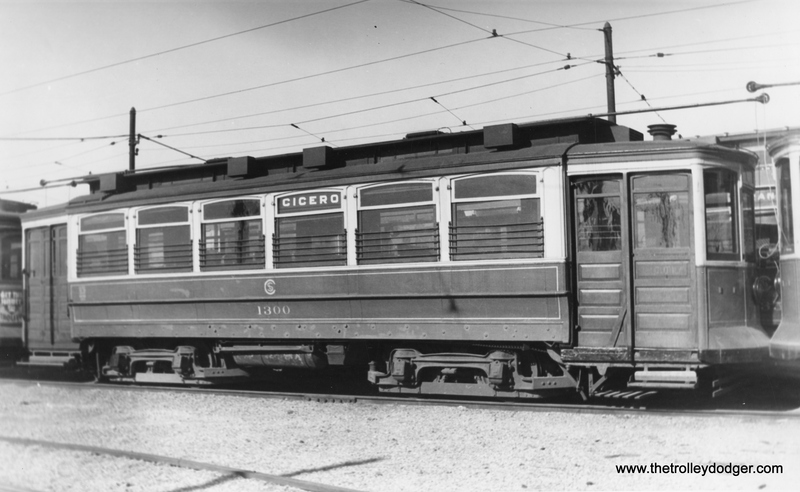 At its core, the word “interurban” means between cities. 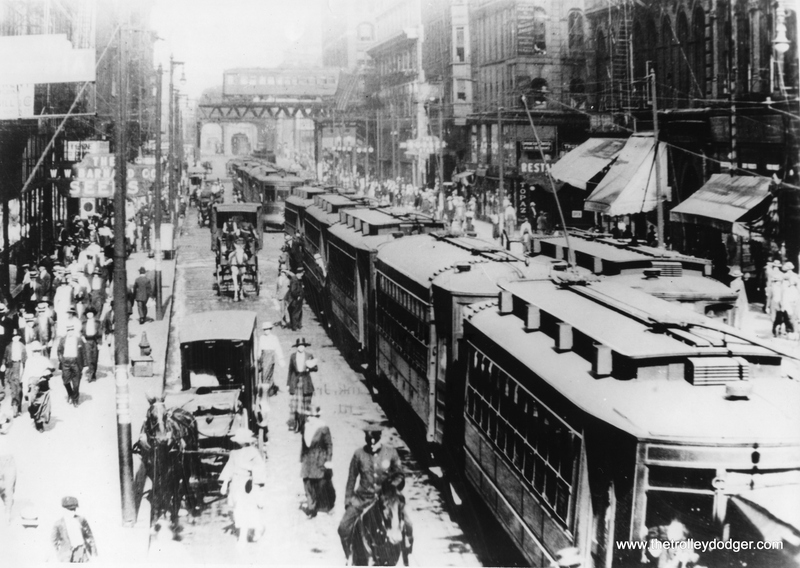 The definition of an interurban railway has always been a bit difficult to pin down. Some say it should not include suburbs, or lines that were shorter than 15 miles, or that originated with steam railroads. No matter what definition you might accept, however, you are likely to find exceptions to all of these rules that still seem “interurban-ish” in character. 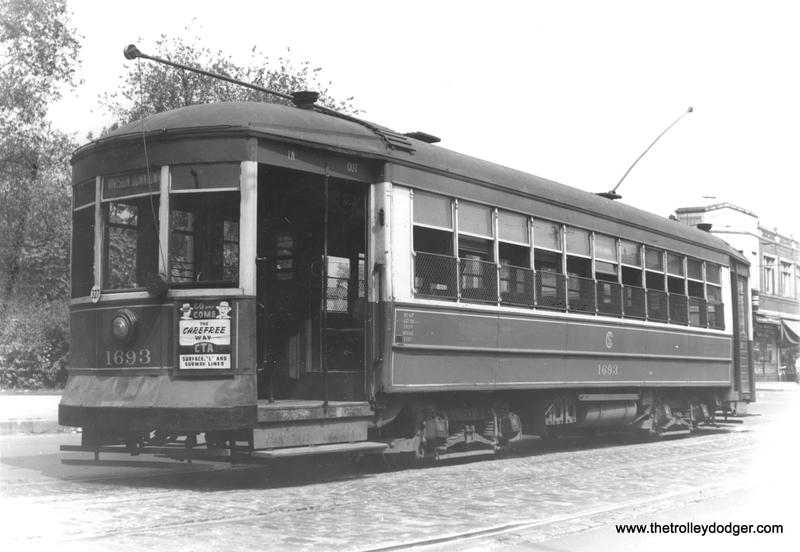 The Philadelphia & Western is not quite 15 miles long, and yet it was always considered an interurban. The Erie Lackawanna’s Gladstone Branch began life as a steam railroad, yet has always seemed like an interurban at heart. 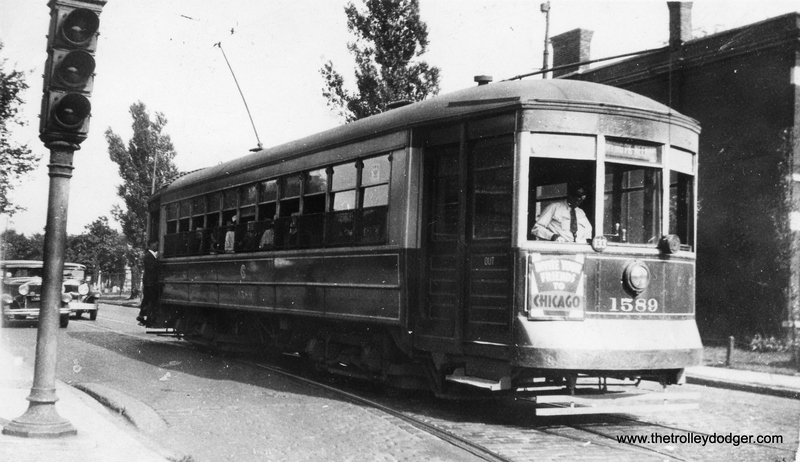 Everyone agrees that the Chicago, South Shore & South Bend (now operated by NICTD) is the last surviving major interurban in America. But I would bet that 90% or more of its riders think of it as a commuter rail line today. 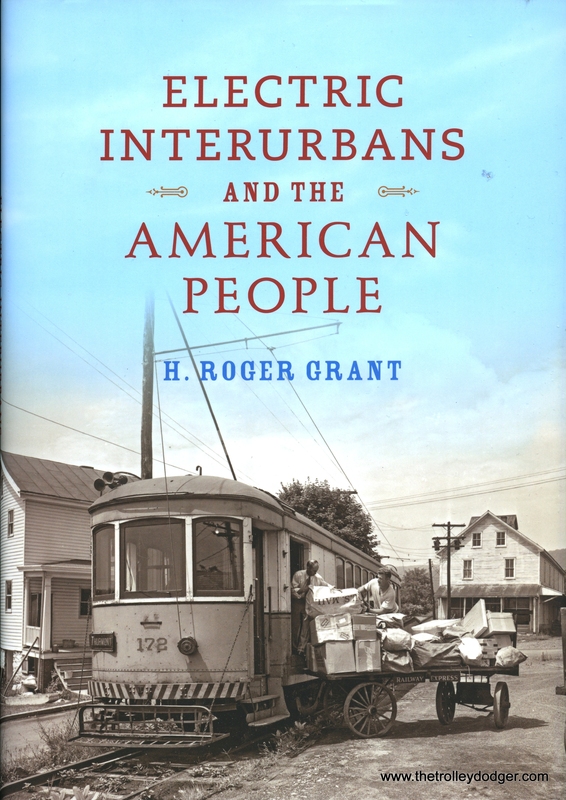 With all this in mind, I welcome the publication of Electric Interurbans and the American People by H. Roger Grant, simply because its focus is largely on people, and people have often been left out of many such previous books on this subject. 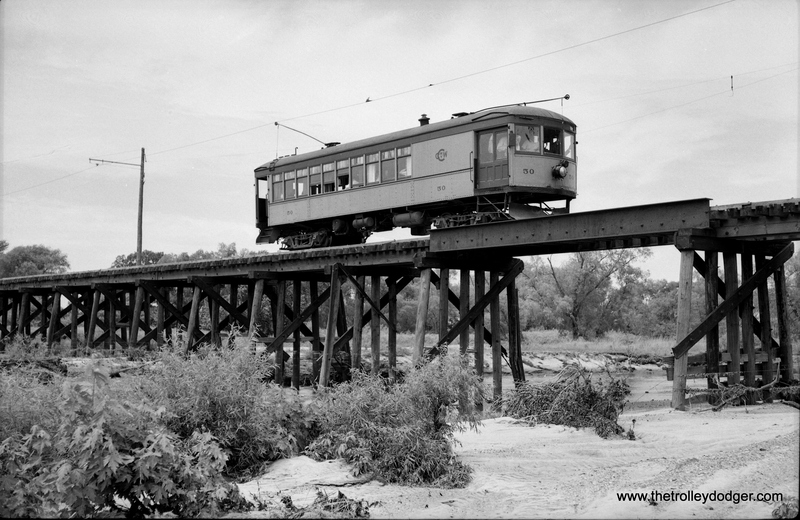 * Investing in an interurban railway was always a very risky and speculative venture. 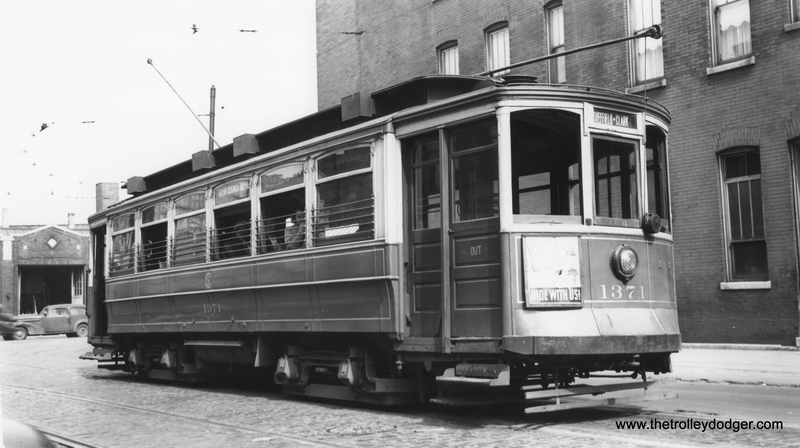 But for a time in the early 1900s, thousands of miles of such lines were built. 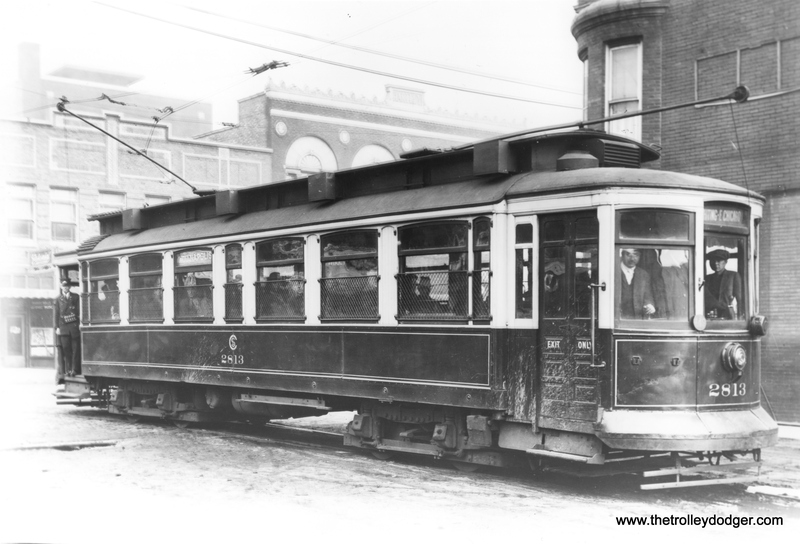 While Hilton and Due considered the interurban era to have been practically an accident of history, noting that had autos and paved roads been available just a few short years earlier, it might not have happened at all, its effects on America were beneficial and long-lasting. While interurban stockholders may have been caught short in the long run, the connections that these railroads made between cities and communities have been permanent and long-lasting. With the development of new rail lines, whether called rapid transit, light rail, or high-speed rail, interurbans have made a bit of a comeback in the US, and this seems likely to continue into the future. The best parts of this book are the ones that deal with various interurban abandonments. 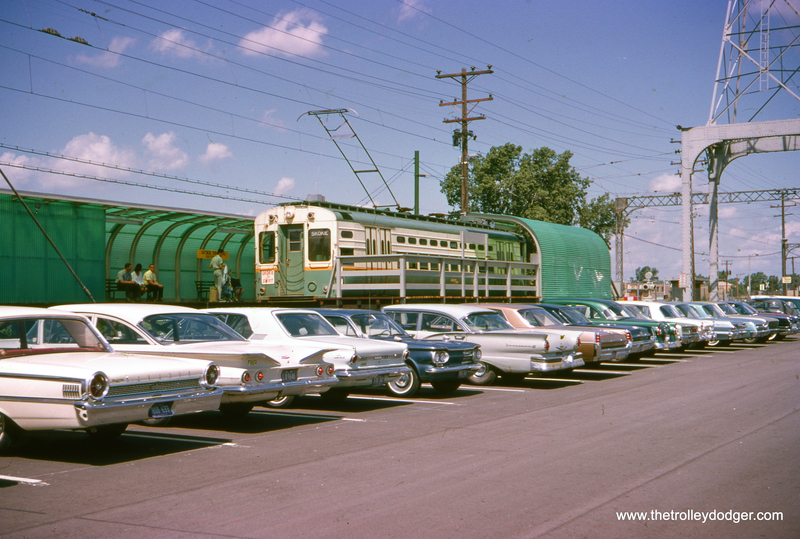 I am particularly fond of how the late Maurice Klebolt organized the last passenger trip on the Illinois Terminal interurbans in 1956. Entire towns along the way turned out to pay tribute, many dressed in period costume. We ran a picture of Mr. Klebolt in a recent post. At just 192 pages, this book, while a welcome addition, just scratches the surface in examining the sociological dimensions of the interurban era. I highly recommend this book to anyone with such an interest. We can only hope that this rich historical vein will continue to be mined by other authors in the future. *I can think of many books where the author seemed to think that people just get in the way of a good photo of an empty railcar. Louis Marx and Company was a major toymaker when I was growing up, but they went out of business in 1980. 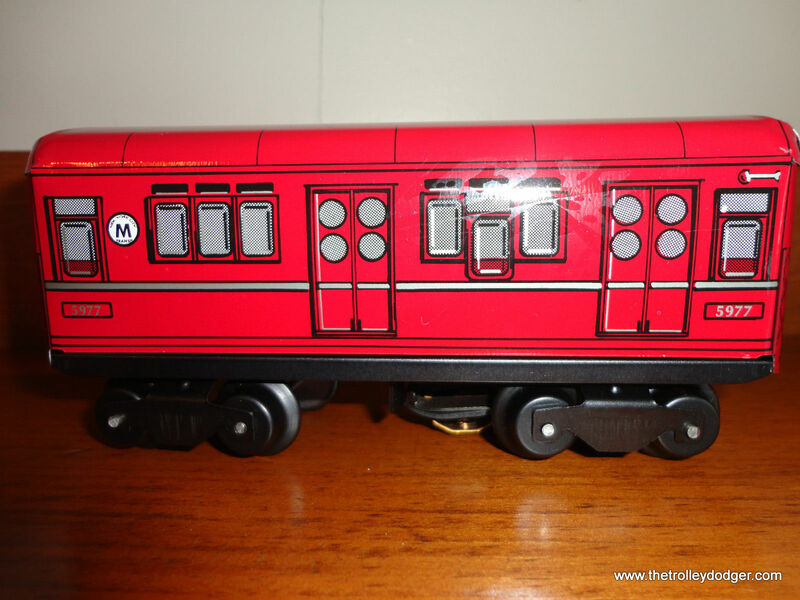 They made a number of metal train sets, and during the 1990s, another firm (Marx Trains) made some interesting O-scale tribute vehicles that I’ve just recently learned about. These trains aren’t easy to find now, and they don’t come cheap– expect to pay somewhere in the range of $500-750 a set. 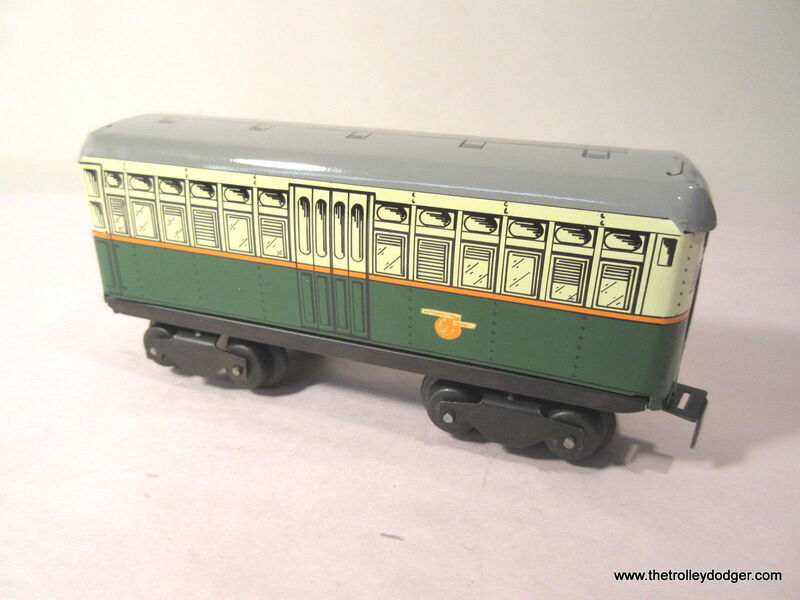 This is one car from a three-car CTA “4500s” powered train set that will actually operate on a layout and has sound effects and lights. This was obviously patterned after the 6000s but with only one set of “blinker” doors. 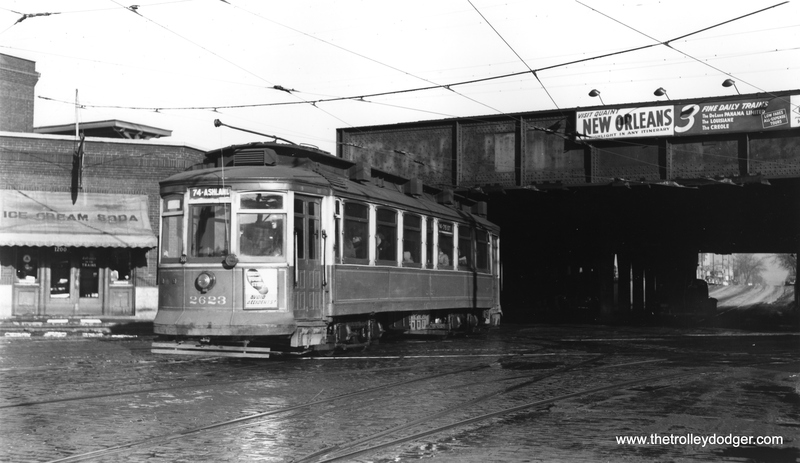 We are now working on a new paperback book Chicago Trolleys, that we expect will be published in 2017. Original research does cost money, so please consider making a donation to cover our costs. We will keep you updated as we progress, and thank you in advance for your help. This is our 171st post, and we are gradually creating a body of work and an online resource for the benefit of all railfans, everywhere. To date, we have received over 232,000 page views, for which we are very grateful. 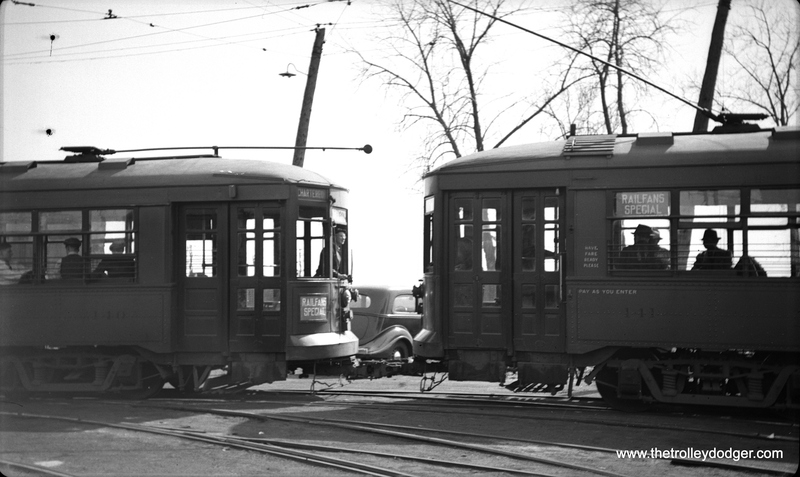 CTA pre-war PCCs 4016 and 4050 at Western and 79th, southern terminal of route 49. This picture was taken seconds after a similar one on page 363 of CERA Bulletin 146. That picture is dated May 1956 and is attributed to William C. Janssen. The CTA terminal at Western and 79th today. 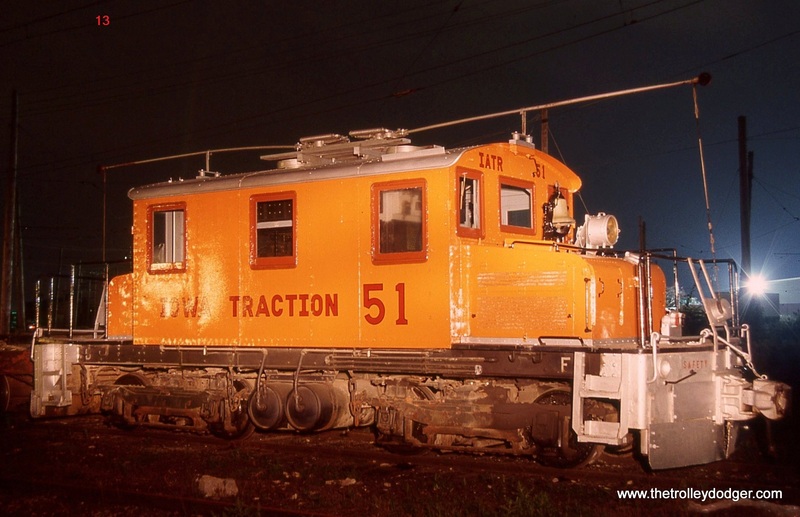 Here are more classic traction photos we recently acquired. 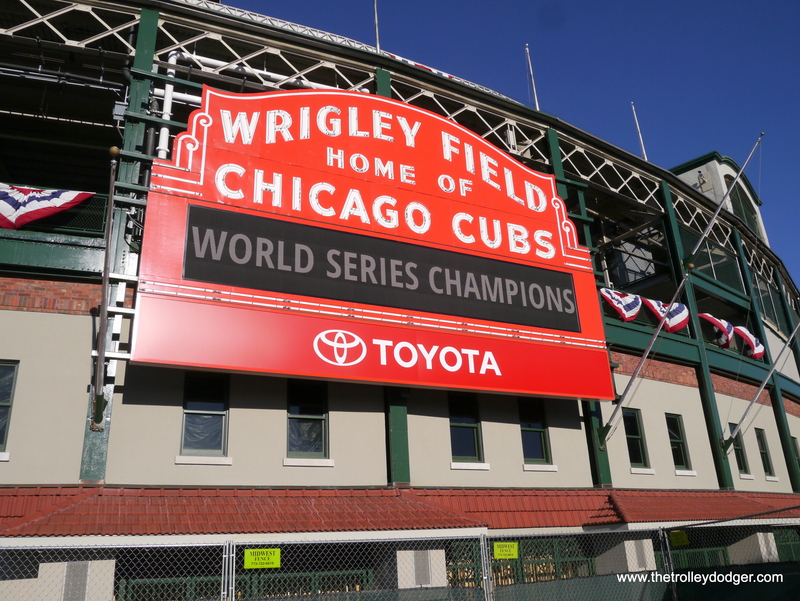 While many are from Chicago, our trip this time takes us all around the country, and even across our northern border. Don’t forget, if you click on each picture with your mouse, you can bring up a larger version in your browser, and zoom in on that one too for closer inspection. 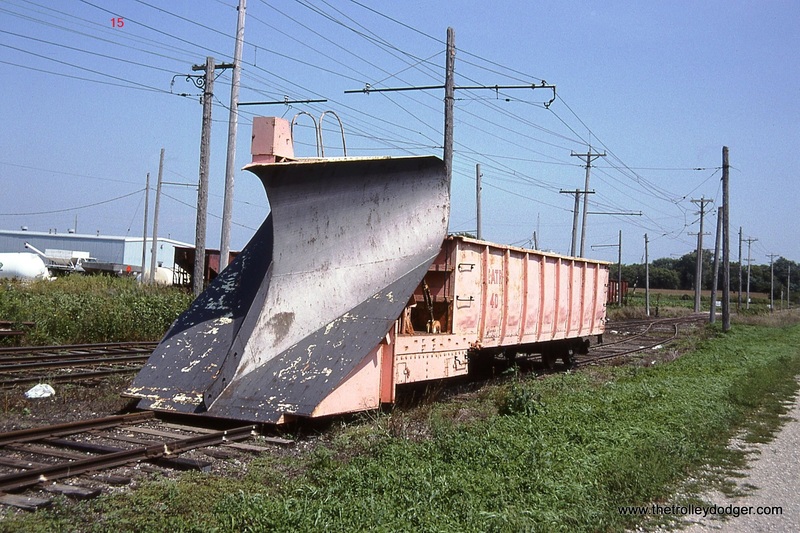 When I got this slide, it was identified as being a station on the Garfield Park “L”. 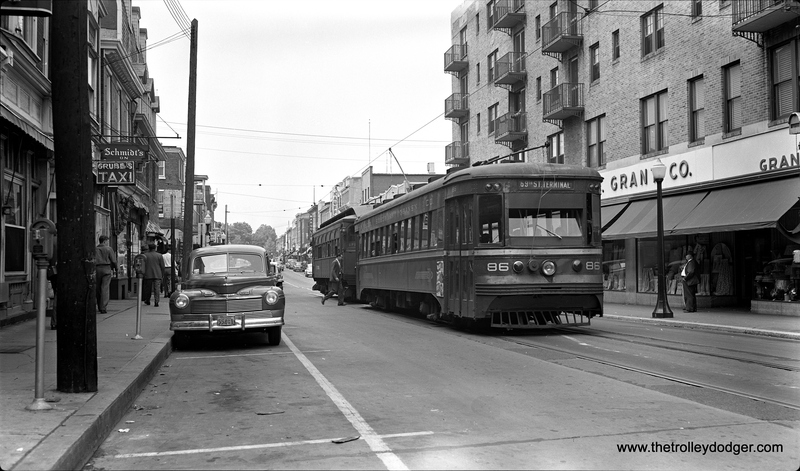 However, I did some further research, and it is actually the old Austin Boulevard stop on the Douglas Park line. The house and apartment buildings in the background are still there. The Douglas branch was cut back to 54th Avenue in 1952 and the former right-of-way is now used for parking. Locals still call it the “L” Strip. 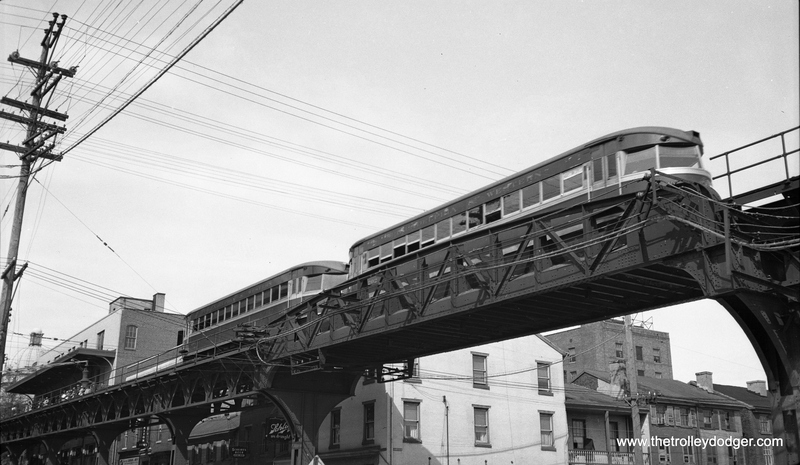 CTA 4002 is shown heading north on route 49 – Western on July 14, 1953. The photographer was up on the Logan Square “L” platform. The people at right are waiting for a southbound car at a safety island. In the distance, we see what was then the Bloomingdale freight spur of the Milwaukee Road, but is now part of the 606 Trail. Jim Huffman adds, “Photo #525. 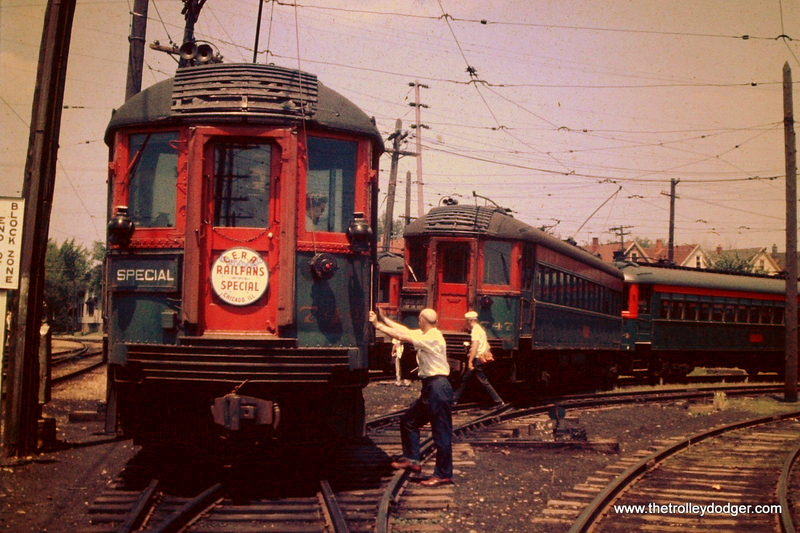 “CTA 4002 is shown heading north on route 49 – Western on July 14, 1953”, I feel is incorrect. 1. There is a 1955 Chevrolet on the left, precludes 1953. 2. 1-Man, Pre-War PCC were assigned in June 1955 (as well as 1-Man Post-Wars), prior to that Western used 2-Man Post-War PCCs only. Went Bus in June 1956. 3. People standing on the safety island are waiting at the end for the front door boarding of an 1-man car. 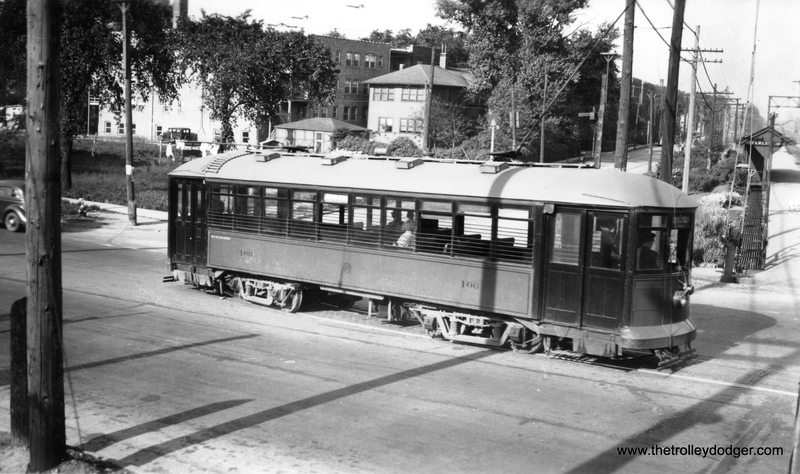 Prior to 1-Man cars, they waited at the other end for the rear doors. 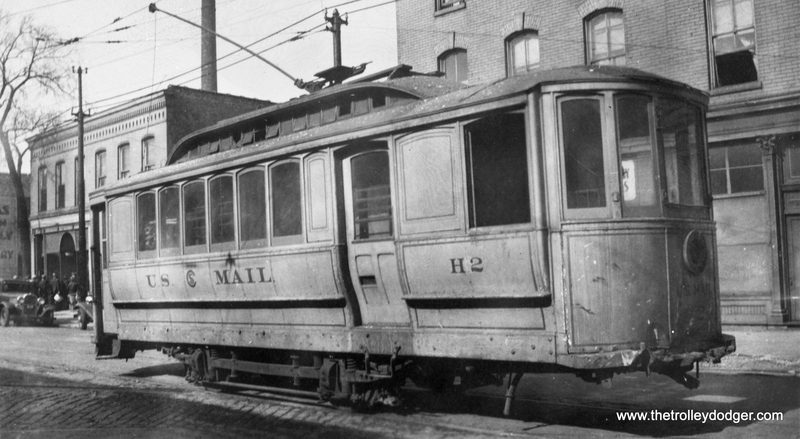 CSL single-truck mail car H2, apparently still operational, is shown years after streetcar RPO (Railway Post Office) service ended in 1915. It was scrapped on October 2, 1942. From the looks of the autos in the background, this picture may date to the 1920s. On this fantrip, Maury is calling the shots. Looks like he’s wearing a tie with various railroad insignias. 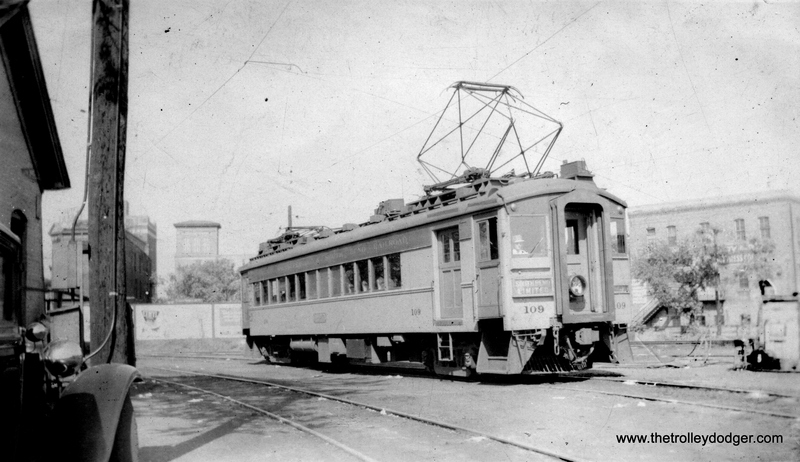 CSL 4033 passes the Garfield Park field house on Madison in 1938. 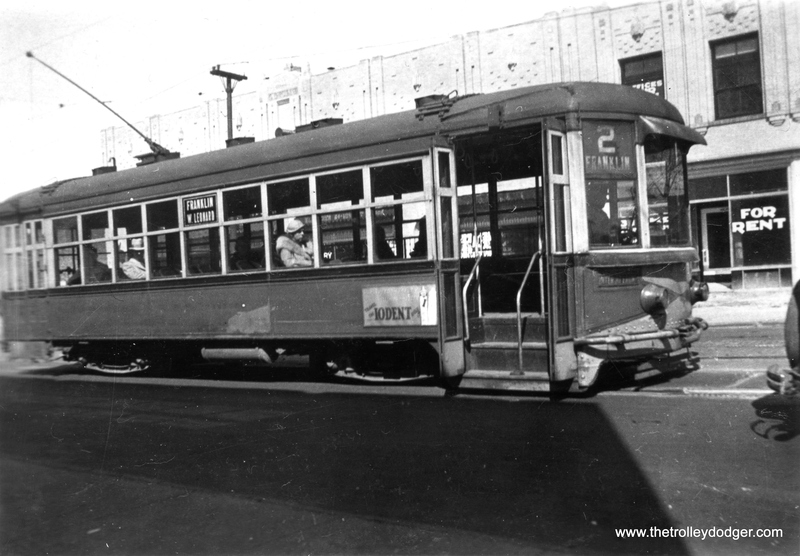 CSL Pullman 318 is heading west on Fullerton in the mid-1930s picture. At right, you can just make out the marquee of the old Liberty Theatre, which opened in 1911 and closed in 1951. The building is now a banquet hall. Will Rogers’ name is on the marquee. The photo date is given as September 8, 1937 and I guess that is possible although Rogers died in August 1935. The former Liberty Theatre at 3705 W. Fullerton. CSL 7024 is westbound on Madison just west of the Chicago River in this September 8, 1937 view. 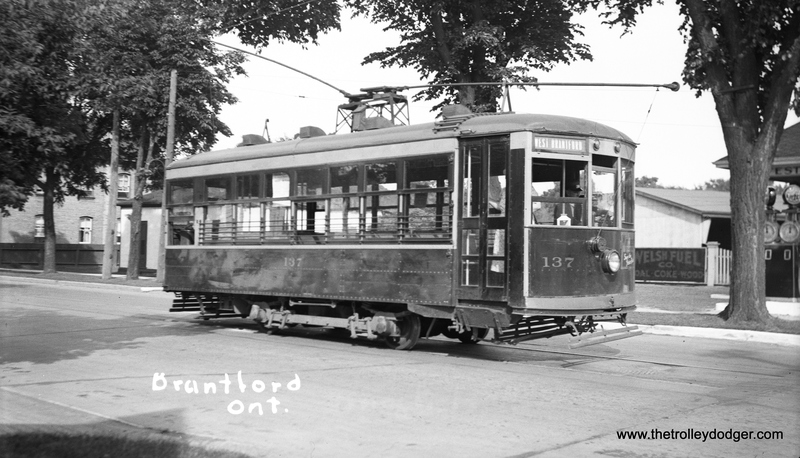 The photo caption describes this as a “noiseless streetcar,” with magnetic air brakes and rubber cushioned wheels. The view from 400 W. Madison today. We are looking to the southeast. State and Delaware today, looking south. 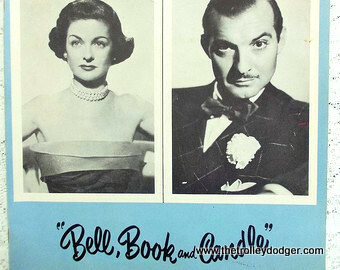 Joan Bennett and Zachary Scott in the 1952 off-Broadway version of Bell, Book and Candle. 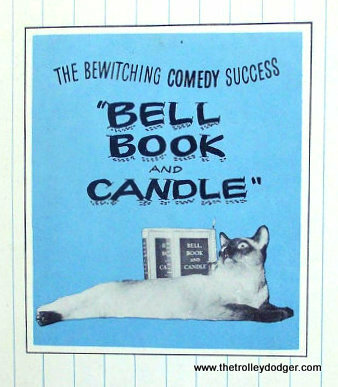 Bell, Book and Candle helped inspire the later TV series Bewitched. 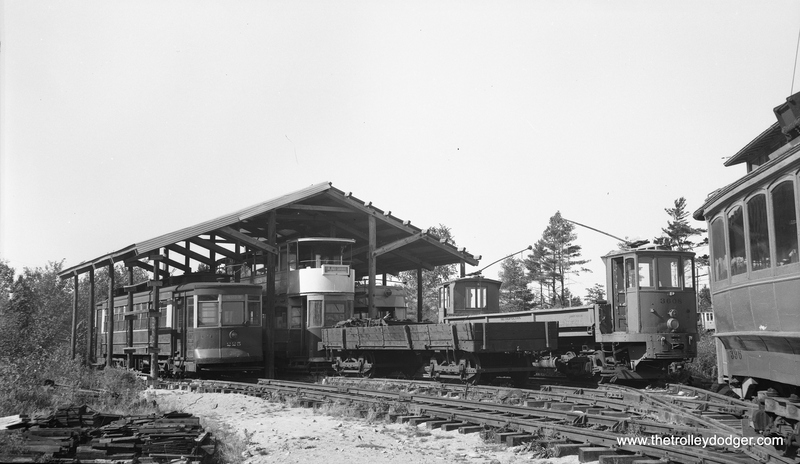 This undated photo shows the station (car house) at Cottage Grove and 38th. 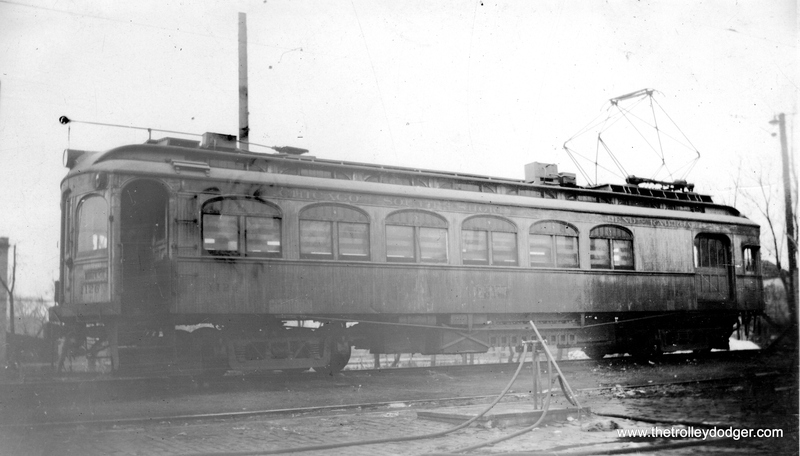 It is undated, but the newest car shown here was built in 1912. 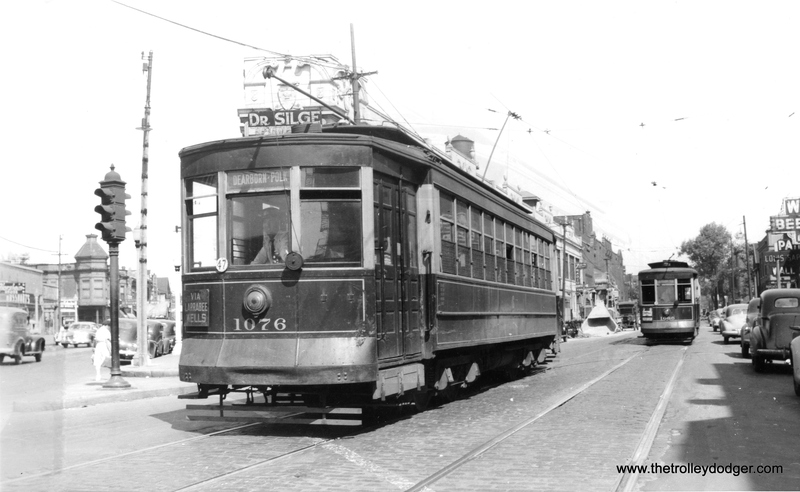 So a good guess would be sometime between 1912 and the early 1920s, when streetcars were painted red to make them more visible to motorists. 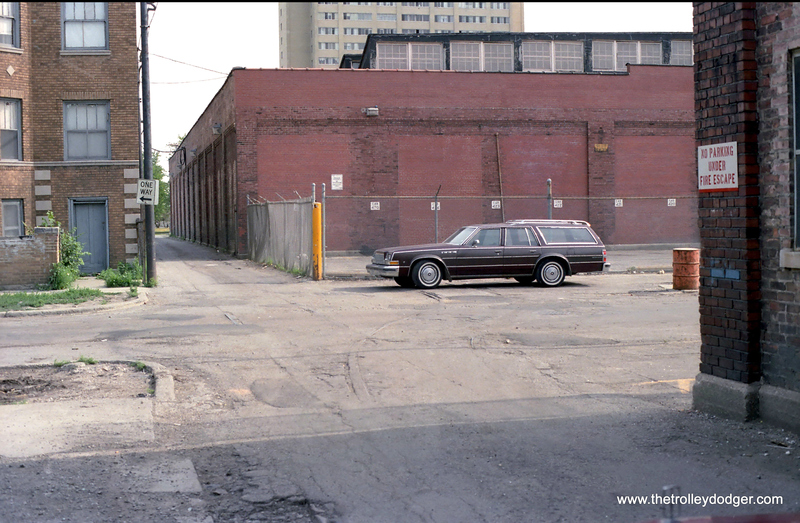 Several cars can be identified in this picture. From left to right, I see 5368, 5357, 5364, 5378, 5707, 5802, 5782, 5743, 5759, 5736, 5386, 5706, and 5348. All are either Brill-American-Kuhlman cars, or Nearsides. 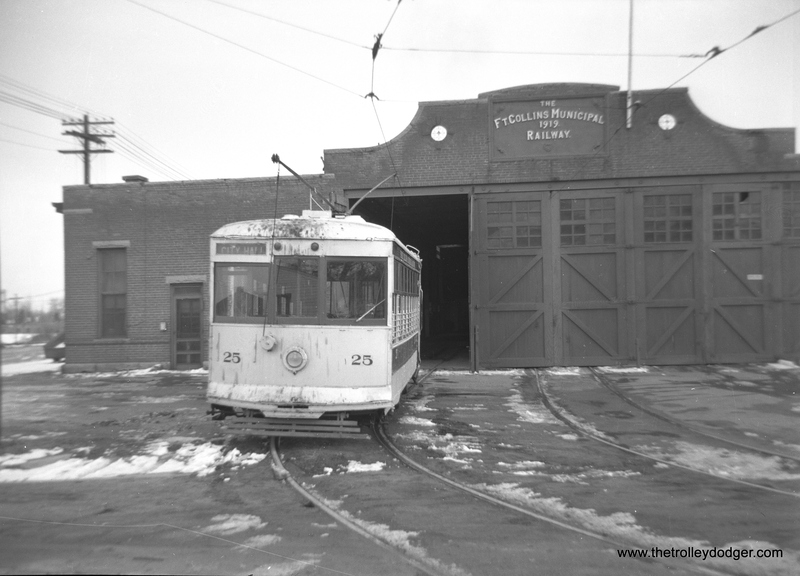 Streetcars last ran out of Cottage Grove in 1955, after which the building was demolished. A close-up of four unidentified men in the photo. Presumably, all worked out of the Cottage Grove station. 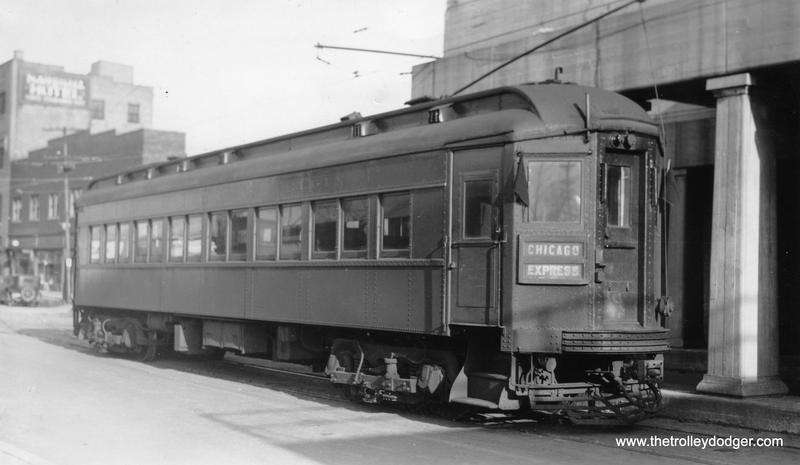 It’s April 23, 1939, and Chicago & West Towns cars 140 and 141 are operating on an early Central Electric Railfans’ Association fantrip. 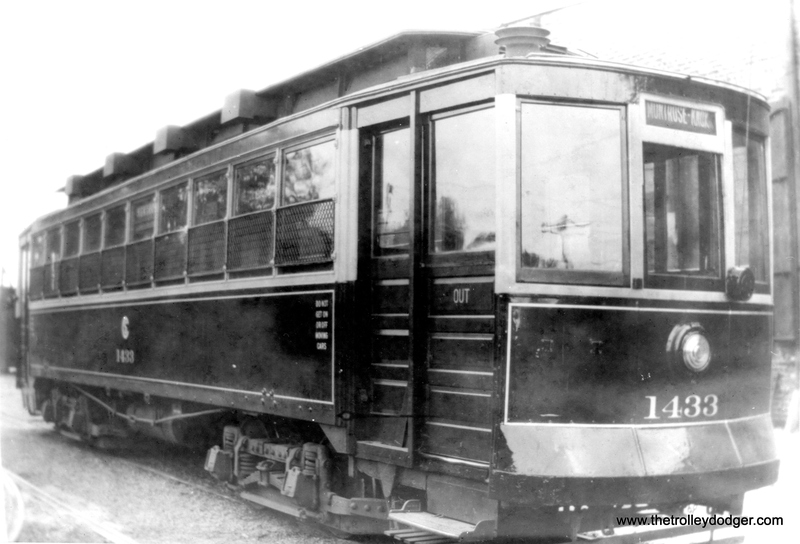 Car 141, the lone survivor of the fleet, is now restored to operable condition at the Illinois Railway Museum. 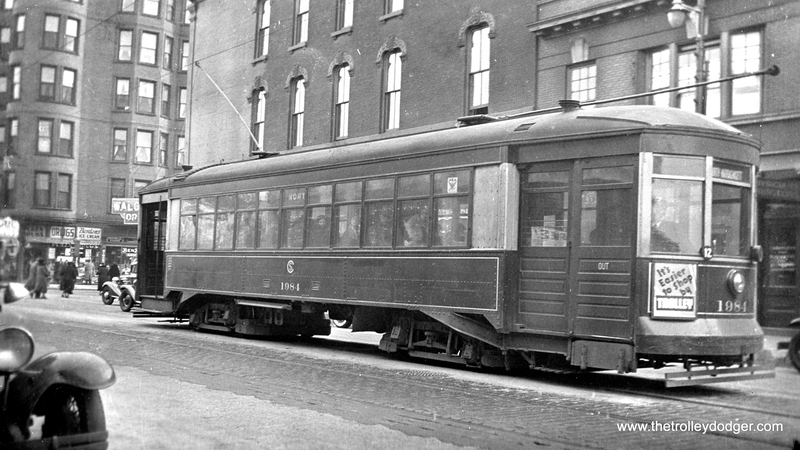 The Lackawanna & Wyoming Valley (aka the Laurel Line) was a Scranton-area interurban powered by third rail, much as the Chicago, Aurora & Elgin was. 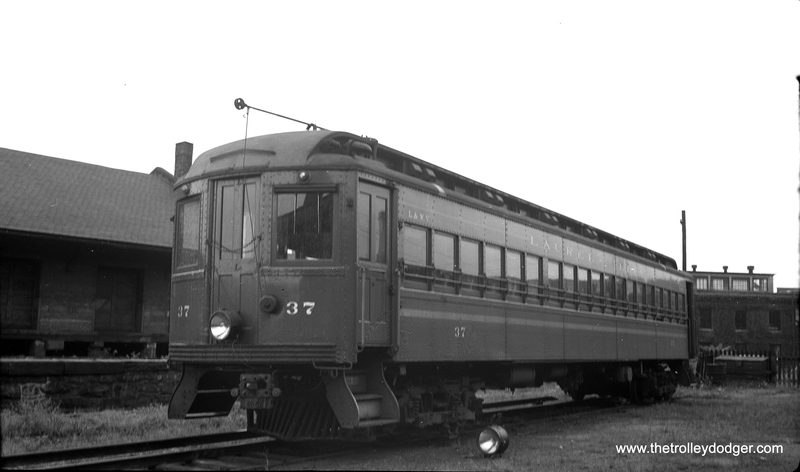 Here, we see coach #37 in Scranton on September 9, 1950. The line quit at the end of 1952. There were no takers for these cars and all were scrapped. 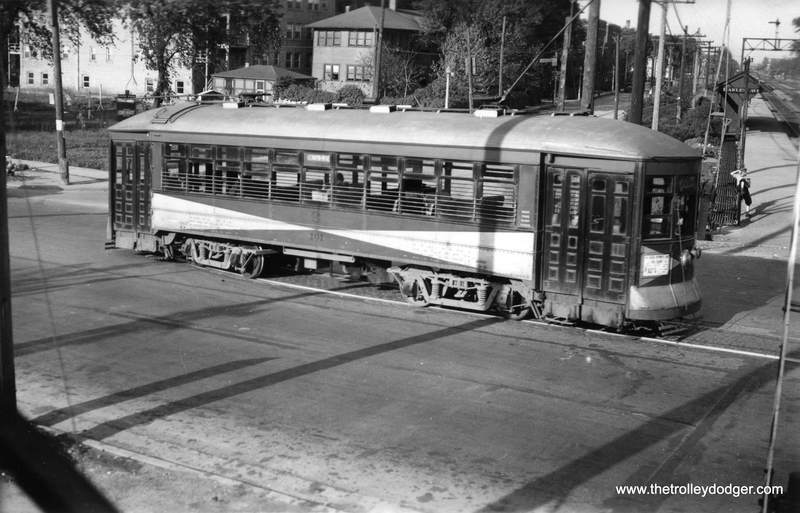 It has been suggested that perhaps CA&E might have benefited from buying some of these cars, although it does seem they were too long for tight turns on the Chicago “L”. However, I do not know if this would have prevented them from running on the CA&E after the system was cut back to Forest Park. 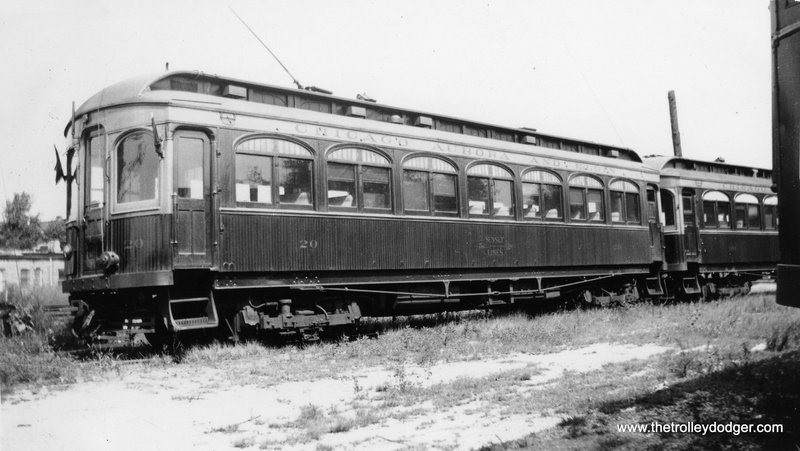 In any case, CA&E had previously reduced the length of other cars purchased from the Baltimore & Annapolis in 1938. What was missing in 1953, apparently, was a willingness to continue trying to operate. 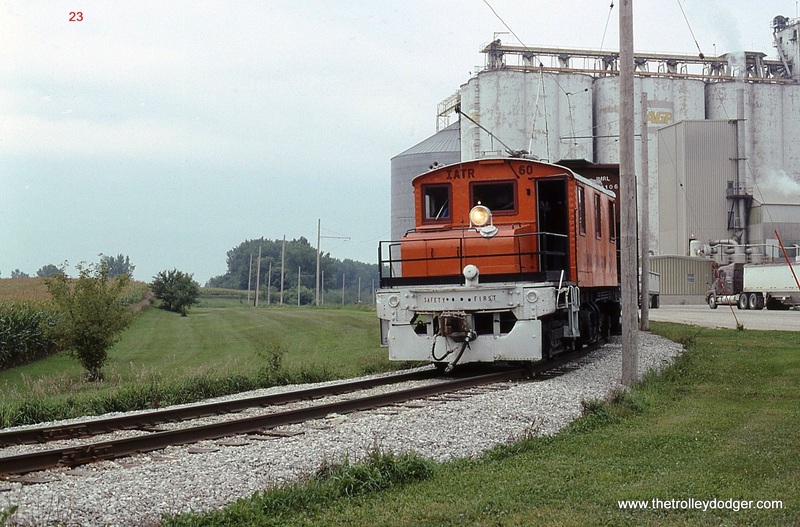 In some sense, the Charles City Western in Iowa was comparable to the Hagerstown & Frederick, in that it had sparse ridership, yet managed to survive into the 1950s with freight. Here we see combine 50 in March 1937. Don’s Rail Photos notes, “50 was built by McGuire-Cummings in 1915. It became Iowa Terminal 101 in December 1964. It was sent to Mount Pleasant and restored as CCW 50. It was then sent to Boone & Scenic Valley RR.” Vintage audio of the Charles City Western in operation can be heard on Railroad Record Club disc #28, which is available on compact disc via our Online Store. 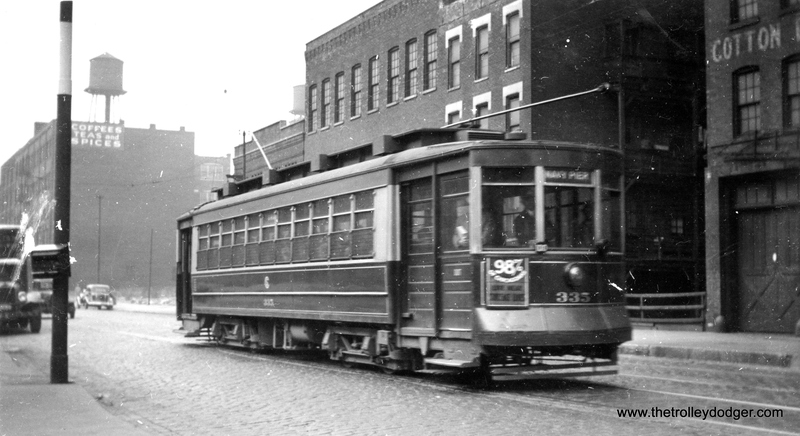 The Omaha & Council Bluffs Street Railway operated between Nebraska and Iowa. 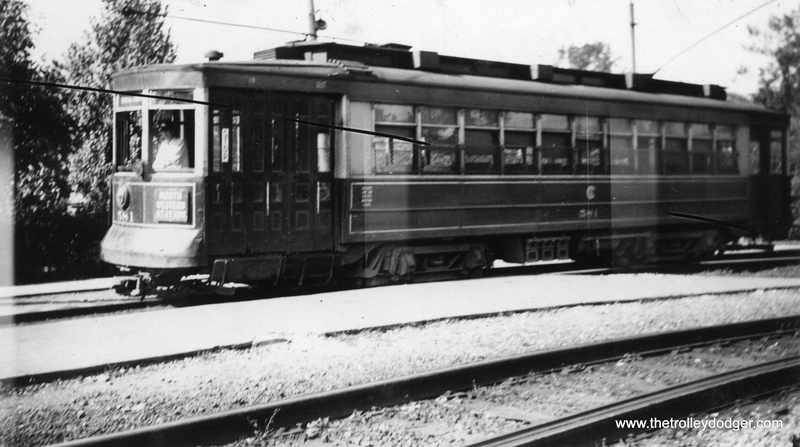 Here, car 814 is shown in Council Bluffs in September 1936, unloading passengers next to a natty-looking 1935 V8 Ford Sedan Delivery, advertising Old gold cigarettes. 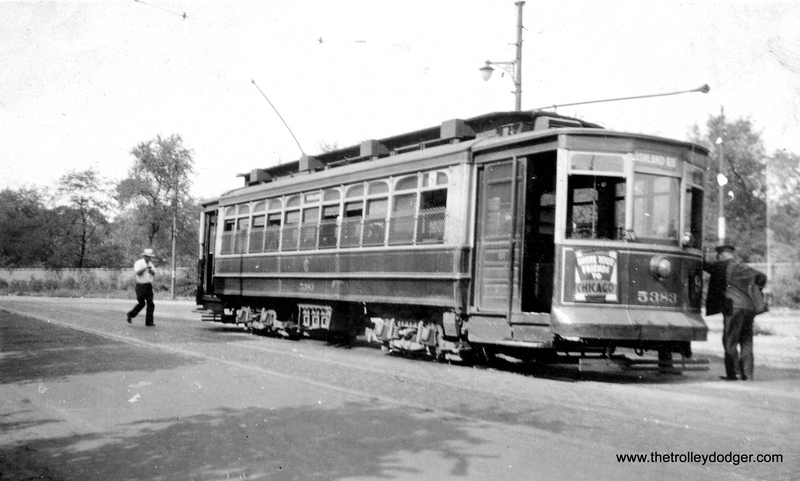 I assume this car was built by O&CB in 1908 and was rebuilt in 1932, possibly to convert it to one-man service. If so, riders would board at the rear and pay as they left through the front. Note the “people catcher” device at front. I wrote you once before, and I was hoping you might be able to help me again. I am still trying to find CSL employee photos. I had a researcher in Chicago spend some hours looking at the CHM archives of the CSL newsletter and she did find Gustav Johnson’s brief obituary in there for 1946. But very few photos. Do you know of any other place I might find photos of employees of CSL? The employee newsletter would have been the best bet. However, I do know a genealogist, and I can ask her to see what she can find out. In the CTA era, which started in October 1947, the newsletter ran more pictures of retirees, of which there were many. However, we are talking about several thousands of people working there at any one given time, so the odds of finding one person are not good. If you know which routes, or which car houses (aka “stations”) he might have worked at, that would help. 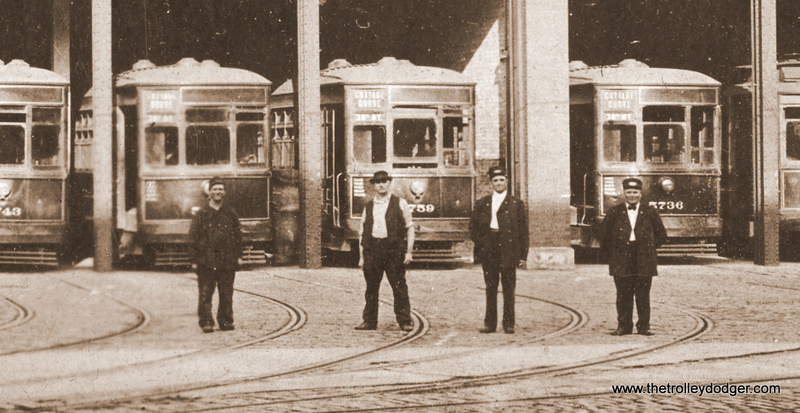 I just got a picture (see elsewhere in this post) showing four guys standing outside the car barn at Cottage Grove and 38th, taken in the early 20th century, but have no way of knowing who the people in the picture are. I will run your request in my blog, and see what other people might suggest. It was actually spelled Gustav Johnson. 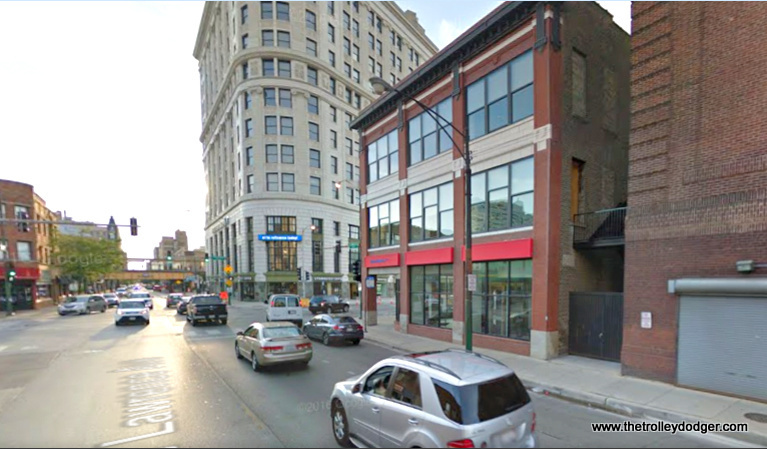 Does that mean that he would have reported to work every day at the Devon Station at 6454 N. Clark St/Devon St.? Also, can you confirm that a “motorman” was the engineer on the trolley and the “conductor” collected the fares? Thank you for your help David. I am determined to find a photograph of Gustav SOMEWHERE! Yes, that means he worked out of the Devon station, or car house. 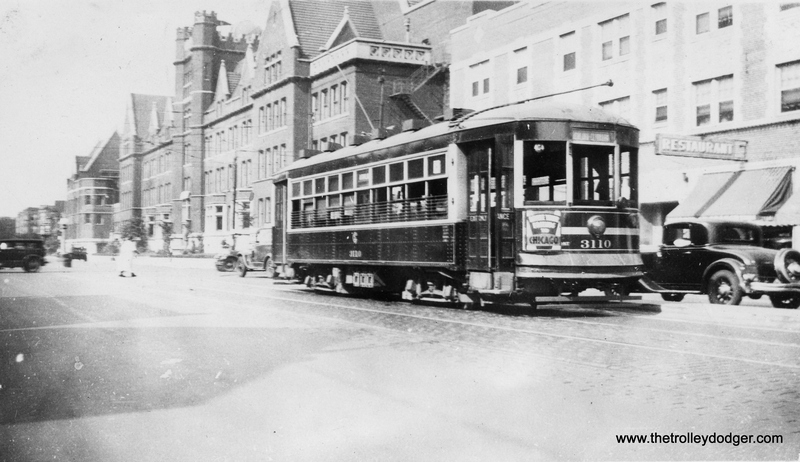 And yes, the motorman operated the streetcar, while the conductor collected the fares. 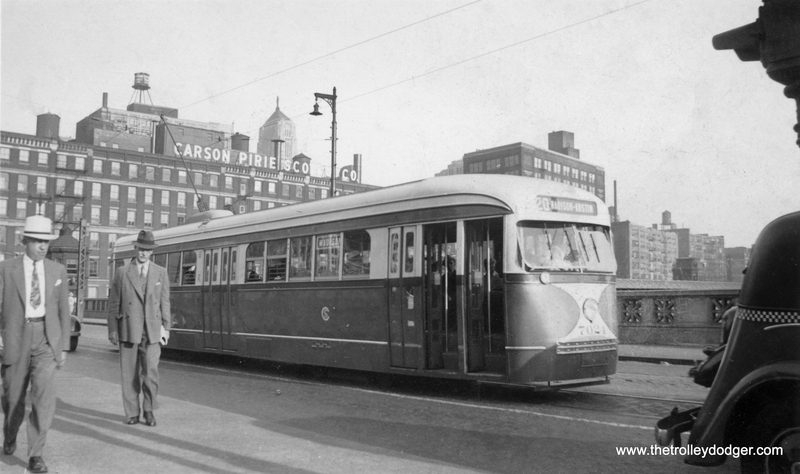 We have run lots of pictures in previous posts showing streetcars at or near Devon station. You can find those by typing Devon into the search window at the top of this page. 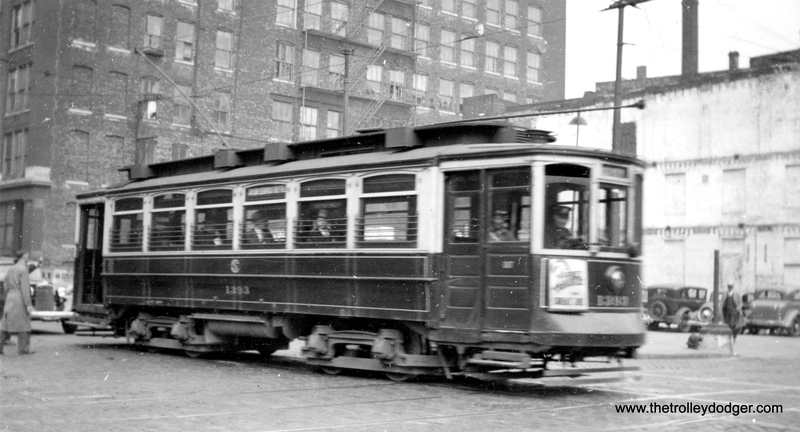 In the new photo, https://thetrolleydodger.files.wordpress.com/2016/12/dave511.jpg , the bay numbers under the Chicago City Railway logo are 7 and 6. 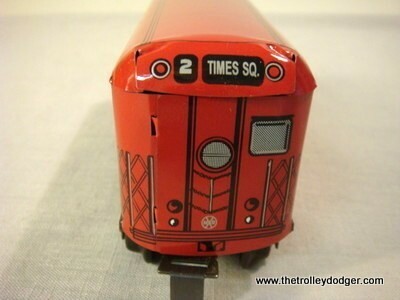 In the previous photo, https://thetrolleydodger.files.wordpress.com/2016/12/dave4891.jpg , the bay number under the logo is 4. This observation, together with the Campbell barn label (Campbell is nowhere near Cottage Grove), cements my opinion that you are correct saying the previous photo is of the 69th and Ashland carbarn. None of which solves the mysteries of why there are so many 4 Cottage Grove cars at the 69th and Ashland barn, and how they got there from Cottage Grove. It’s a mystery, alright… hopefully one we will eventually clear up, thanks! Hi David. I’ve been falling behind on my reading lately and just today read the latest Trolley Dodger “Recent Finds 2”. 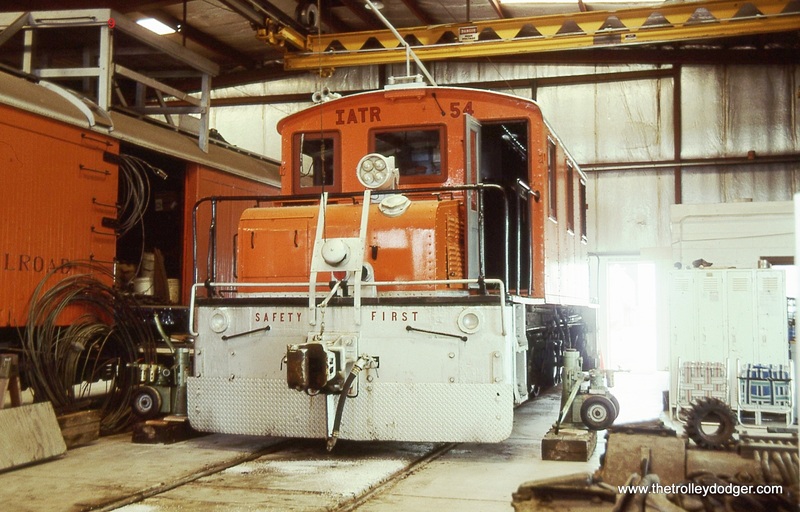 I was very interested in the photo of Hagerstown & Frederick Railway freight motor # 5. Back in 2008 while chasing and photographing the Maryland Midland RR train UBHF from Union Bridge to Highfield, I was surprised to find H&F freight motor #5 displayed at the former site of the H&F Thurmont Station along Main Street. 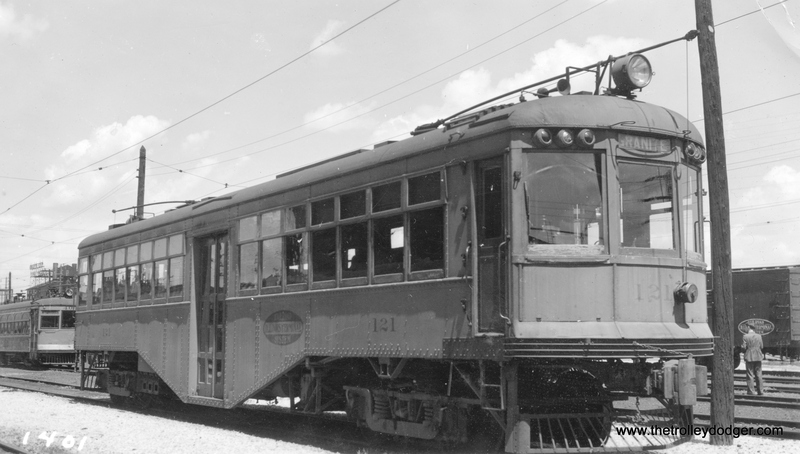 I checked and it looks like the car went from the Rockhill Trolley Museum to Thurmont in 2006. The car is now owned by the City and there are trucks under the body. 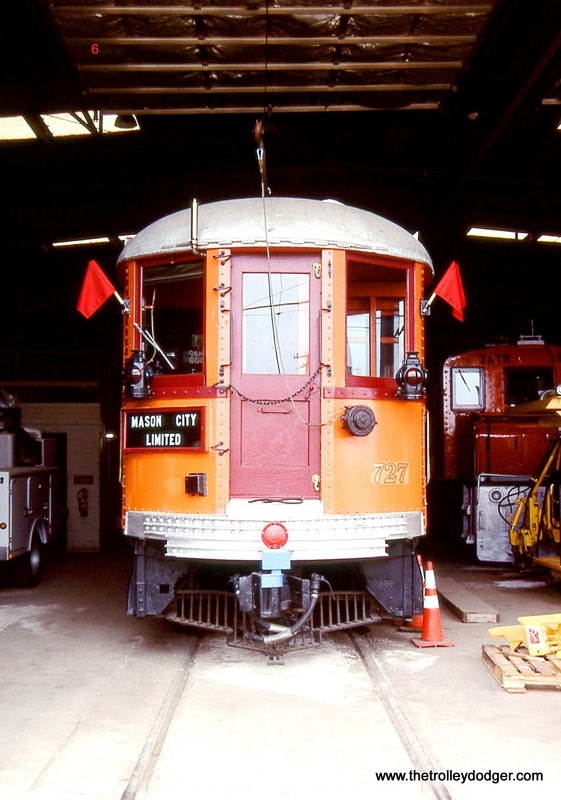 The museum operates what has been historically referred to as the Shade Gap Electric Railway to demonstrate the operable pieces in its collection. 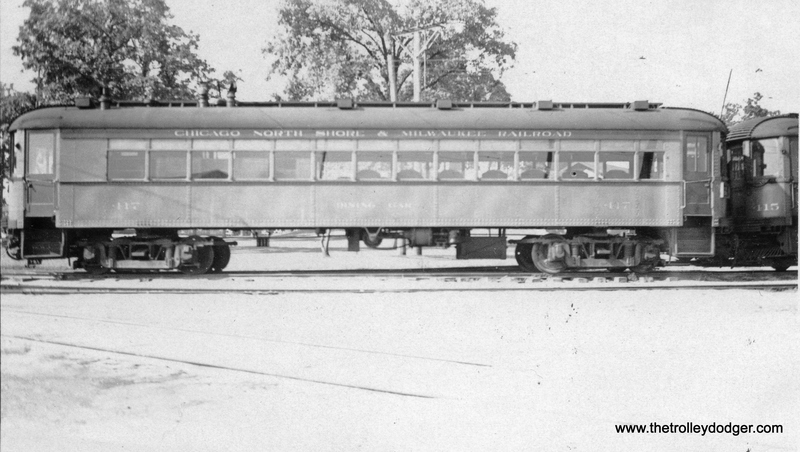 “Shade Gap” refers to the name of a branch of the East Broad Top Railroad, from whom the museum leases it property. Having grown up at 27th & Harvey in Berwyn, IL, effective walking distance from Austin/Cermak in the 1950s, I can confirm the station is, indeed, Austin on the Douglas Park line. The distinctive chain gate, which was atypical for the line, was my first clue. I used to find this gate fascinating to watch and enjoyed hearing the pulleys (in the towers on each side of Austin) crank it up and down. 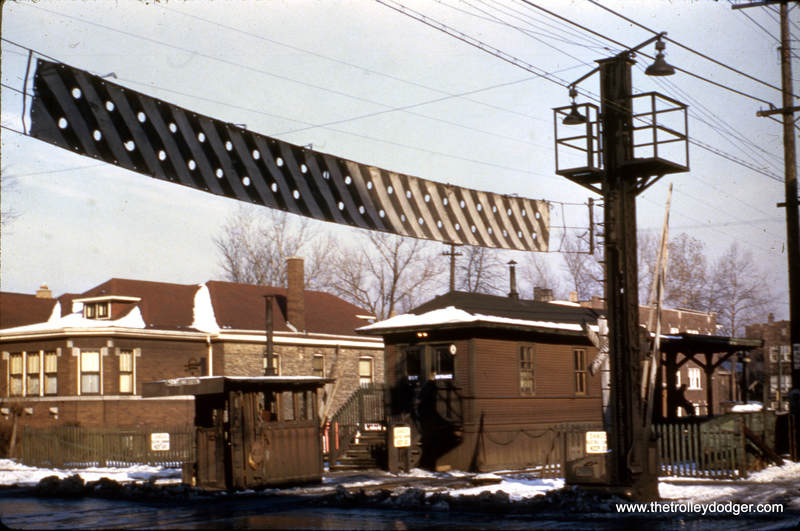 This was a very busy area in those days and the chain gate was effective in stopping traffic in both lanes that would otherwise attempt to get past standard gates to make the signals at Cermak Road. Nonetheless, the gateman who holed up in the little house in front of the station was still necessary. Love your web pages and visit them often. FYI, to raise money to help fund the original research we do on this site, we are selling two unique artifacts— decorative stained glass, circa 1878, from stations on the old IRT Third Avenue El in New York, which was torn down in 1955. We purchased these several years ago from a noted New York collector. You can check out our eBay auction here. This may be your only opportunity to own a true piece of history from that fabled line, which has yet to be replaced more than 60 years after it was abandoned. This is our 170th post, and we are gradually creating a body of work and an online resource for the benefit of all railfans, everywhere. To date, we have received over 228,000 page views, for which we are very grateful. 1. It was foggy in Emery, Iowa on the morning of August 22, 2006. 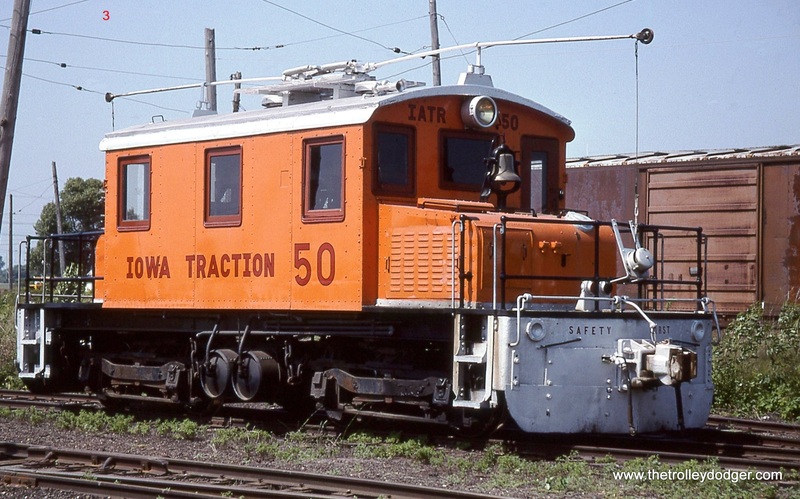 As I arrived at the Iowa Traction shop and yard, only an indistinct orange blob gave any indication that any of the railroad’s ancient electric locomotives were present. 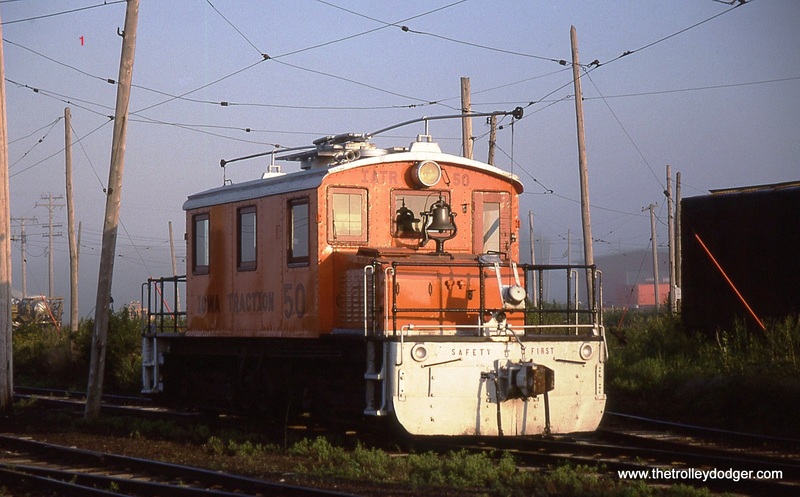 As the fog lifted, little by little, IATR Baldwin-Westinghouse type B steeplecab # 50 came into view. Here it is pictured as the mist retreated into the background. 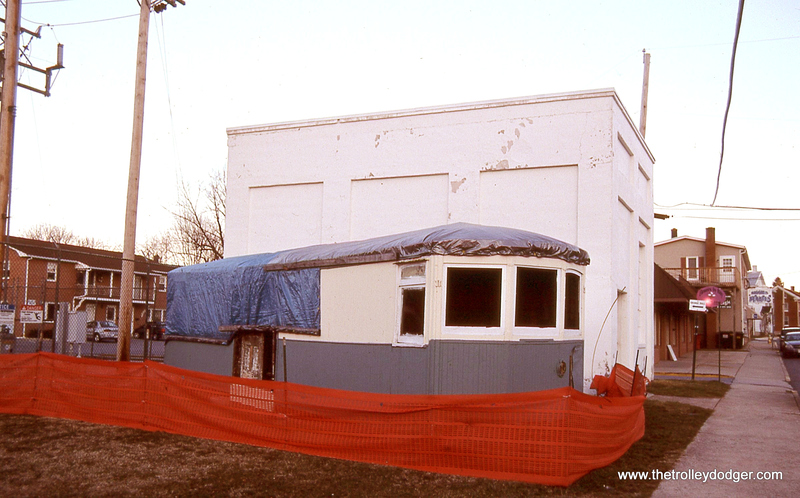 Today, we are featuring more fine photography from guest contributor Kenneth Gear, from a trip he took to Iowa in 2006. We thank him for this, and his many other contributions to this site. 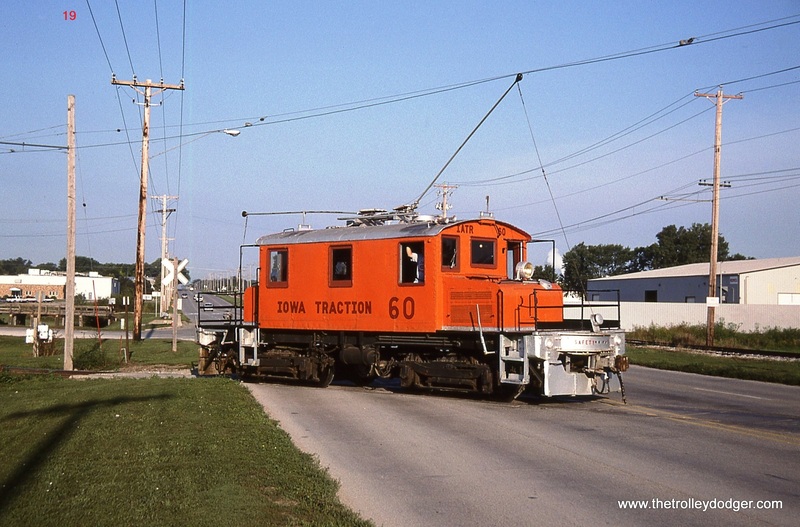 The Iowa Traction Railway Company (reporting mark IATR), formerly the Iowa Traction Railroad Company, is an electrically operated common carrier railroad running between Mason City and Clear Lake, Iowa, United States, and also serving Rorick Park near Mason City. It can trace its roots back to the Mason City and Clear Lake Railway, which was founded in 1896. The shops were situated in Emery, the midpoint between the two namesake towns. 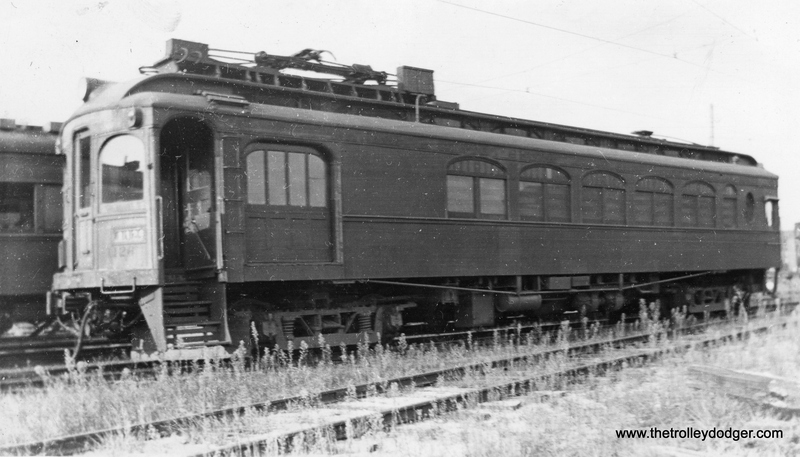 Passenger service began on July 4, 1897. 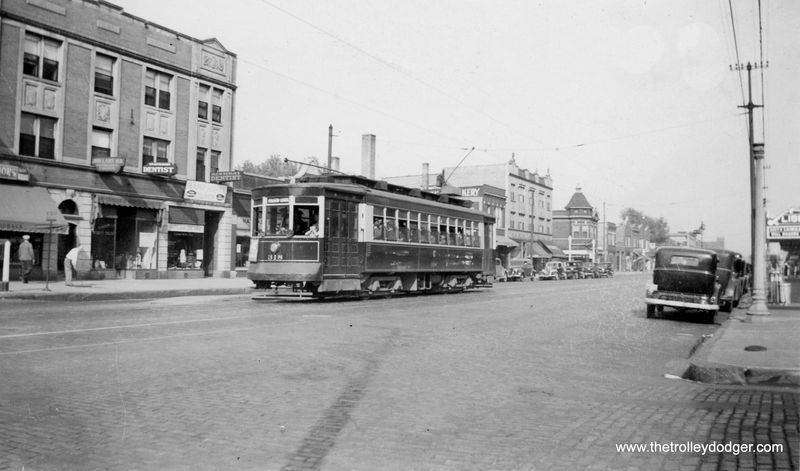 Freight has been the major source of income since the beginning and has been the only source since the charter for trolley service in Mason City expired August 30, 1936. 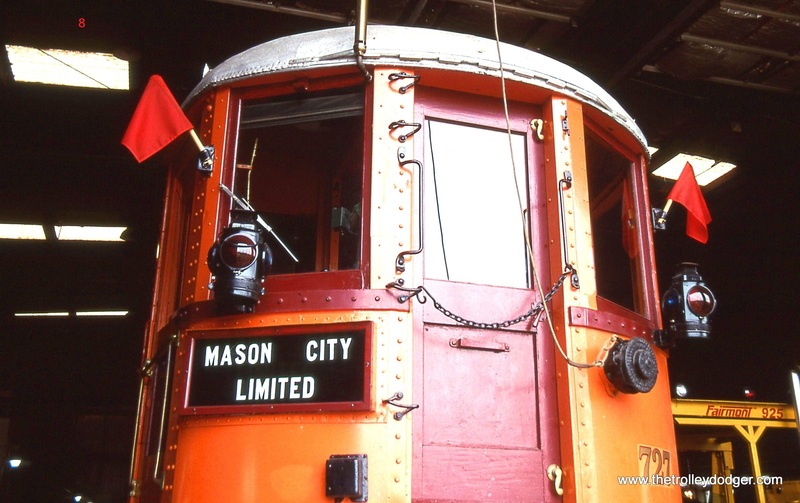 The Mason City and Clear Lake Railway’s name was revised slightly to Mason City and Clear Lake Railroad in 1950, when new owners took over. 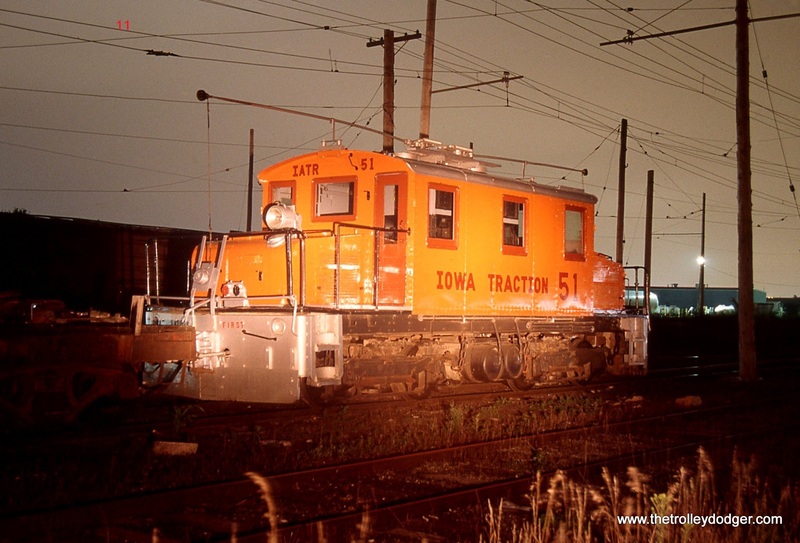 The name was changed to Iowa Terminal Railroad in 1961 when new owners from Michigan took over. They acquired the Charles City Western on December 31, 1963. 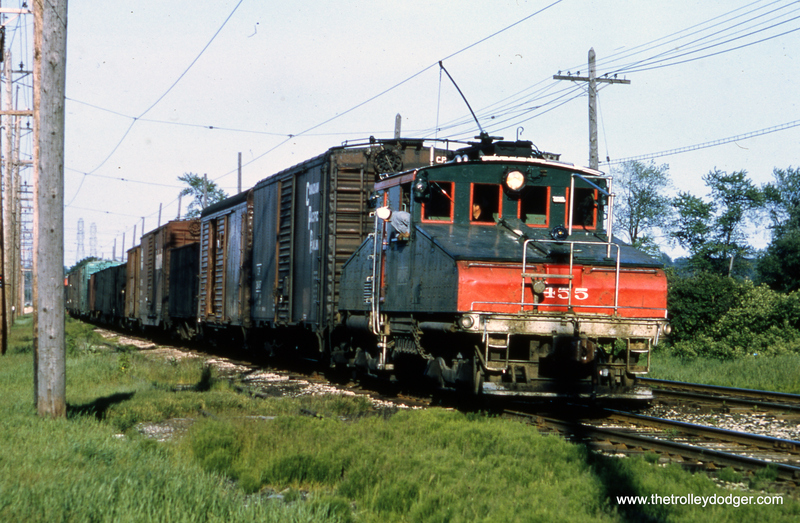 The Charles City Division was dieselized after a tornado destroyed much of the overhead wire on May 15, 1968. Several years later the remaining trackage at Charles City was abandoned. Meanwhile, the Mason City Division continued to operate as usual. The Charles City equipment was transferred to Mason City to replace equipment burned in the November 24, 1967 shop fire. 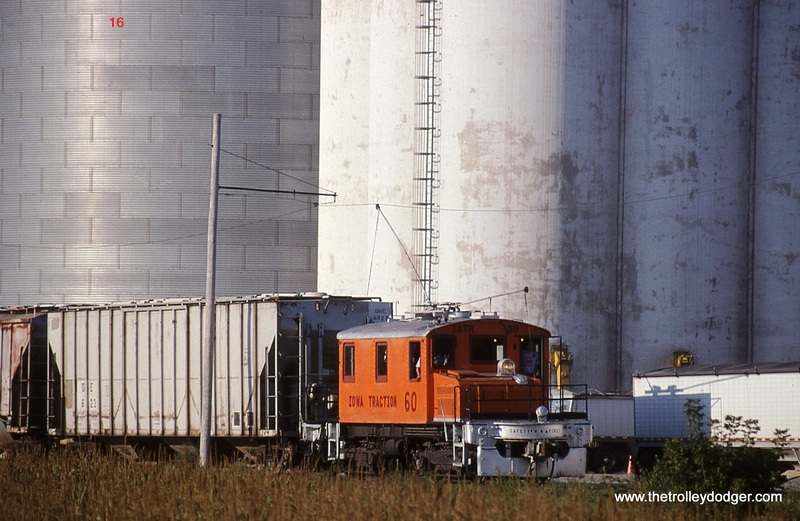 On April 13, 1987, the Iowa Terminal Railroad was sold to Dave Johnson and renamed to Iowa Traction Railroad. Today, the Iowa Traction continues to actively operate the track between its Emery headquarters (southwest of Mason City) and the Clear Lake Junction with Union Pacific Railroad. Though track exists beyond Emery to Interstate 35 in the west and from Clear Lake Junction to 15th Street Southeast in Mason City to the east, the active portion is Emery to Clear Lake Junction. 2. 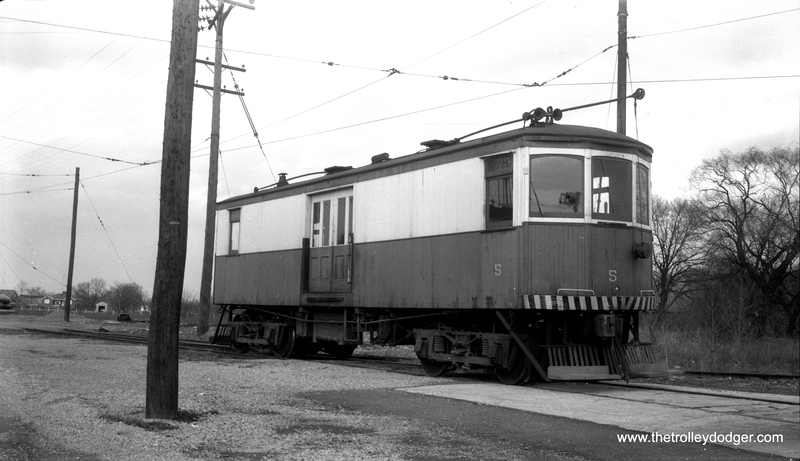 IATR # 51 with the car barn in the background. 3. 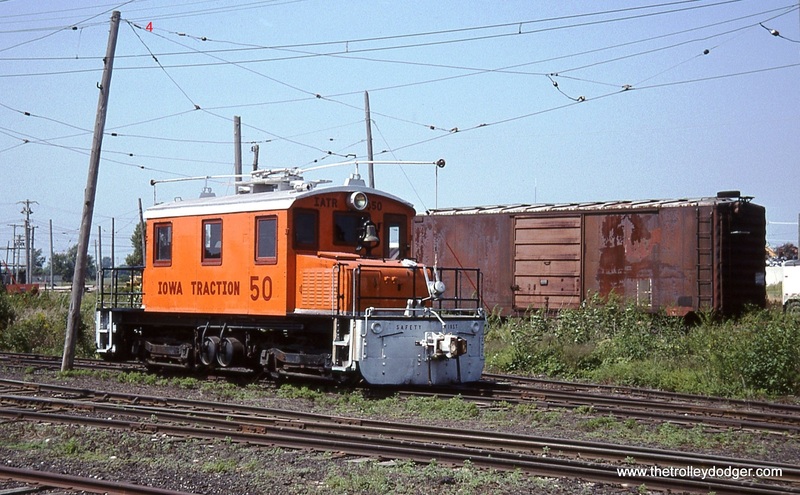 Iowa Traction # 50 at Emery. It was built in 1920 for the Washington & Old Dominion Railroad. 4. 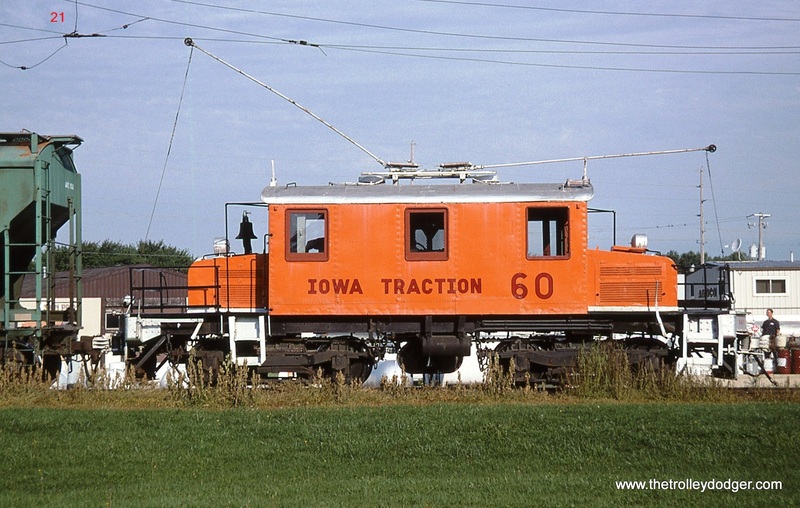 Iowa Traction # 50 at Emery 8/22/06. 5. 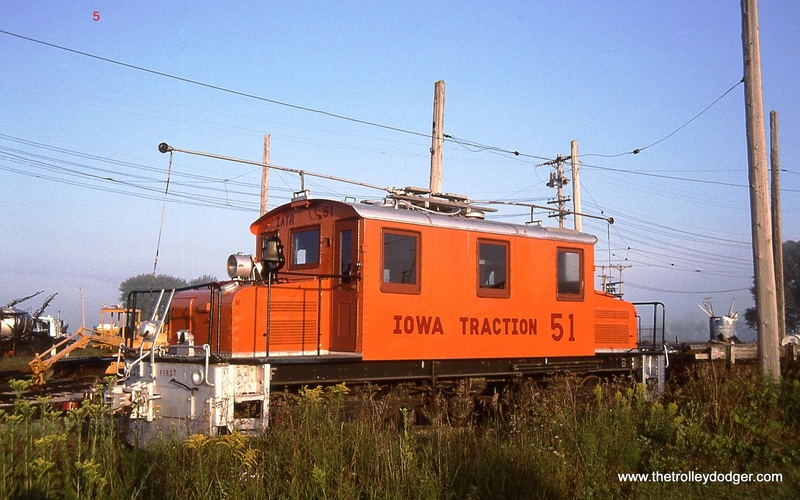 Iowa Traction # 51 in the Emery IA yard. 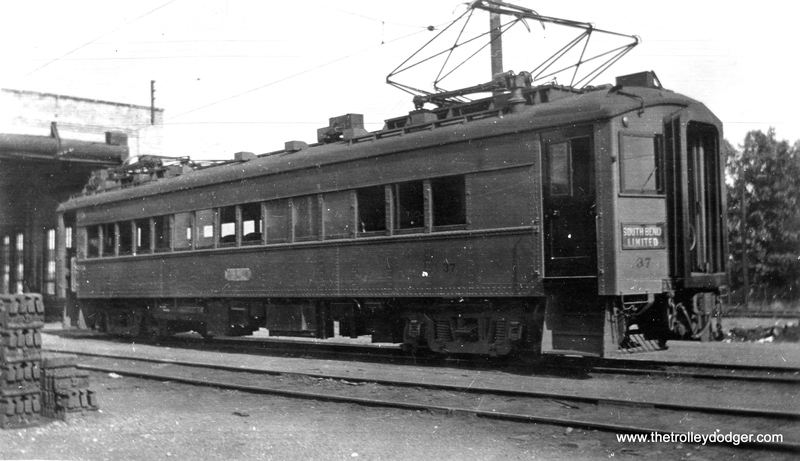 #51 was built by Baldwin-Westinghouse in 1921 for the Northeastern Oklahoma Railway. 8/22/06. 6 & 7. Iowa Traction interurban coach # 727 (formerly Chicago North shore & Milwaukee # 102) is just inside the Emery Car barn on August 25, 2006. 8. 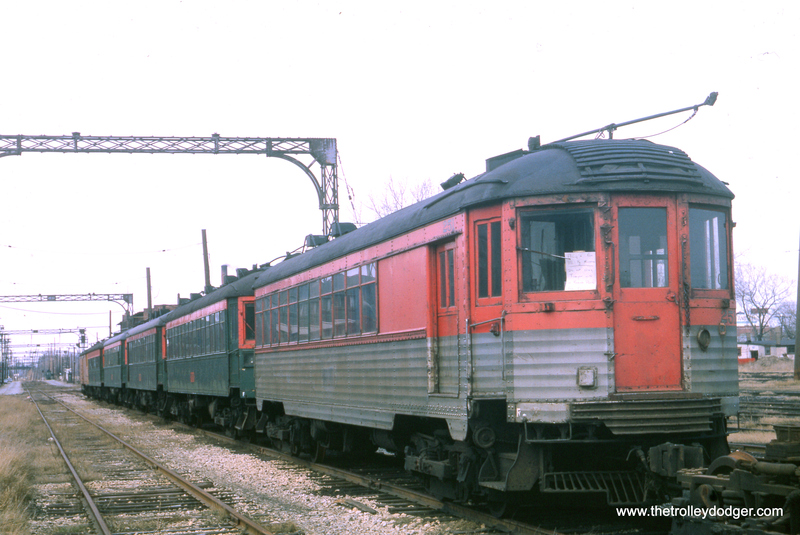 IATR interurban car # 727 is all decked out with flags and marker lamps because it will be out and running the next day on a fan trip, the “Mason City Limited”. Unfortunately my travel plans did not allow for me to remain in Mason City for another day so I missed seeing this classic interurban running down the rails. August 25, 2006. 9. 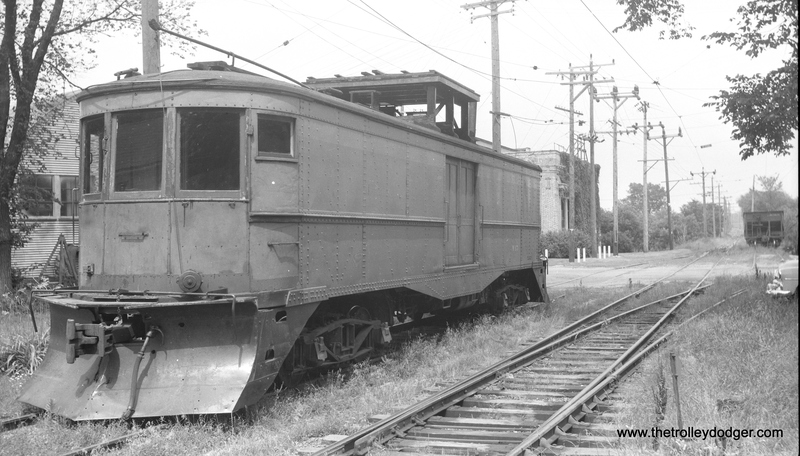 IATR # 54 was built in 1923 for the Southern Iowa Railroad. Here it is inside the Emery shop. 10. 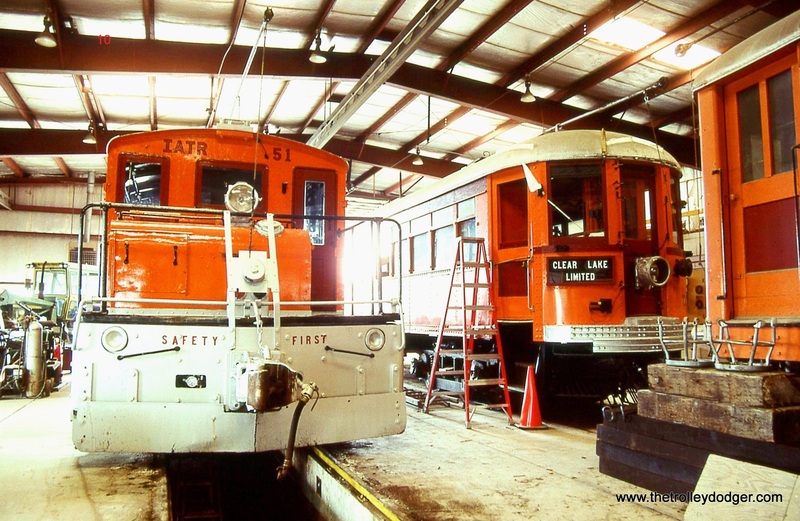 Iowa Traction Steeplecab # 51 and Interurban car # 727 inside the shop at Emery. 15. 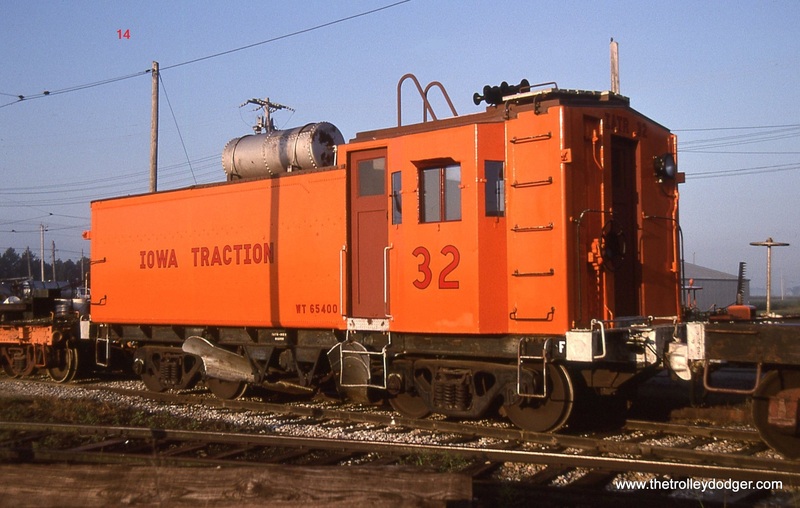 Iowa Traction snow plow # 40 at Emery, IA. 17. 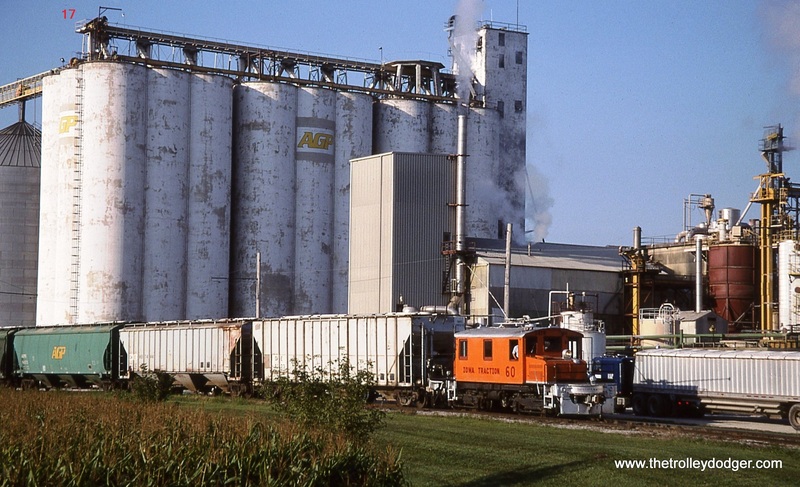 IATR # 60 pulls a cut of hoppers away from the AGP plant at Mason City. 18. 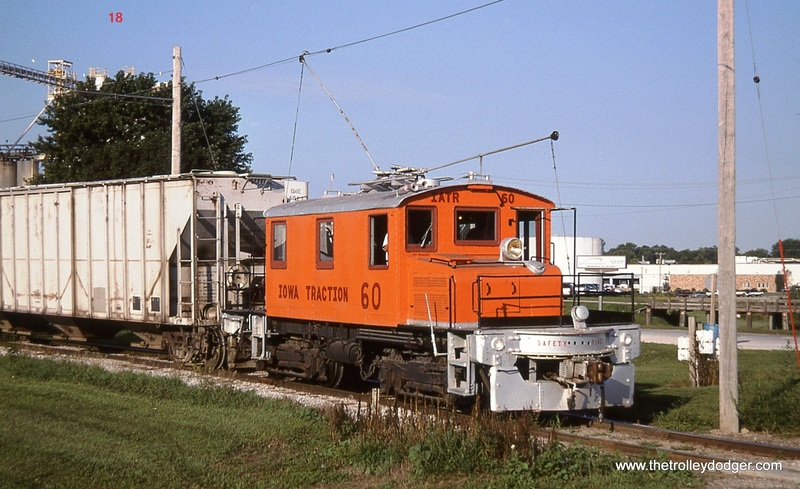 Iowa Traction Baldwin-Westinghouse type C steeplecab # 60 switching cars at the Mason City AGP plant. This locomotive was built in 1917 for the Youngstown & Ohio River as their # 5. 19. IATR # 60 moves light over the 19th Street SW crossing in Mason City. This locomotive remains in revenue service to this day and it was built in 1917. Next year it will be 100 years old and still going strong! 22. 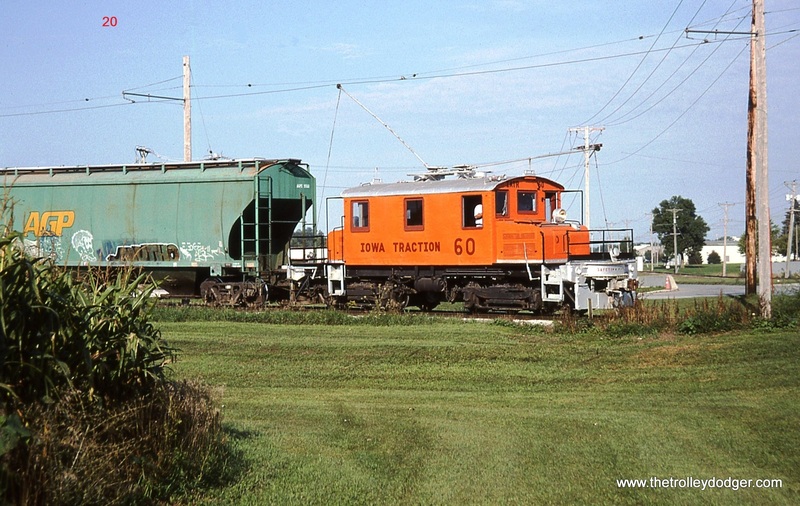 Here is one last shot of IATR # 60 hauling a cut of cars at AGP in Mason City on August 22, 2006. 23. August 25, 2006 was grey and overcast in Mason City but the sight of a 1917 built steeplecab electric locomotive in revenue service sure brighten up the day. Cloudy weather afforded the opportunity to get a shot of # 60 leaving AGP from the opposite side. 24. Steeplecab electric locomotives aren’t the only ancient pieces of railroad equipment used on the Iowa Traction. 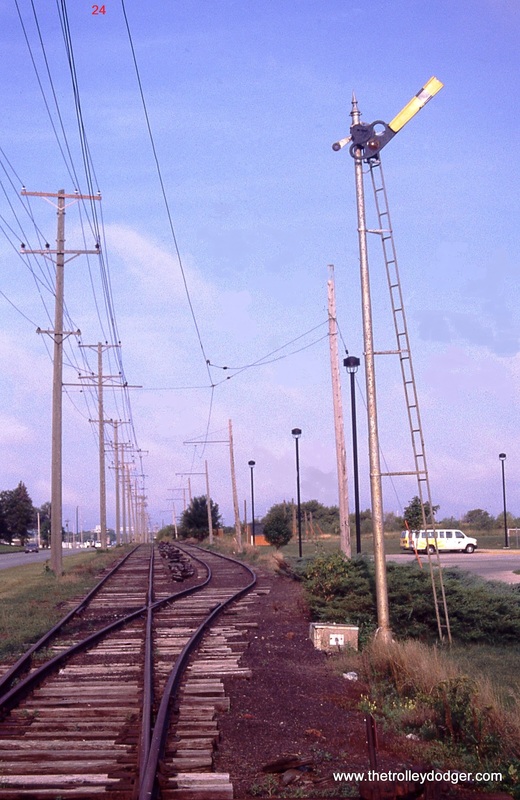 In Mason City this old semaphore signal protects the IATR crossing of the Union Pacific Railroad. 8/26/06. 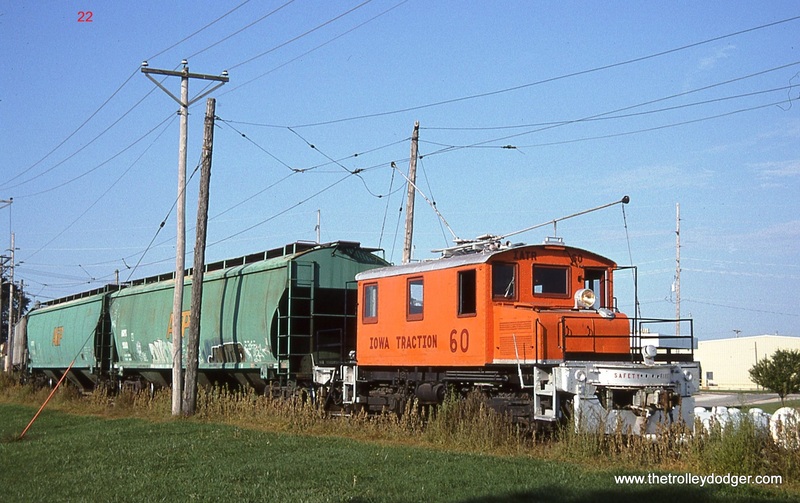 This is our 169th post, and we are gradually creating a body of work and an online resource for the benefit of all railfans, everywhere. To date, we have received over 226,000 page views, for which we are very grateful. 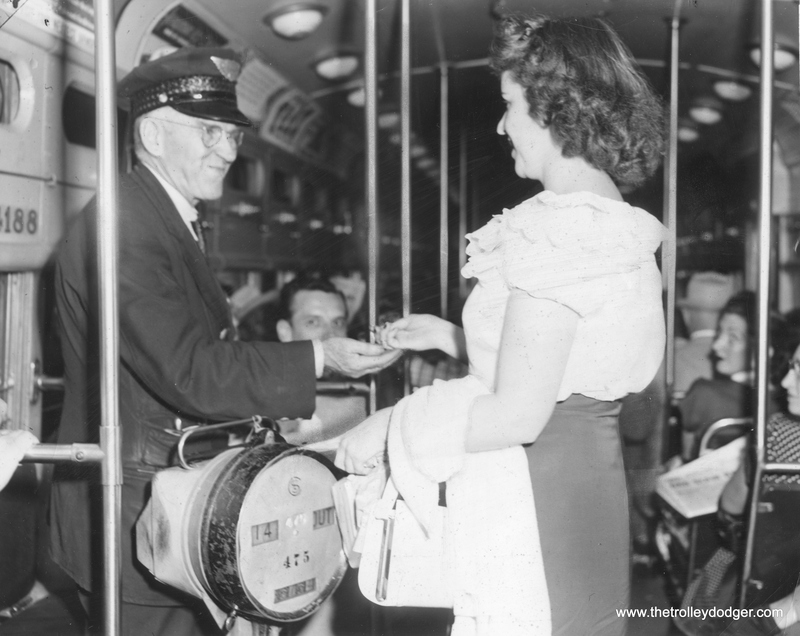 On August 1, 1951, CTA surface system fares were increased to 17 cents. Here, on two-man PCC 4188, Miss Elma Parrssinen dutifully pays her fare to conductor James Long. 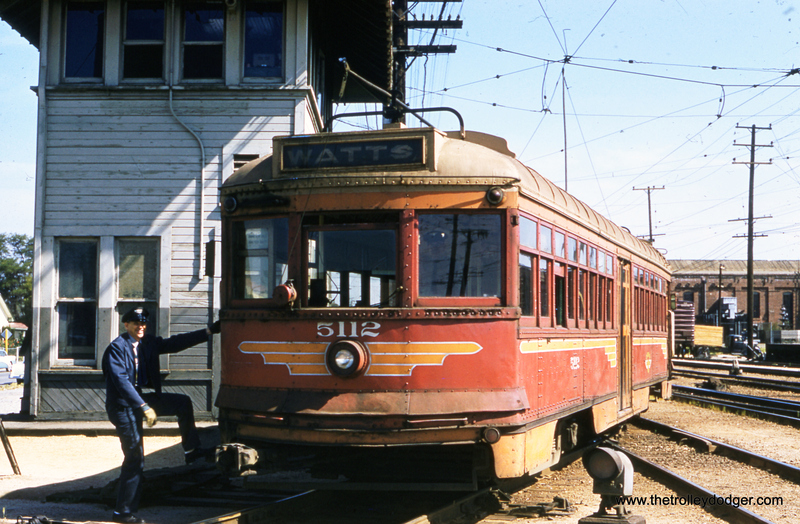 According to information provided by Andre Kristopans, which we ran in a previous post, car 4188 had a retirement date of June 9, 1953, making it one of the first postwar cars scrapped as part of the so-called “PCC Conversion Program,” whereby some parts from these cars were recycled into new 6000-series “L” cars. 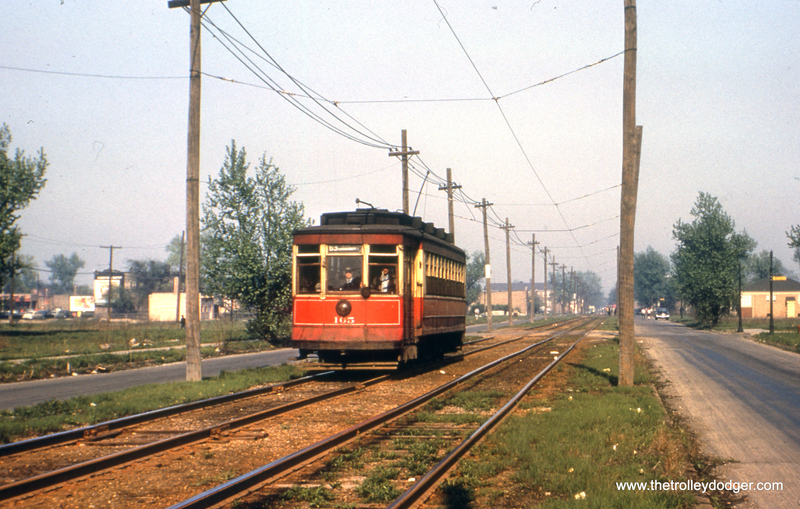 This photo of CTA streetcar 6149 was taken from an original red-border Kodachrome, which identifies the location as the “Campbell Avenue barn yard.” However, to me it looks like 69th and Ashland. The slide mount is of a type used by Kodak between 1950 and 1955. I would say this is closer in date the the former. Campbell is 2500 West, which puts it a block west of Western (2400 West). Suppose the original location statement was a mile off. 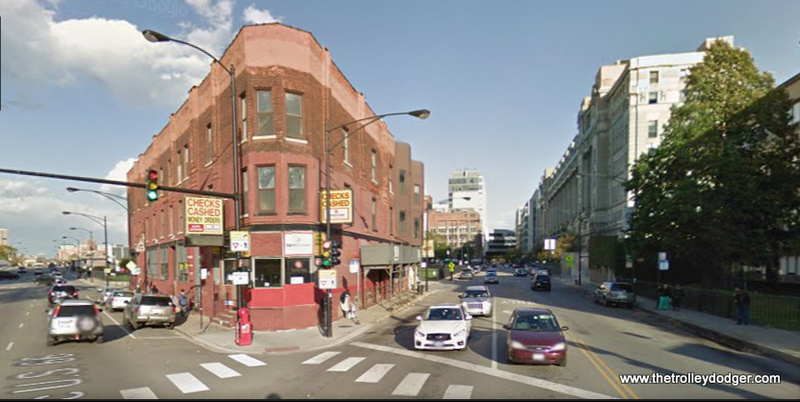 Paulina is 1700 West, a block west of Ashland (1600 West), and at 69th St., Paulina was just west of the carbarn. So I agree with you that this is probably the 69th and Ashland carbarn. 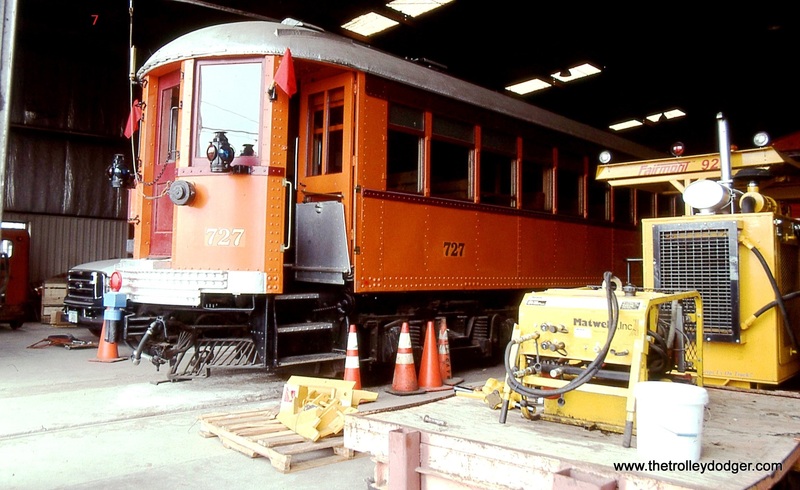 As confirmation, the 67th-69th-71st St. line (route 67) went right past the carbarn, and the destination sign aboard the route 67 car says 71st and California, the western terminus, where the route 67 car will go after leaving the barn. However, I cannot explain the presence of route 4 Cottage Grove cars at the 69th and Ashland carbarn. 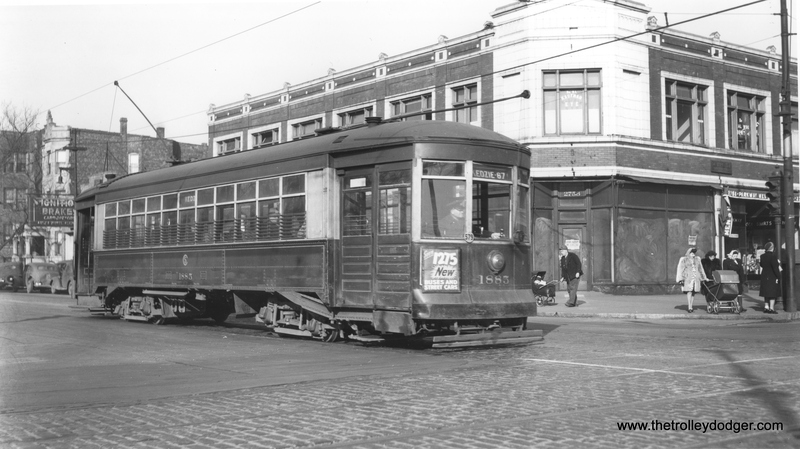 The readable destination sign on car 6149 says Cottage Grove and 79th, which is a lot closer to the big carbarn at 77th and Vincennes than it is to 69th and Ashland. I consulted my Lind book to find out when the 79th Street line and the 67th-69th-71st Street line were converted to buses. Lind says 79th was converted in September 1951 and 67th-69th-71st was converted in May 1953. So I think this photo was taken after September 1951 and before May 1953. 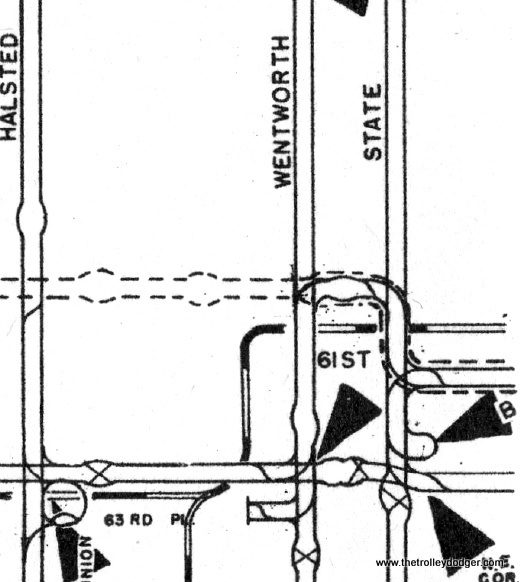 Somehow Cottage Grove cars were able to get to the 69th and Ashland carbarn, even though the trackage diagrams in the Lind book show no switches at 67th and Cottage Grove. Maybe the CTA built switches at 67th and Cottage Grove after September 1951 just for this purpose. 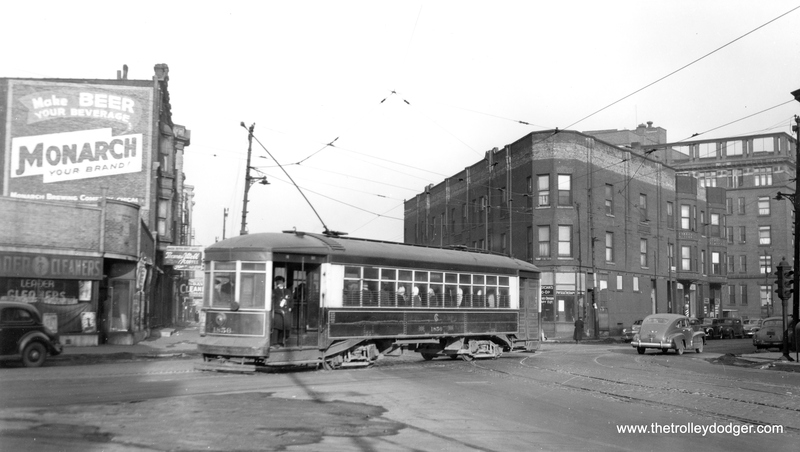 The 69th and Ashland carbarn also housed Western Ave. cars. 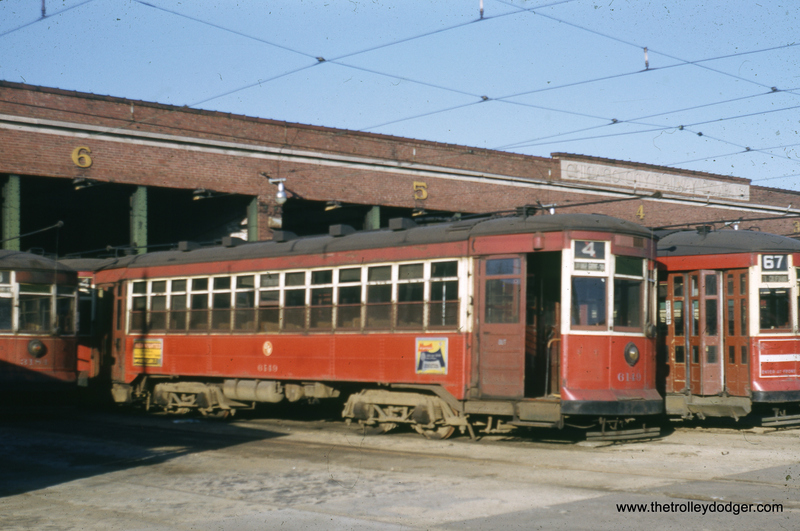 But that carbarn must have closed soon after May 1953, because after that date, PCC cars on Western used 69th St. trackage to go east to Wentworth, south to Vincennes, and southwest to the 77th and Vincennes carbarn. 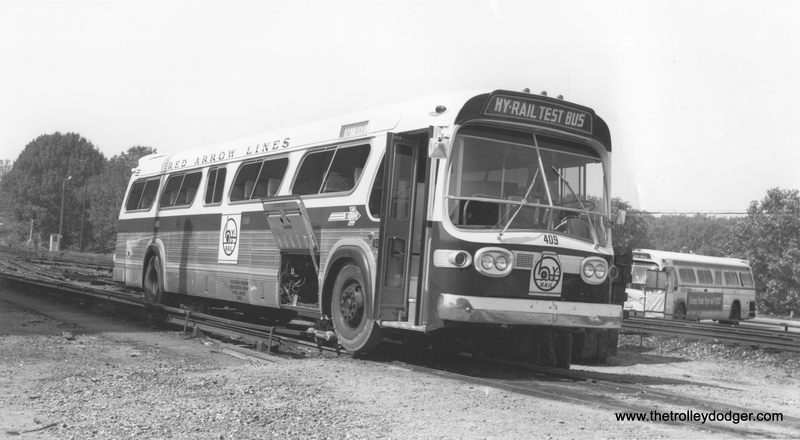 That lasted until Western was converted to buses in 1956. Thanks… I will have to look up the closing date for the 69th station (car house). 67 67th-69th-71stLind says both lines 63 and 67 converted to buses in May 1953. But Ashland did not convert until February 1954. 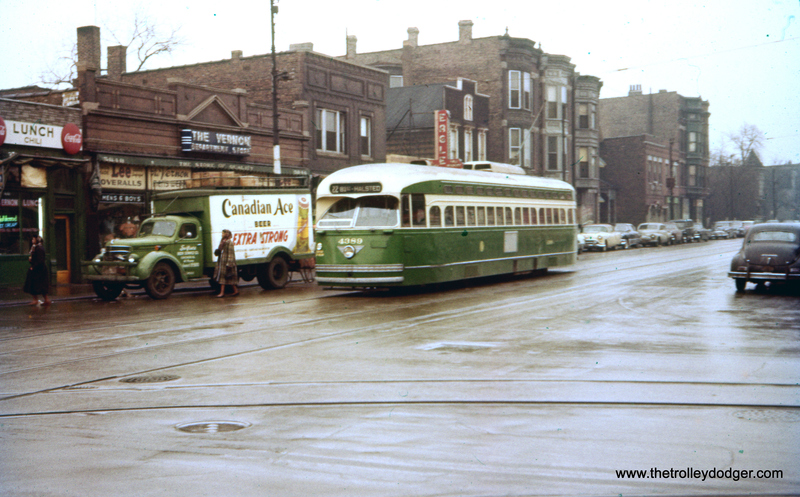 And as I said earlier, Western converted in 1956.Therefore, the 69th and Ashland carbarn closed in February 1954, after which Western cars lived at 77th and Vincennes until 1956. I moved out of Englewood in November 1954. I wasn’t aware that the 69th and Ashland carbarn became a bus barn and lasted another four decades. Live and learn. 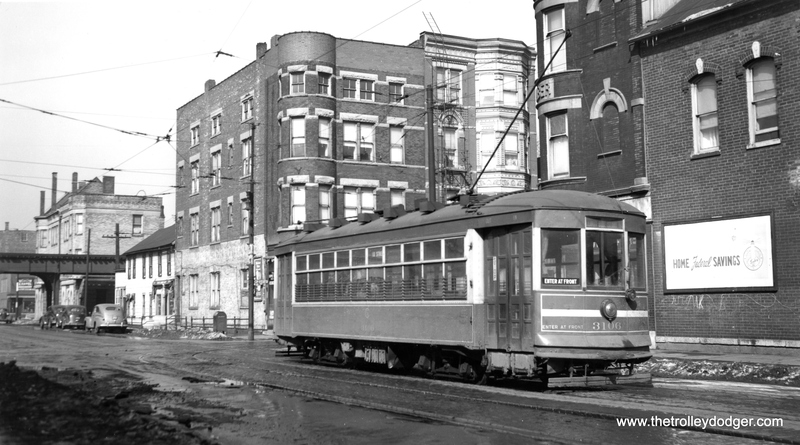 The fact that the 69th and Ashland barn stayed open after May 1954 begs this question: Why didn’t the Western Ave. streetcars continue to use it, rather than travel all the way to 77th and Vincennes? 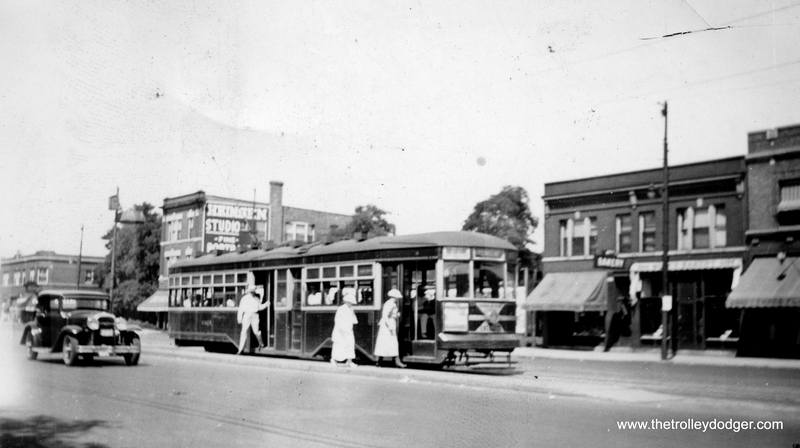 But herein lies a further question: If 38th and Cottage Grove was kept open until the Cottage Grove line was converted, then why were Cottage Grove cars in the photo of 69th and Ashland? 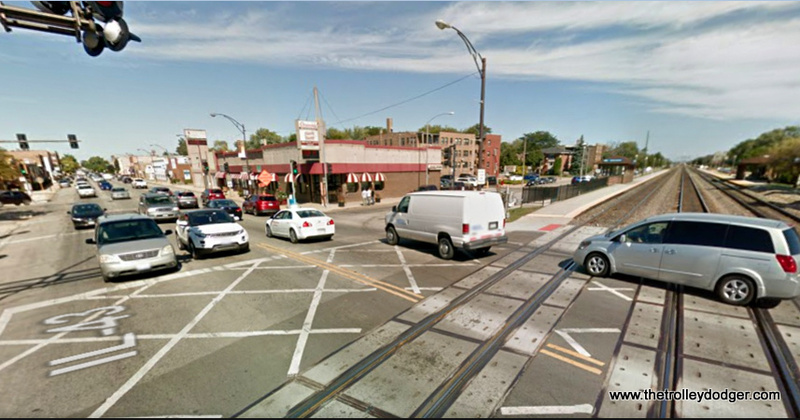 I already mentioned that I saw no trackage that would allow Cottage Grove cars to reach 69th and Ashland. 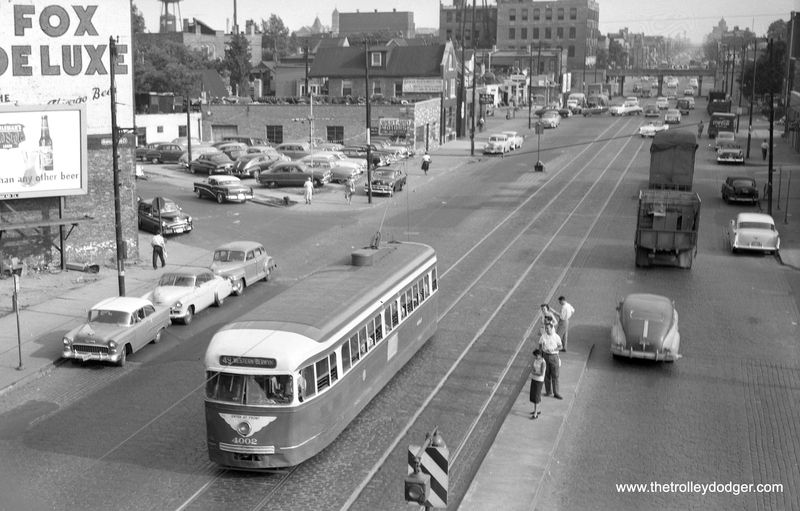 I had the radical notion that perhaps the photo was not of 69th and Ashland, but instead of 38th and Cottage Grove. But then why would a 67 route streetcar be there? And the same lack of switches at 67th and Cottage Grove would preclude allowing 67th-69th-71st cars to travel to 38th and Cottage Grove. A mystery alright, and one that perhaps our readers might help solve, thanks. 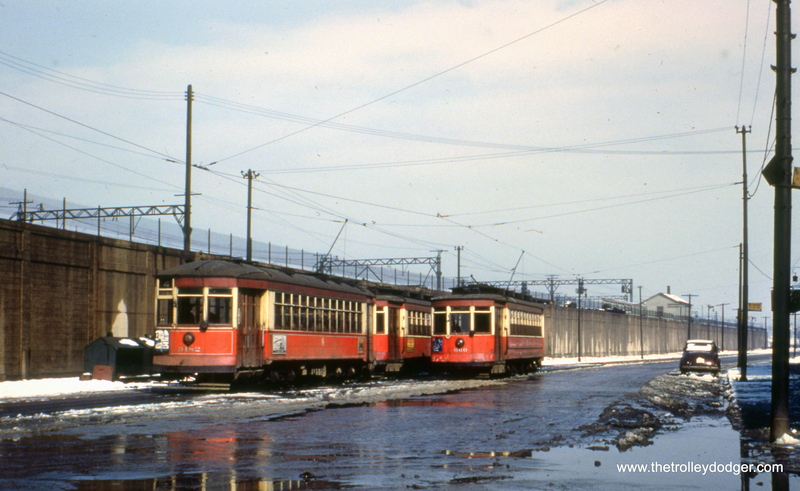 CTA red cars 612 and 407 at 95th and Ashland in December 1951. Ashland and 95th today, looking north. Here is what South Boulevard looks like today, at approximately the same spot. Here, we see CTA red Pullman 165 heading west on the private right-of-way portion of the 63rd Street route, a few blocks west of Central Avenue. The date is given as August 17, 1951, although some might argue for 1952 instead. These tracks ran in 63rd Place, which is now a completely built-up residential area a short distance south of 63rd Street. 63rd Place today. 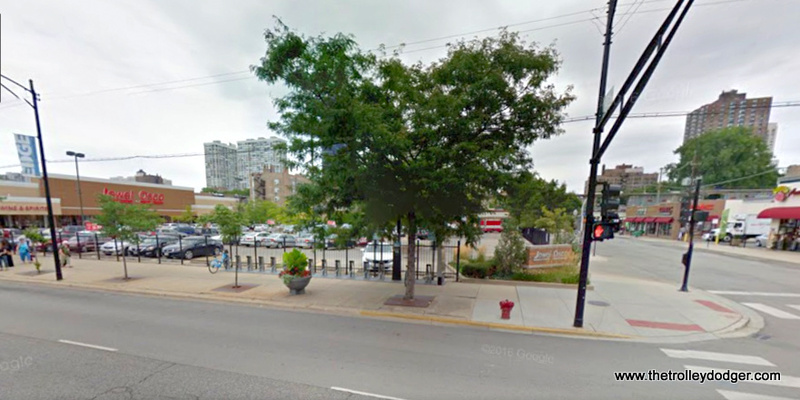 After streetcars quit, the CTA bus was re-routed onto 63rd Street in this area. Here, we are at Cottage Grove and 115th, the south end of route 4. CTA red cars 3182 and 660 are visible. The date given is December 1952, but some might argue for an earlier date than that since there are no PCCs in sight here. 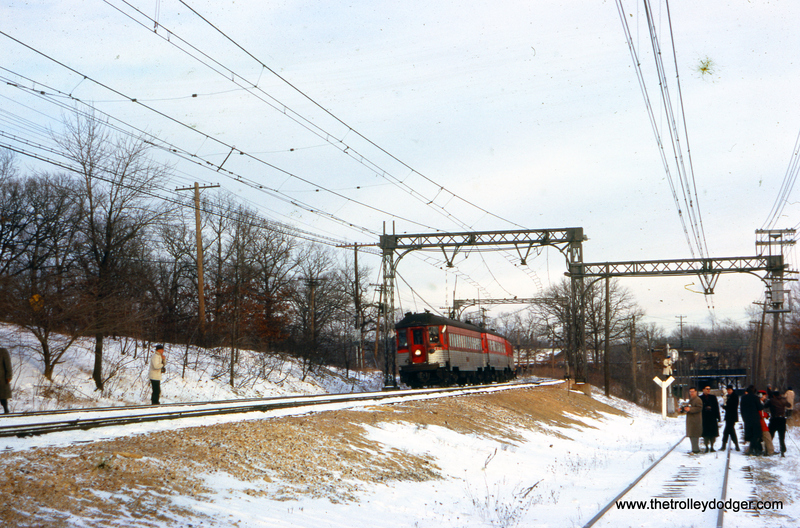 The line ran parallel to the Illinois Central Electric suburban service embankment. Cottage Grove and 115th today. 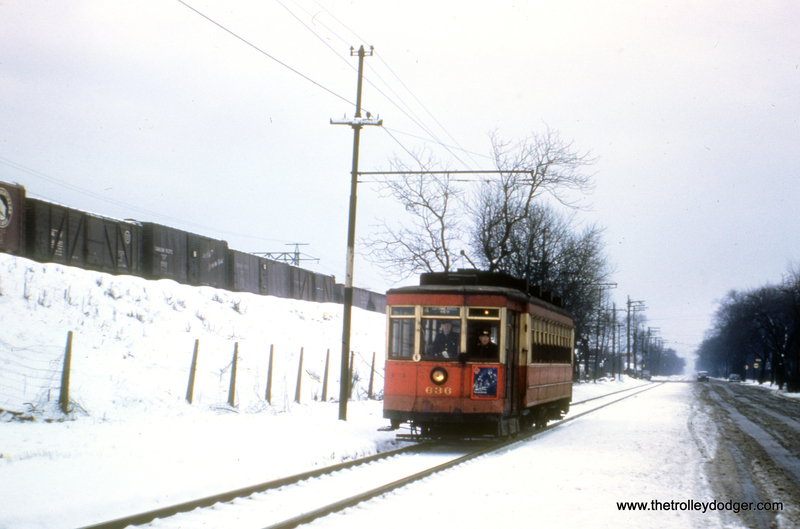 This wintry scene shows CTA red Pullman 636 on Cottage Grove near the 115th Street end of the line. The date is given as December 1952 but some might argue it should be earlier. 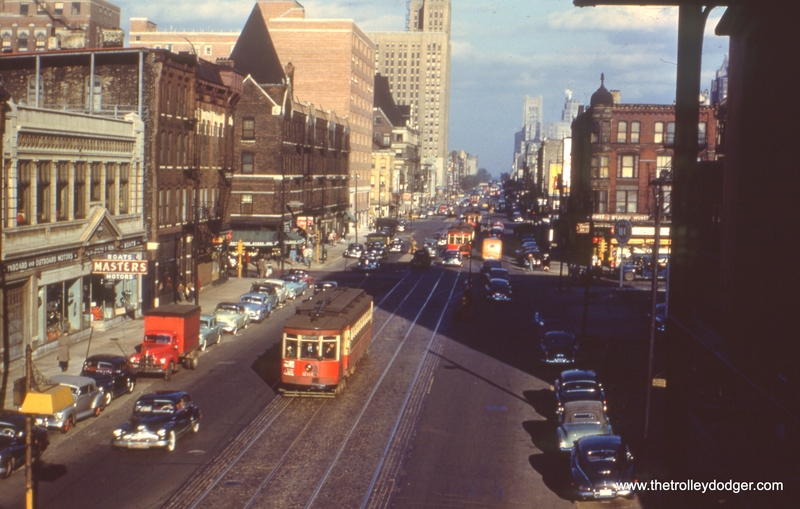 It’s June 10, 1951, and CTA red Pullman 230 is heading west on Chicago Avenue in this view taken from the Ravenswood “L”. A contemporary view of Chicago Avenue looking east from the “L”. 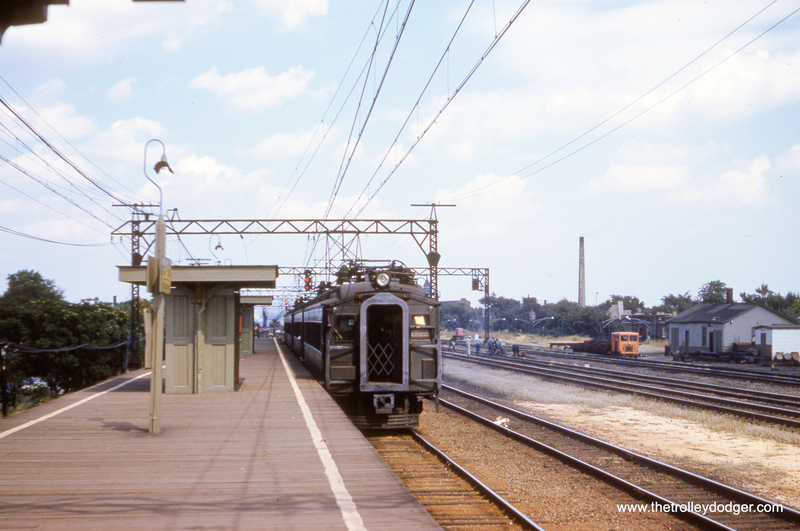 Here, CSL car 19xx is heading eastbound on Chicago Avenue, having passed the north-south “L” and a safety island. Chicago Avenue looking west toward the “L”. The J.L. Higgie building, at Ogden and Harrison, as it appears today. 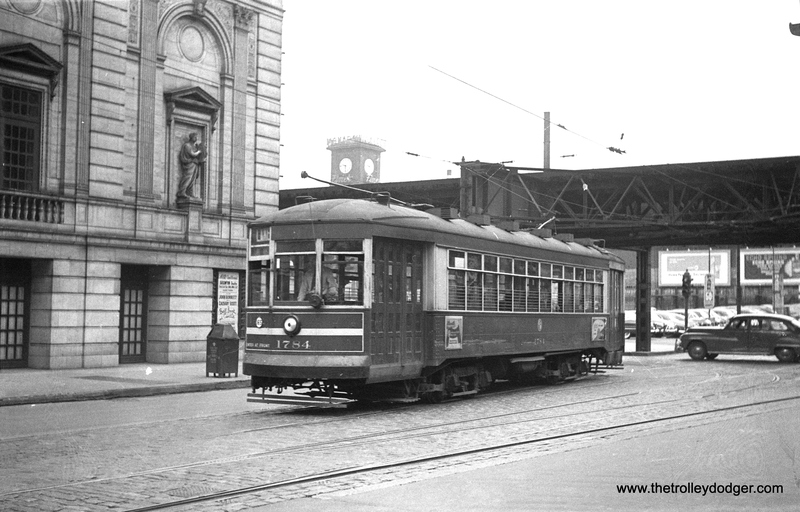 The old Market Street stub-end “L” terminal, which was used by Lake Street trains until the late 1940s. It was demolished shortly thereafter, and Market Street itself was turned into the north-south portion of Wacker Drive in the 1950s. CSL 1371, signed for Taylor-Sedgwick-Sheffield. The same corner today. Lincoln is to the left, Damen to the right, and Irving Park would be right behind us. We are looking north. 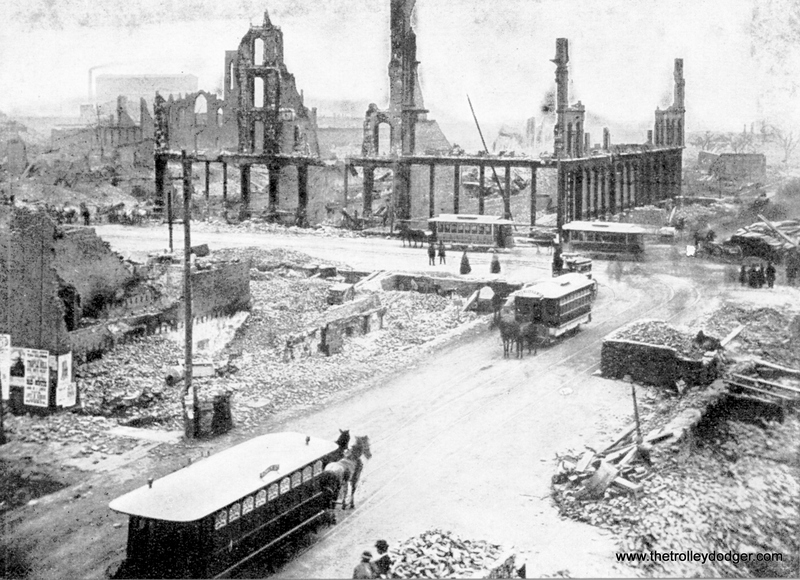 It’s October 1871, shortly after the Great Chicago Fire. The view is of State and Madison, looking northeast. 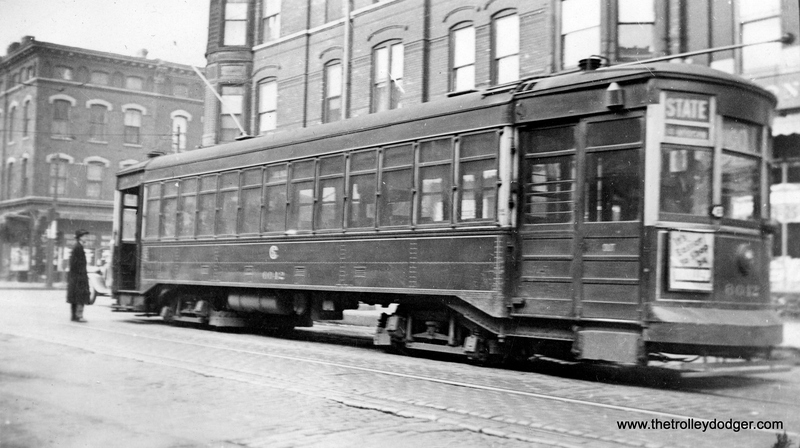 The various horse cars we see are serving the Madison, Blue Island, and State Street lines. The old Bowman Dairy building at 43rd and Root as it looks today. 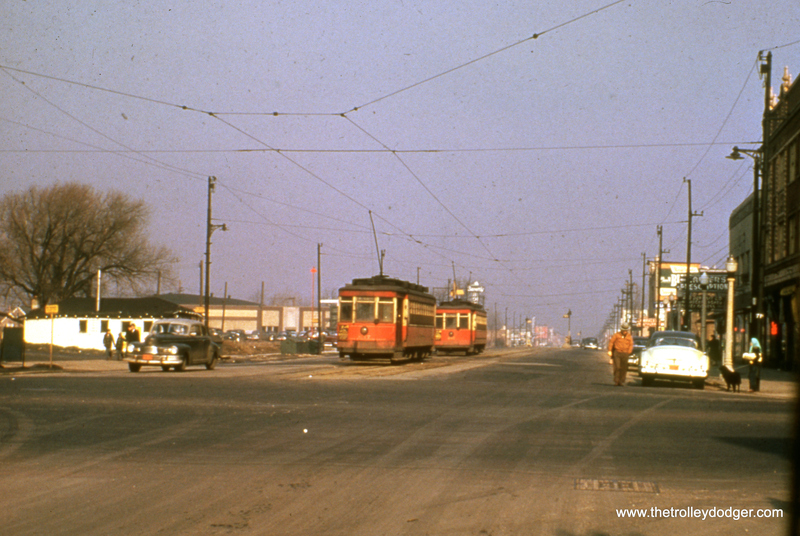 CTA trolley bus 9713 is shown heading westbound on North Avenue at Cicero on April 26, 1970. 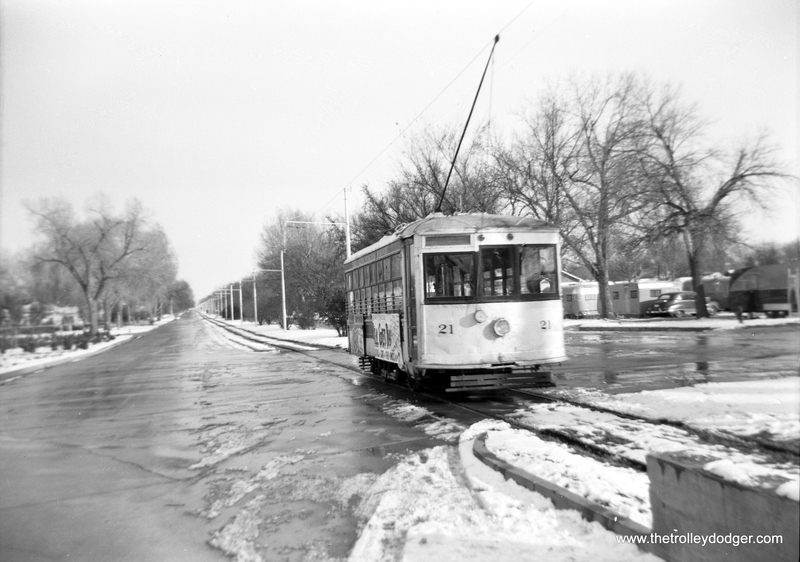 The last Chicago trolley bus ran in 1973. 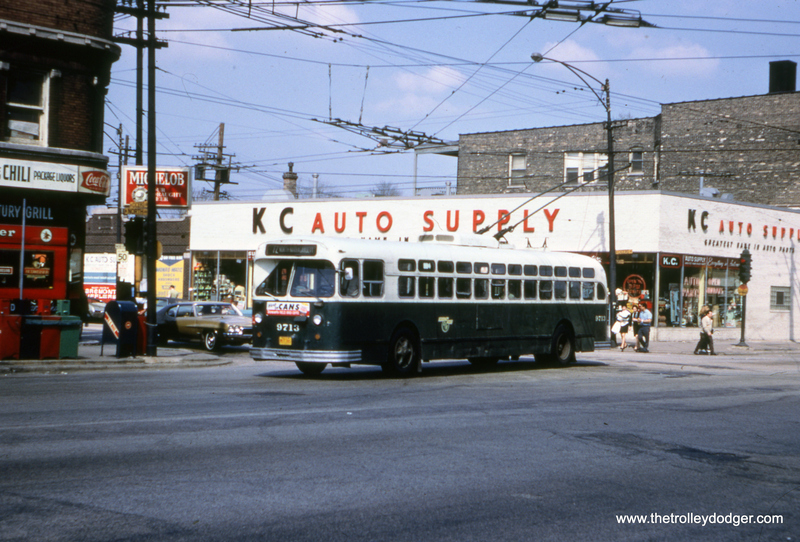 CTA Flxible propane bus 8050, shown here on Central Avenue near the end of its service life in 1971, was part of a series delivered in 1956-57. 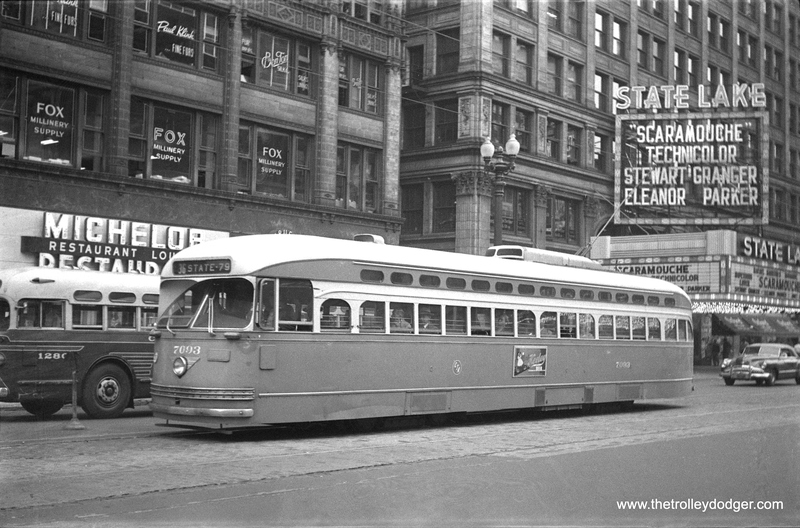 These buses replaced some of the last Chicago streetcars, but they were woefully underpowered for the job they had to do. I believe we are just south of Belmont Avenue. 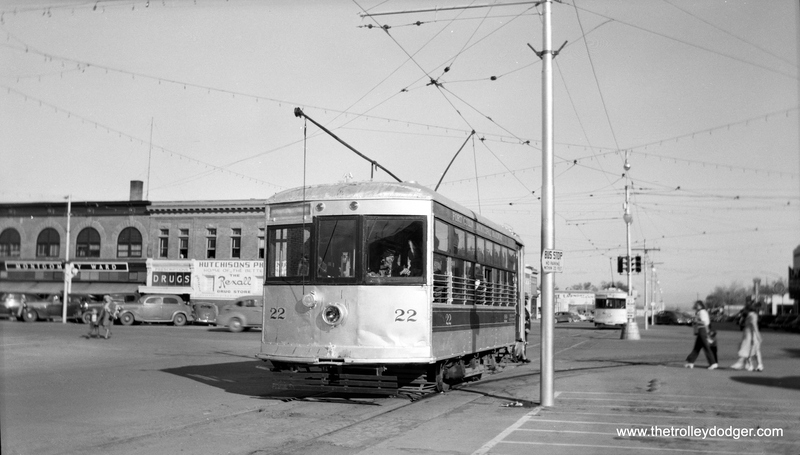 Trolley buses last ran on Central on January 7, 1970. The old street lamps were holdovers from an earlier era, and were retained in some shopping areas of the city for some time, even after more modern lights were installed. The same area today. We are looking south on Central Avenue, just south of Belmont. 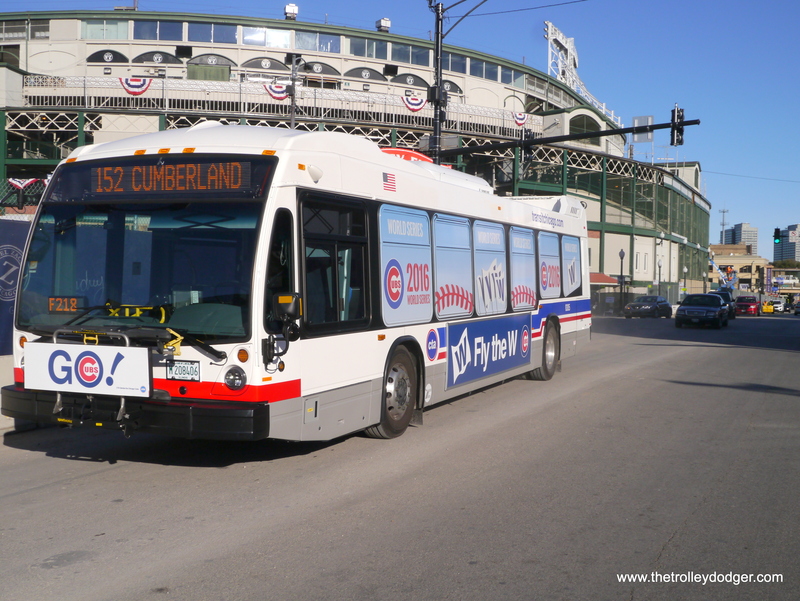 After the Chicago Cubs won their first world championship since 1908, the Chicago Transit Authority put a special “wrap” on one bus (I think the number is 8305) for a limited time, and ran it on Addison, which passes right by Wrigley Field. The following two pictures were taken there on November 9, 2016. 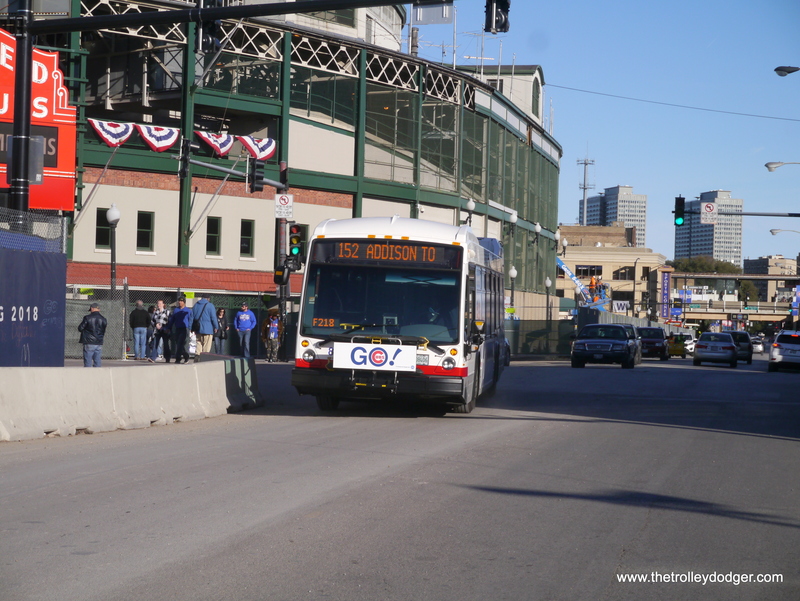 Here, 8305 heads west on Addison. There is a lot of construction around the ballpark these days, as entire blocks have been cleared, and a couple of large hotels are going up. I was lucky to get all of 8305 in the frame here, as it was “at speed” and I had to dodge traffic in the middle of the busy street to get this unobstructed shot. 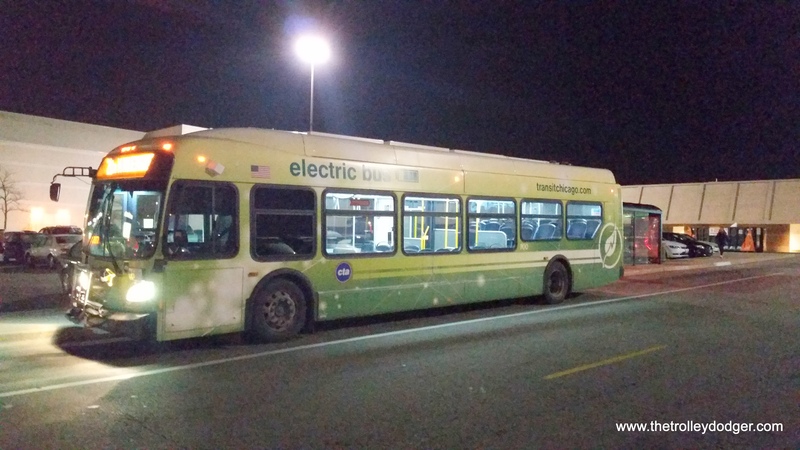 CTA bus 700 is powered by Lithium batteries, and is one of two currently owned by the authority, although there are plans for 20 or 30 more. These are the first electric buses the CTA has had since the last trolley bus ran in 1973. I did not board this bus, but would expect it to provide a ride similar to a trolley bus. 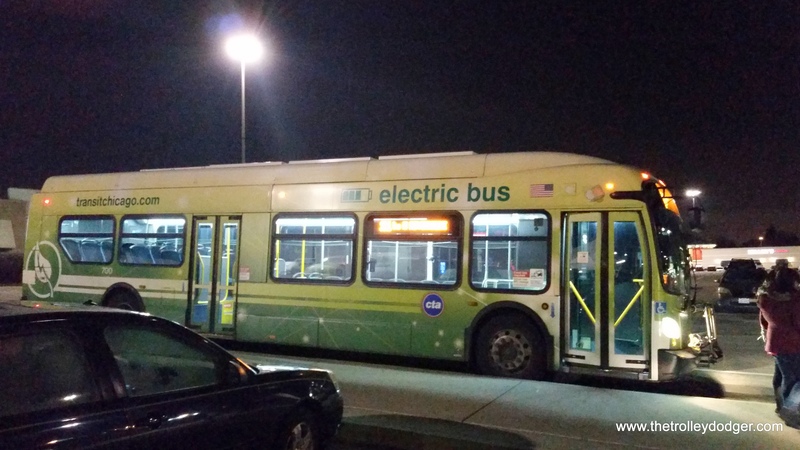 CTA electric bus 700 at the west end of route 21 (Cermak), which is the North Riverside Mall, on November 29, 2016. 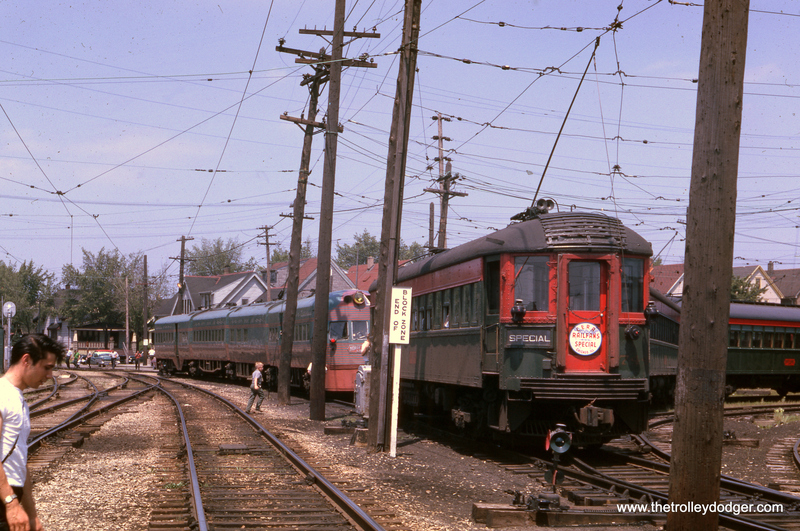 It’s June 1962 at Rondout, and we see a North Shore Line freight train, headed up by electric loco 455. 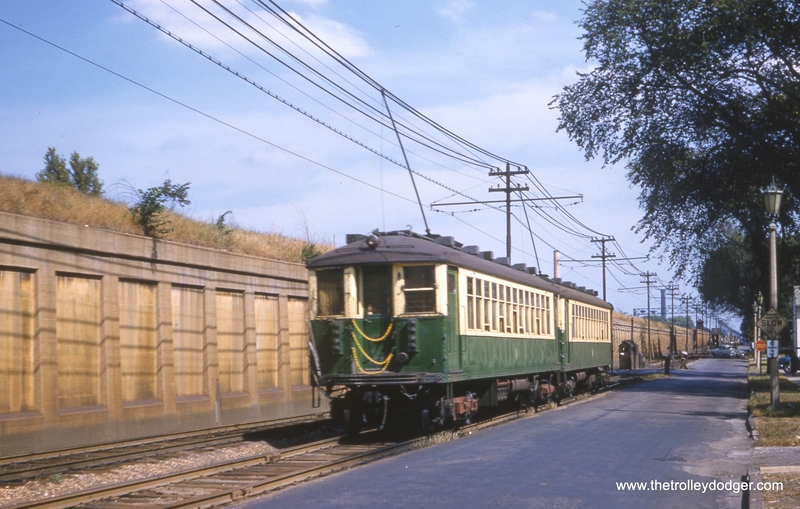 This June 1962 North Shore Line photo looks like it was taken at about the same time as one in our previous post More Color Restorations (August 9, 2016). As you can see from the sign on car 744, the occasion was a Central Electric Railfans’ Association fantrip. This may be the excursion on June 22, 1962, which was billed as a farewell trip. 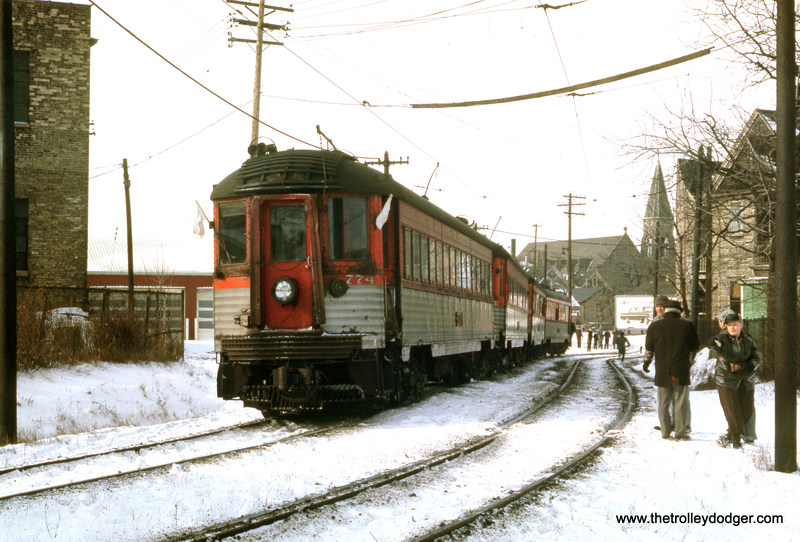 As it turned out, a few additional fantrips were held before the interurban was abandoned on January 21, 1963. Don’s Rail Photos says, “744 was built by Pullman in 1928. 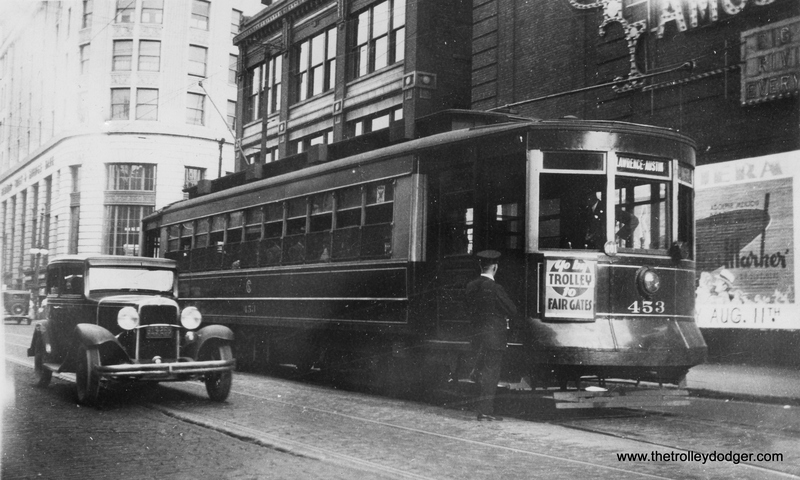 It was modernized in 1940.” This car is on the wye at the Harrison Street Shops in Milwaukee. 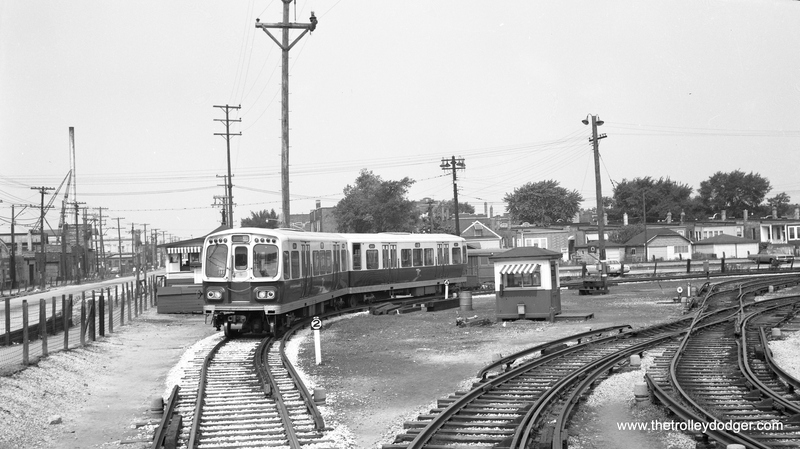 It’s April 1964, more than a year after North Shore Line service ended. 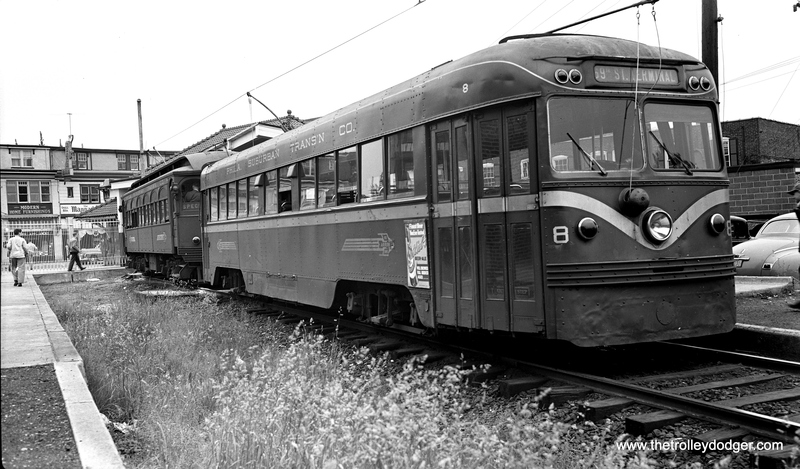 Car 251 is at the head of the line here, and has already been sold to the Illinois Railway Museum, where she runs today. This may also be a J. W. Vigrass photo, but it is not marked as such. A close-up of the last picture shows a sign: “Acq’d for Ill. Ry. Museum. 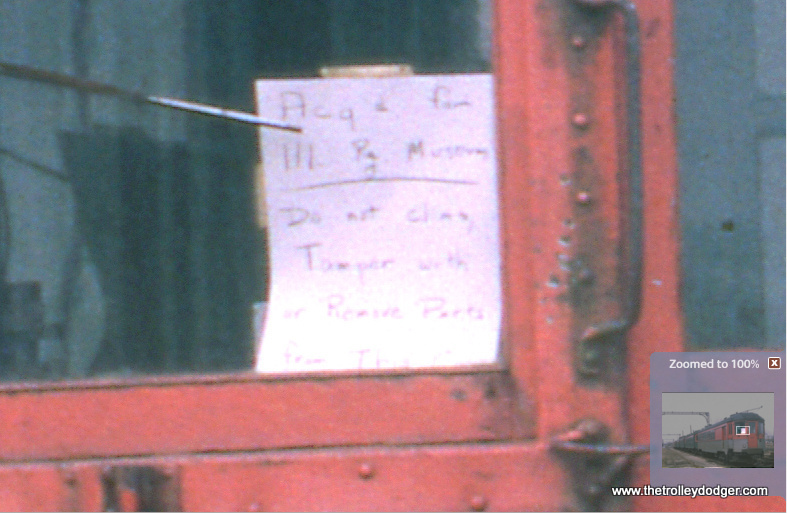 Do not climb, tamper with, or remove parts from this car.” Sound advice, indeed! 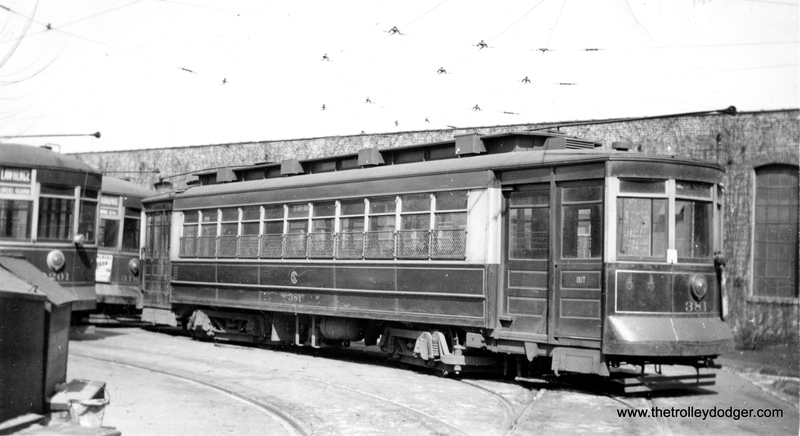 I am trying to research the history of the design (industrial design or “styling”) of the PCC streetcars. Over the years, two different people have independently indicated to me that industrial designer Donald R. Dohner was responsible for the design of the PCC, but I have been unable to verify it. Dohner was the head of design for Westinghouse Electric and Manufacturing Company from 1930 through 1934 and would work on many transportation designs while employed there. He also had an industrial design firm in Pittsburgh after leaving Westinghouse. Dohner was the unrecognized primary designer of the Pennsylvania Railroad’s iconic GG-1 electric locomotive for which Raymond Loewy got (or should I say, “took”) full credit. For years, retired industrial designers that I met told me that Dohner designed the GG-1 despite what Loewy claimed, and after doing some serious in depth research I was finally able to prove they were right (Loewy made some very minor changes to the GG-1 prior to manufacturing, but would take credit for much, much more than he actually did). Dohner never received credit for the design during his lifetime, and only began to receive recognition for it for the first time 75 years later after the fact, thanks to an article I wrote on the matter for Classic Trains magazine in 2009. A couple of years ago I was also able to verify that Dohner designed the New Haven Comet Train with the Goodyear Zeppelin Corporation, his having worked heavily on the design in 1933. He never received credit for the design of this train either. 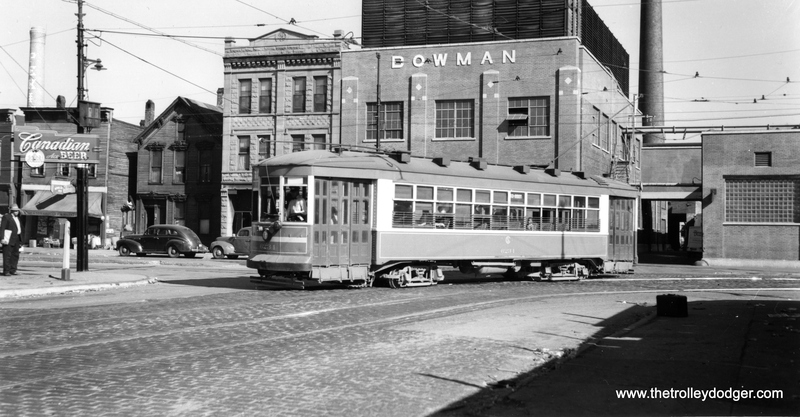 Neither of the two individuals who credited Dohner with the PCC design knew the name of the streetcar, but both stated that it was a design that was used universally all over the country. One of the men also stated that the cars were in Brooklyn first and then “all over.” That suggests the PCC to me, but I do not know where to begin to research it. Do you happen to know if any of the original paperwork for the Presidents Conference Committee exists for researchers? If so, I would love visit the archives and take a close look and see if Dohner’s name appears anywhere in the record as it did in Pennsylvania Railroad paperwork found during my research on the GG-1. It also occurred to me that Dohner could have been involved in the design of the experimental CSL 4001 car, which was developed with Westinghouse. Do you happen to know if there is any documentation on the development of this unit? Any guidance you can give me would be greatly appreciated, and I look forward to your response. 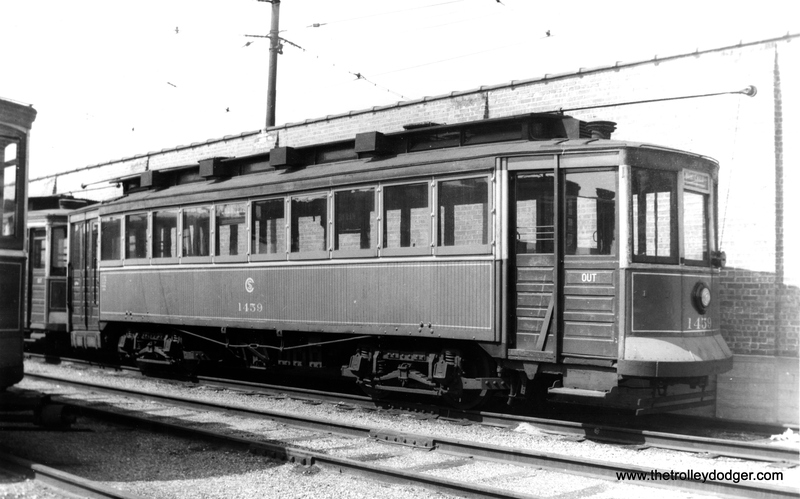 Starting in 1929, CSL* was a very active participant in the Electric Railway Presidents’ Conference Committee, whose work developed the standardized PCC car, which soon dominated the industry. TRC’s successor, in turn, was the Institute for Rapid Transit, which merged with the American Public Transit Association, and is now called the American Public Transportation Association. So, you might try contacting them to see what they may know. Dr. Cox is, as far as I know, still living, so you might try contacting him as well. However, according to this news story from 2015, Dr. Cox is fighting a courageous public battle with Alzheimer’s. It may be that a lot of the familiar PCC design “look” came from each individual car manufacturer, building on previous work done by others. 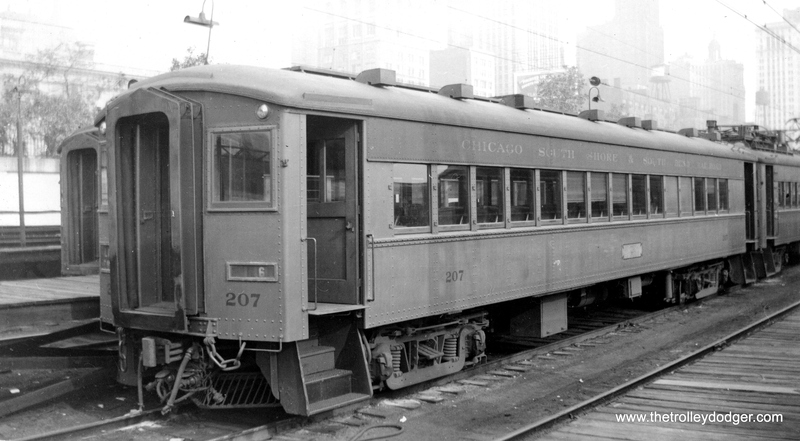 The progression would be from the 1934 Brill car 7001, built for the Chicago Surface Lines, to the very similar cars built for Washington, D.C. in 1935 (the order split between Brill and St. Louis Car Company), to the 1936 PCCs from SLCC (Brooklyn, Chicago, et al) and the one car built by the Clark Equipment Co. (which has standee windows, not seen on many cars prior to the end of WWII). The efforts from various manufacturers to develop a “type car” preceded the PCC effort, as can be seen in the Brill “Master Units” circa 1932. But these efforts were never 100% successful, although the PCC car did come the closest. Still, there were numerous variations between cities, Chicago’s being the most different of them all. 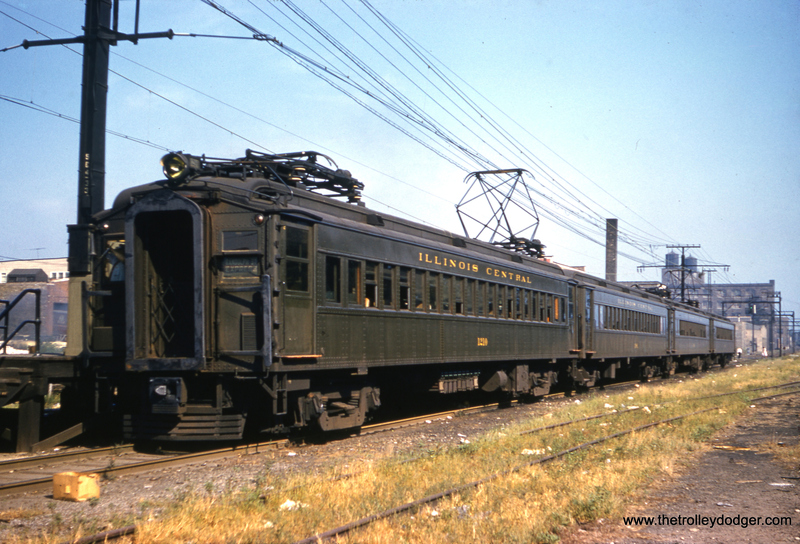 Even after the concept of a “standard” PCC car became the norm for North American cities, the PCCs made by SLCC competitor Pullman have subtle differences in styling, including a somewhat boxier overall appearance. This may have been the result of differences in manufacturing techniques between the two companies. 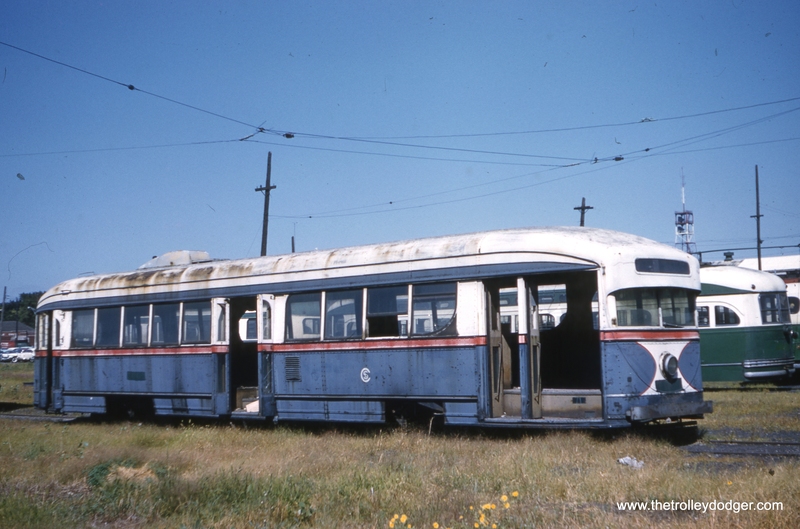 So, chances are the styling of the PCC cars cannot be ascribed to a single individual, but it is certainly possible that one person, such as your candidate, may have played a very important part. There is also a complicating factor regarding Brill. While Brill built the CSL 7001, and part of the 1935 order for DC, the company had a policy of not paying any patent royalties to other firms. Thus, they parted ways with the PCC project at this point. However, they did come up with their own PCC knock-off, which was called the Brilliner. They first started marketing these in 1938, and the last ones were sold in 1941. Very few were sold. The Brilliner came too late to save Brill. 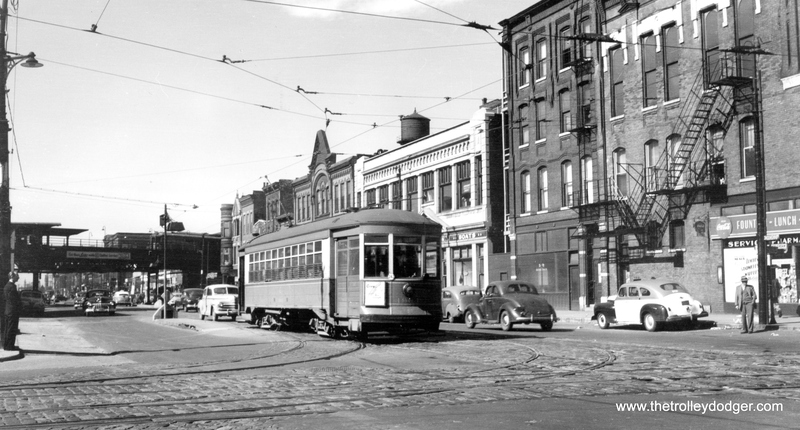 By then, St. Louis Car Company had the bulk of the streetcar market to themselves, with Pullman taking a much smaller share. 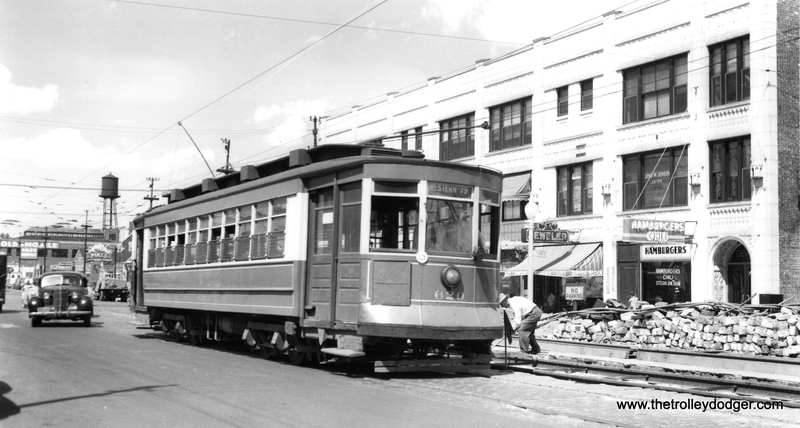 Brill exited the streetcar market at this point, and merged with ACF in 1944 to form ACF-Brill. 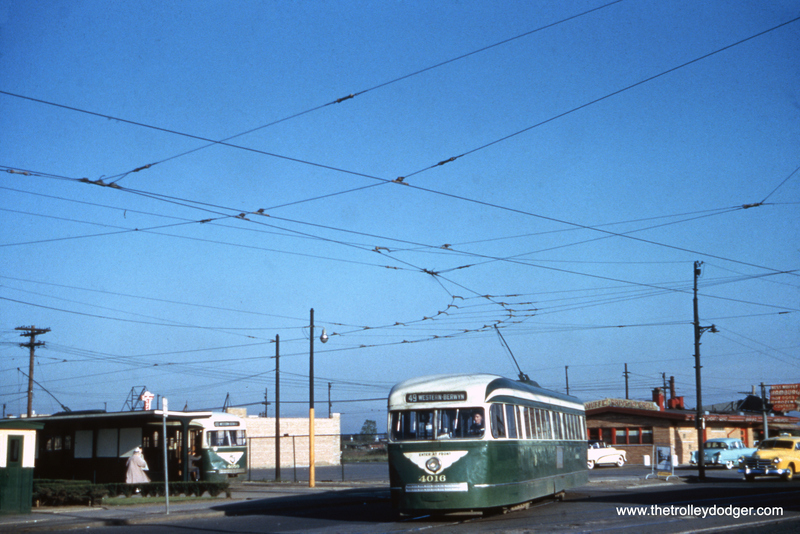 They made buses, including some trolley buses. I hope other people who read this may be able to offer additional insights of their own. I am assuming you are familiar with the available literature, which includes various books such as PCC From Coast to Coast. There is at least one book about the St. Louis Car Company, written by the late Alan R. Lind. Some of the other PCC books, which you might find for cheap or in public libraries, include PCC: The Car That Fought Back, An American Original: The PCC Car, and Dr. Cox’s PCC Cars of North America. John Edward Maeder’s 1925 high school yearbook picture. Hawken School is located in Cleveland, Ohio, and was founded in 1915. We have written about the short-lived and ill-fated Speedrail project before. 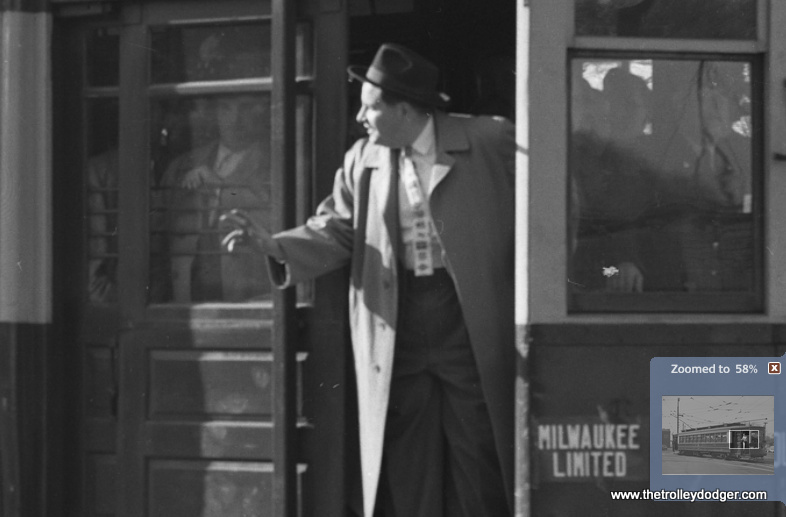 This was a 1949-51 attempt to continue interurban service between Milwaukee and Waukesha, Wisconsin, led by Jay Maeder, Sr. (1908-1975). This was a noble effort. 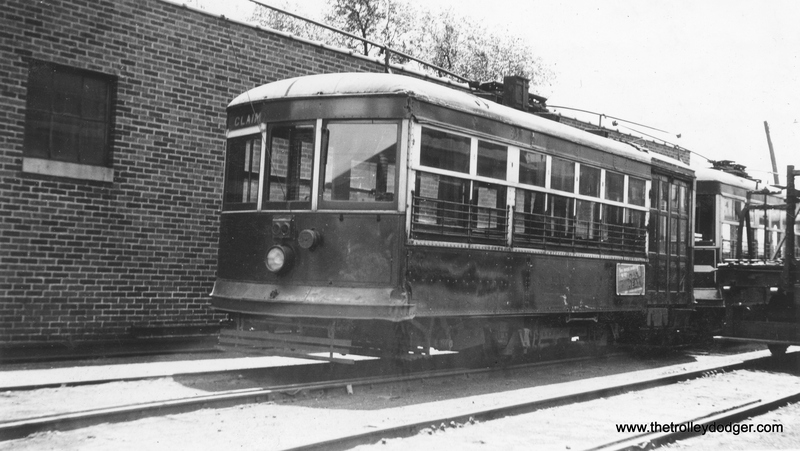 Maeder grew up in Cleveland, Ohio, where a former interurban still runs today as the Shaker Heights Rapid Transit line. 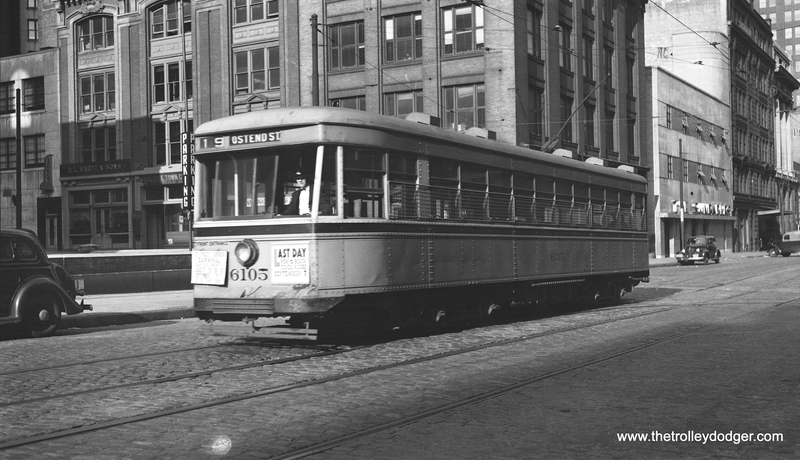 Milwaukee’s TMER&L (aka TMER&T) west line was known locally as the “Rapid Transit” line, and with a little less bad luck, could have evolved into something akin to what Cleveland has today. But alas, it was not to be, due to a horrific head-on collision in 1950 that killed several people. His real name was John Edward Maeder. Jay was a nickname. In the 1930 census, the family was living in South Euclid, Ohio. In a 1949 newspaper article, regarding the Speedrail purchase, Maeder is referred to as a “Cleveland industrial engineer.” Apparently, he was an efficiency expert. “Jay” probably was a nickname based on his first initial. Perhaps, like many other people, he did not like his first name (cf. James Paul McCartney). At that time, John Edward Maeder was nicknamed “Ed,” which is how they had him in some of the census records. Apparently, he did not like his first name. John Edward Maeder’s birth certificate gives the same date of birth as that given for Jay Edward Maeder (March 11, 1908). The 1910 US census says there was a two-year-old child named Edward in the household, but does not mention other siblings. Since his father’s name was also John, that may be why they were calling him Edward from an early age. The 1920 census has him as J. Edward, but again mentions no siblings. In the 1930 census, they have him as Edward J., but again there are no siblings listed. He was 22 years old then, and his occupation is listed as a newspaper solicitor (salesman?). So, everything seems to indicate he was an only child. Haven’t found an obit for Jay Maeder Sr. yet though. Jay Maeder Sr.’s wife Catherine died in Houston, Texas in 2009, aged about 99. I don’t know if Jay Maeder Sr. ever lived in Texas, or if, sometime after the 1950 crash, he reverted to using John, his real name. His son, Jay Maeder, Jr. lived from 1947 to 2014, and was the last writer for the Little Orphan Annie cartoon strip before it was retired in 2010. If Speedrail had survived, it surely would have received a shot in the arm from the opening of County Stadium along its route in 1953. The Boston Braves moved to Milwaukee that year, and had good attendance for several years before moving to Atlanta in 1965. The Braves were in the World Series two years running (1957-58), winning the world championship in 1957 over the New York Yankees. This is our 168th post, and we are gradually creating a body of work and an online resource for the benefit of all railfans, everywhere. To date, we have received over 224,000 page views, for which we are very grateful.